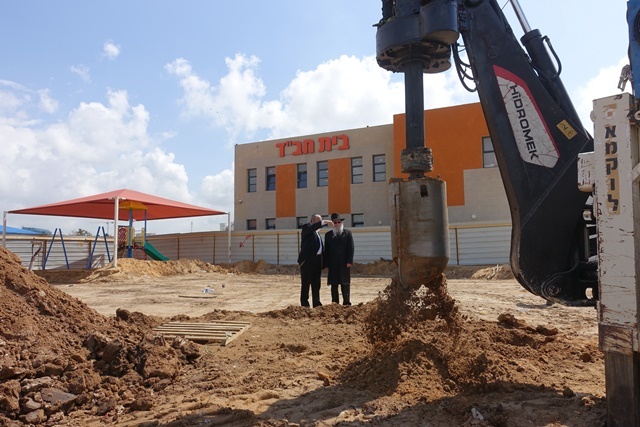 Thank G-D the building has gotten underway. 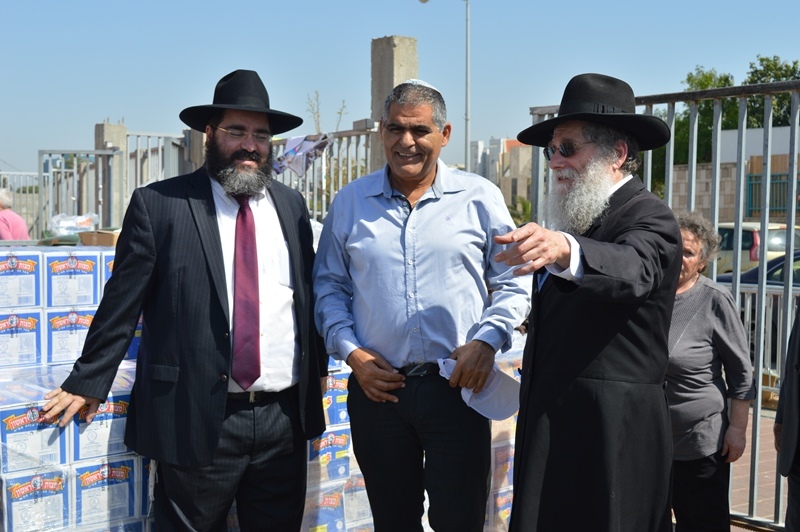 The Vice Mayor of Ashkelon Mr. Efi Mor and the City Controller Mr. Chaim Sofer - sold the Chametz of the City to Rabbi M. Lieberman - after the sale. 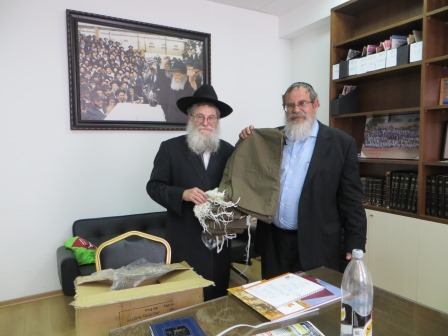 Rabbi Lieberman presented the distinguished guests a gift of specially baked Shmura Matzot for the upcoming Pesach Holiday celebration. 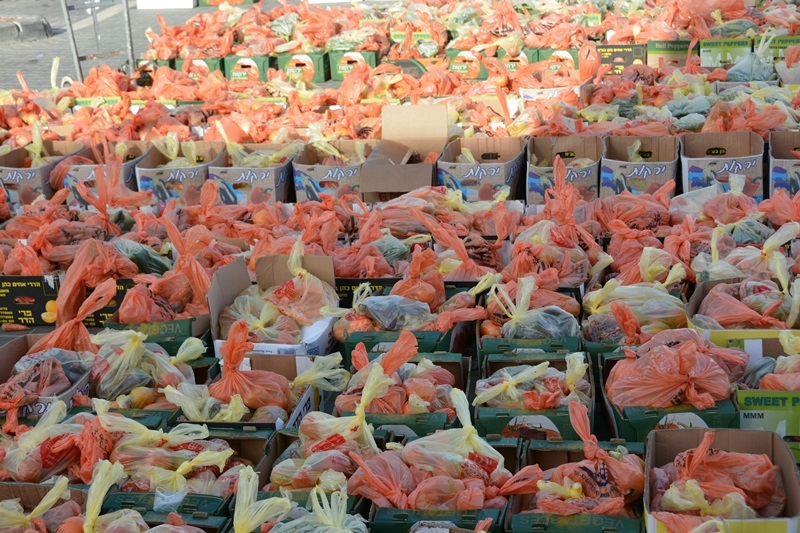 Watch 2 days of packing and distributing food packages in 2 minutes. 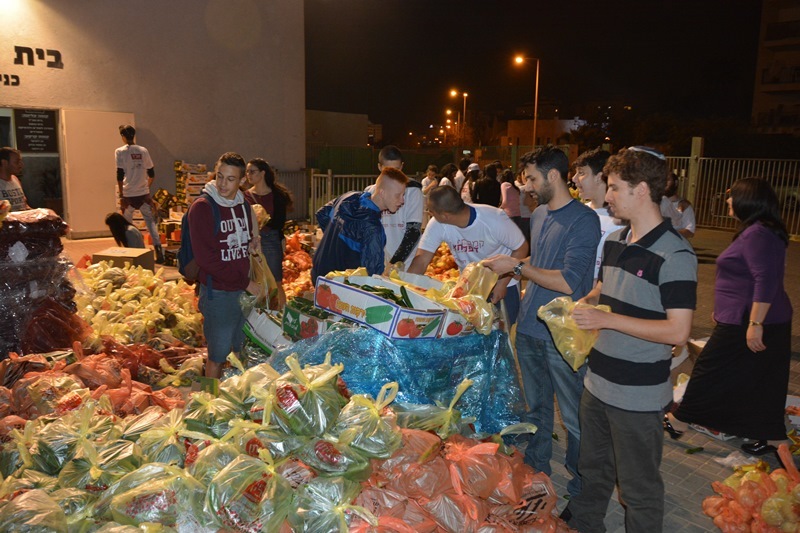 The Time Lapse Video is of two days of hard work with over 200 volunteers and staff packing and distributing the food packages to some of the neediest families in Ashkelon. 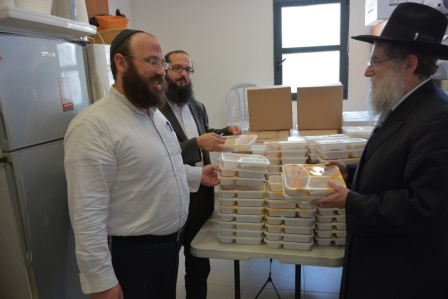 Our mandate is to see that every child will be seated at the Seder Night with a Hearty and Delicious Festive Meal, and that every family is provided for. 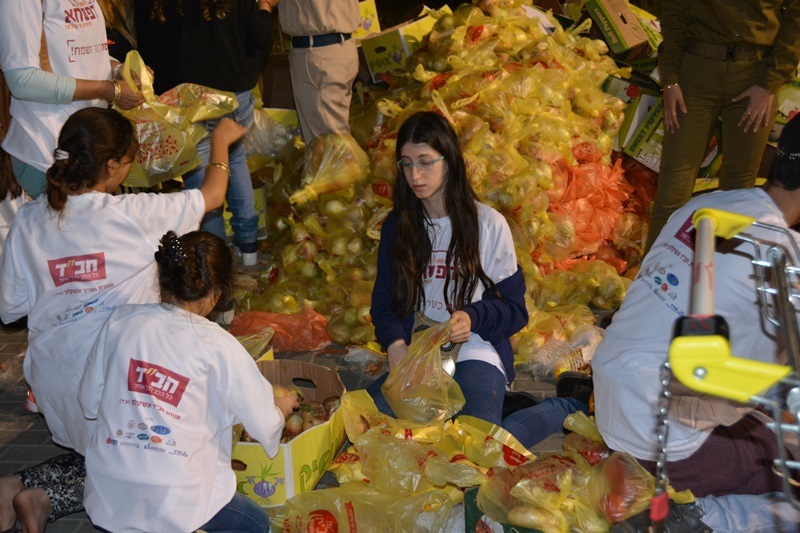 The enthusiasm and excitement of the volunteers was infections and together packed thousands of bags of fruit and vegetables, packed the boxes of Matzoth, wine, sweets and foodstuff, arranged the shipments – and ensured that the distribution went smoothly. 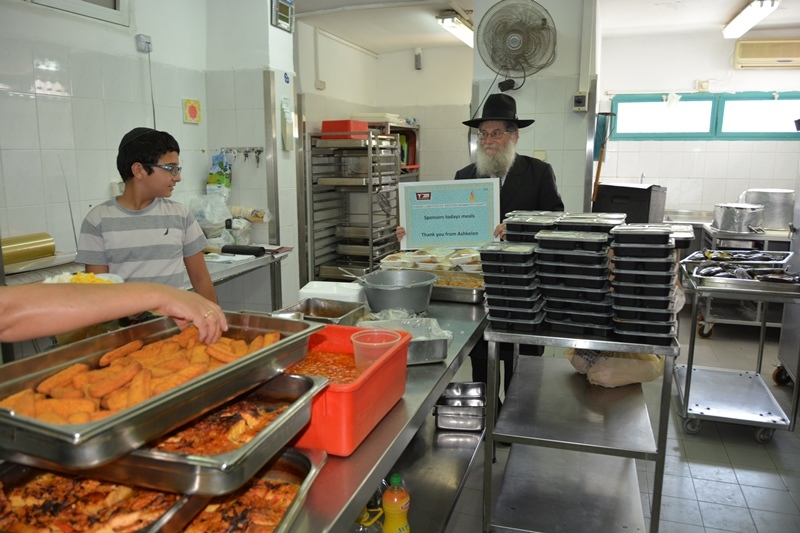 Thank you for enabling all the children and families enjoy a very Happy Pesach Holiday. In preparation for the next round of fighting. 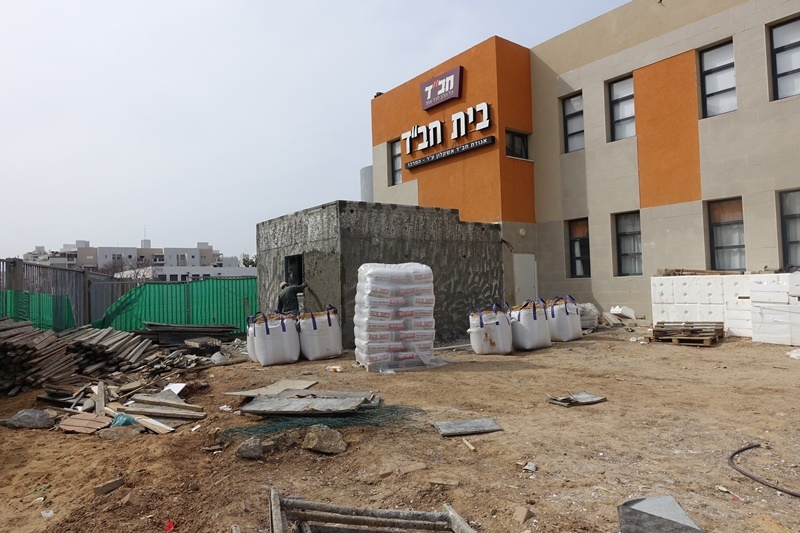 Chai Ashkelon built two bomb shelters for some of the kindergarten children. 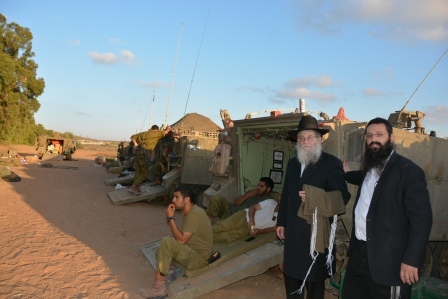 In the prevalent security situation – at any moment Hamas Rockets may rain upon the city _ with A 25 second advance notice. 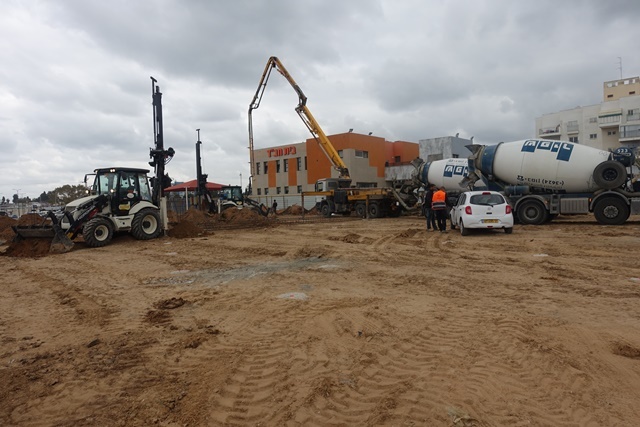 It is for this reason that Chai Ashkelon plans to build 5 new bomb shelters in the first phase and an additional 7 shelters thereafter. 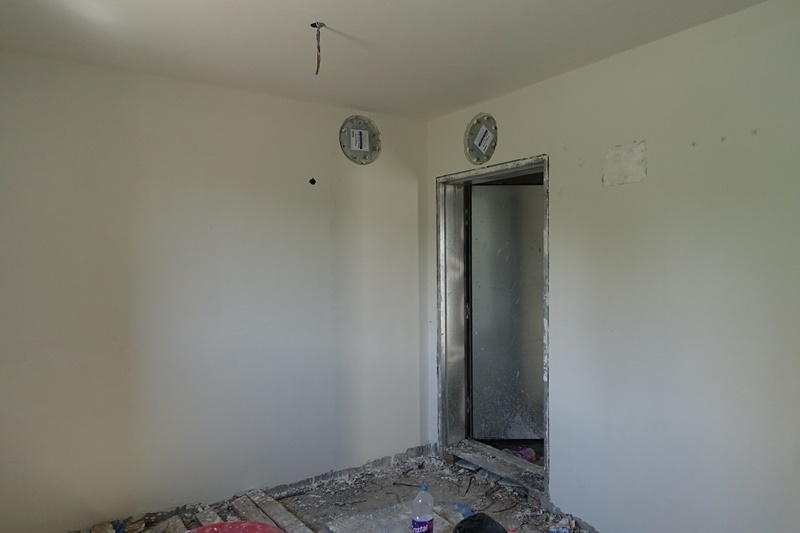 The first two shelters are nearing completion at a cost of $50,000. We all hope and pray that they will not be needed. 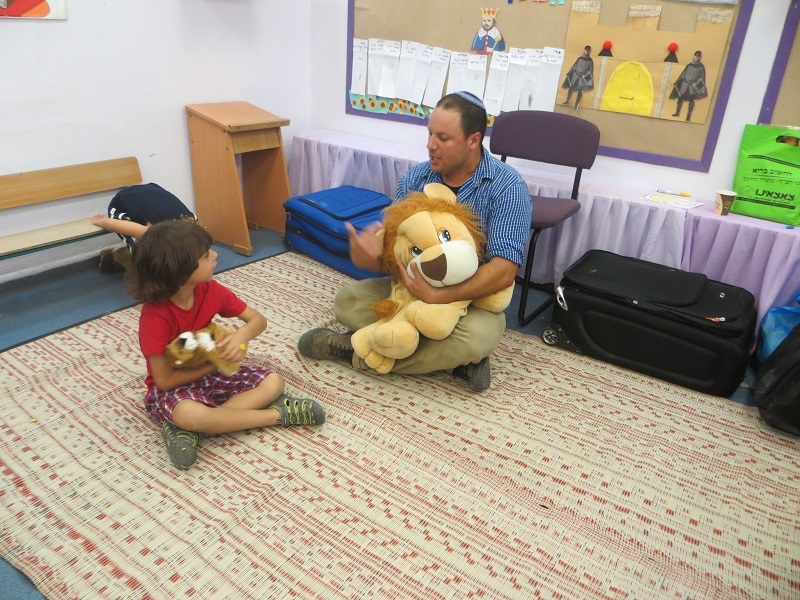 A gift of 25 Lions were presented to the Children of Ashkelon as part of the ongoing Trauma Therapy program that is directed by Chai Ashkelon. 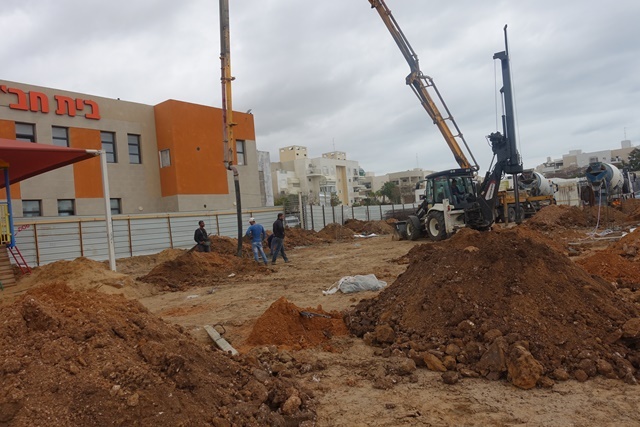 It is estimated that about 3600 children in the Ashkelon area are still traumatized as a result of the fighting this past summer. 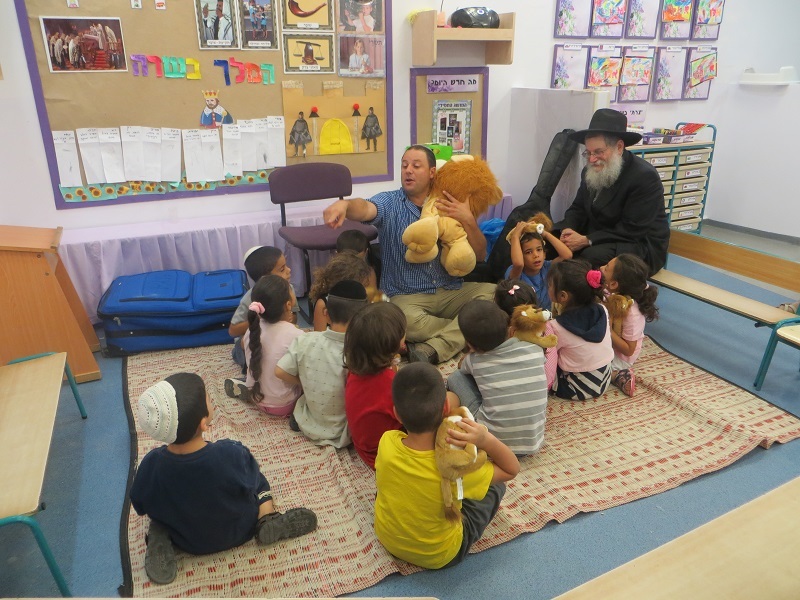 As part of the rehabilitation program to help these children a gift of a lion was presented to each child by a representative of the Baltimore Jewish Community. What an Event ! ! ! 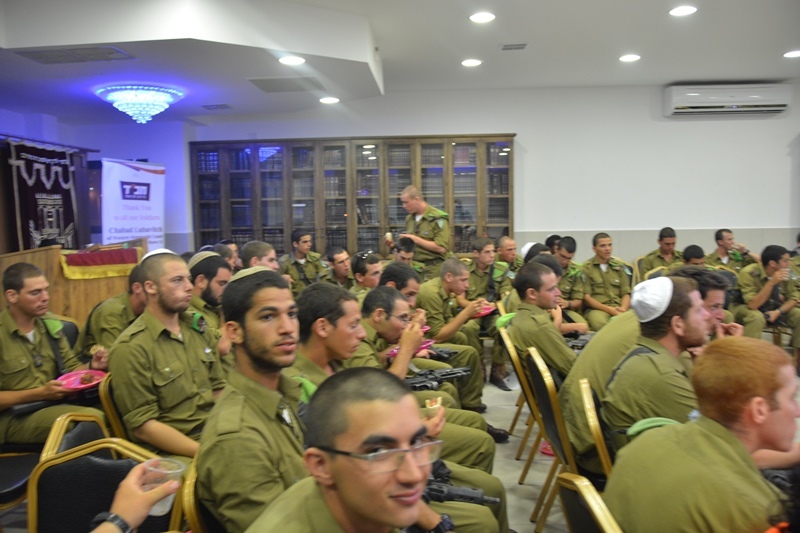 Dozens of combat soldiers of the IDF’s recent Operation Protective Edge in Gaza participated in a Gala Party hosted by Chai in Ashkelon. 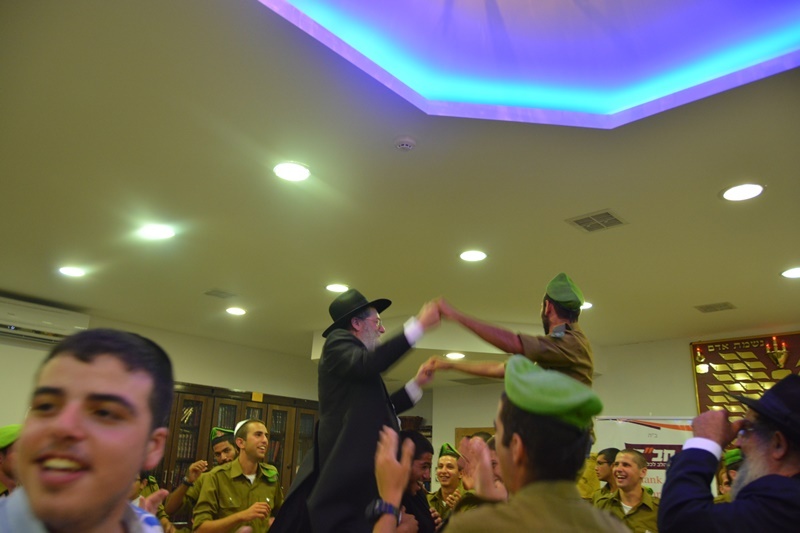 An elaborate barbeque was followed by cold Ices and hot dancing with the soldiers and the Chai Rabbi’s all joining in the energetic dancing. 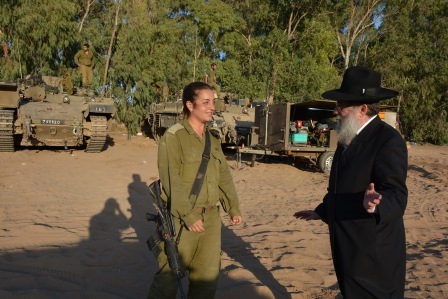 Rabbi Mendel Lieberman, addressed the soldiers and expressed the Thank You on behalf all the residents of the city – that finally we have some Peace and Quiet. 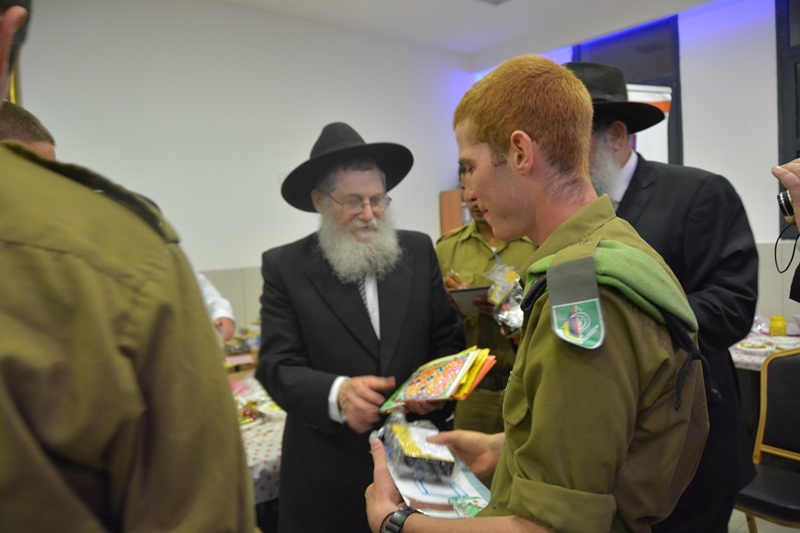 He shared with the soldiers how the Lubavitcher Rebbe would dedicated a Hakofe on Simchat Torah to Soldiers who served in the IDF. 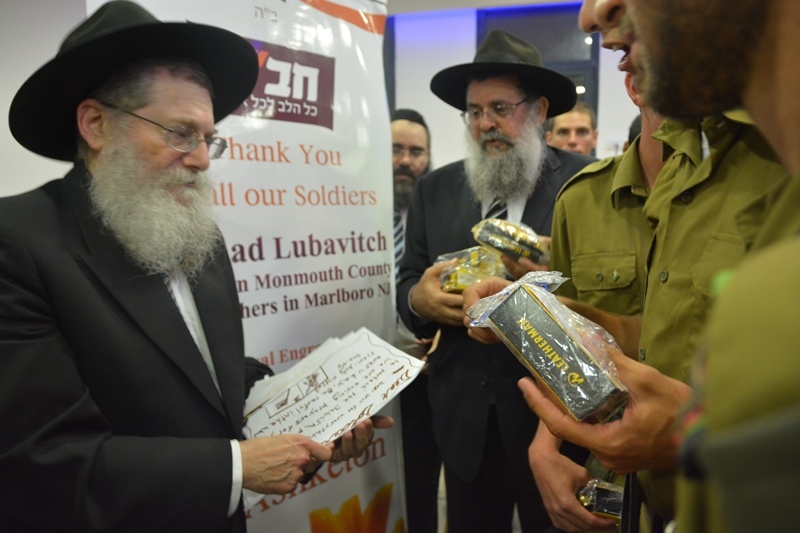 Each Lederman was engraved by Royal Engraving from Crown Heights – “From Chabad with Love” and then repacked with a private letter of thanks and some sweets from the children of Marlboro Township NJ, Phoenix AZ, Boston MS and Santa Fe NM. 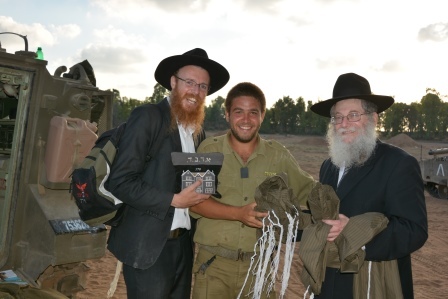 The excitement and appreciation that the sacrifice of the soldiers was recognized by fellow Jews throughout the World electrified the atmosphere of the evening. 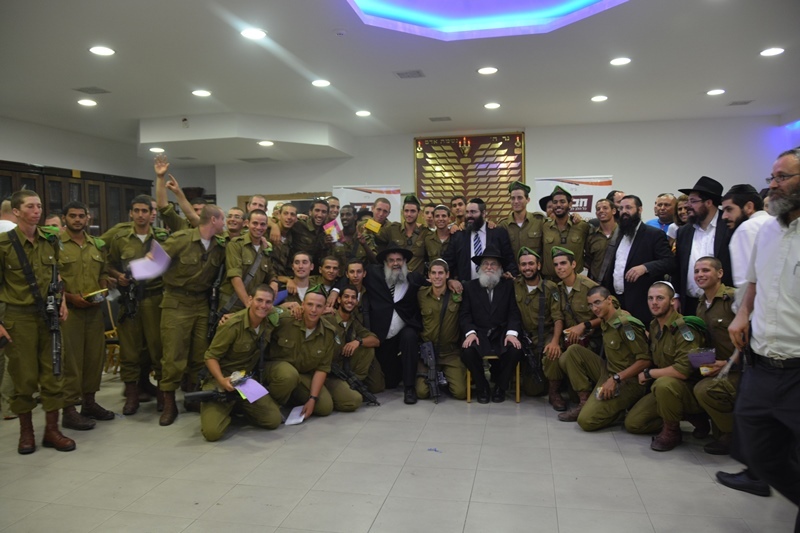 On behalf of the soldiers Rabbi Lieberman and the entire Chai staff would like to thank everyone who made this memorable evening possible. 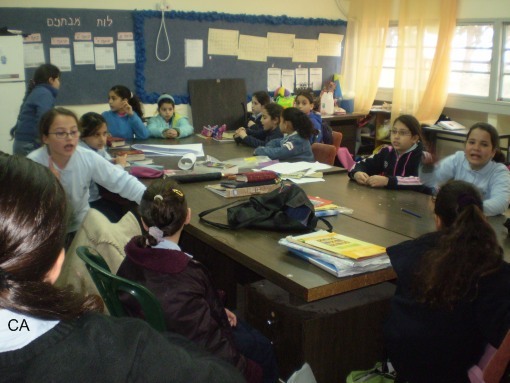 Ashkelon school year started under the shadow of numerous rocket attacks, and fears of what the future has in store. 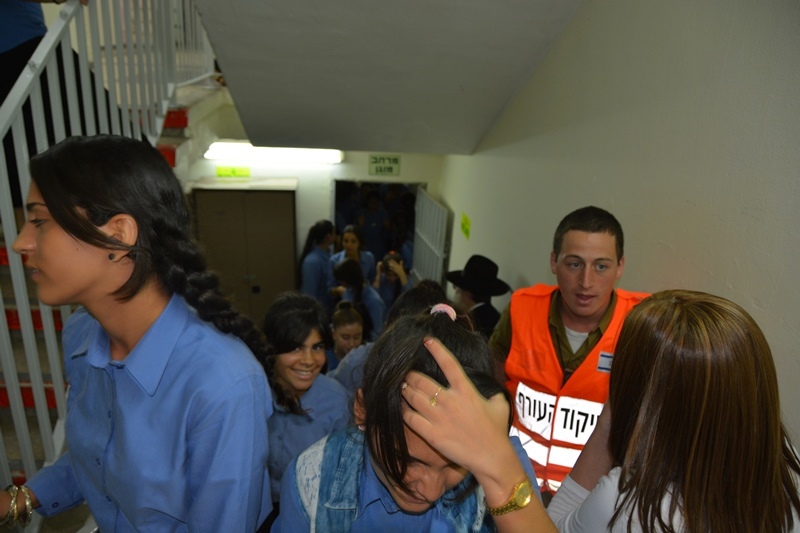 A large part of the first day of school was dedicated to emergency drills in the case of missile attacks. The schools staff and children practiced repeatedly to ensure that everyone reached the protected areas within 25 seconds. After much practice the goal was reached. 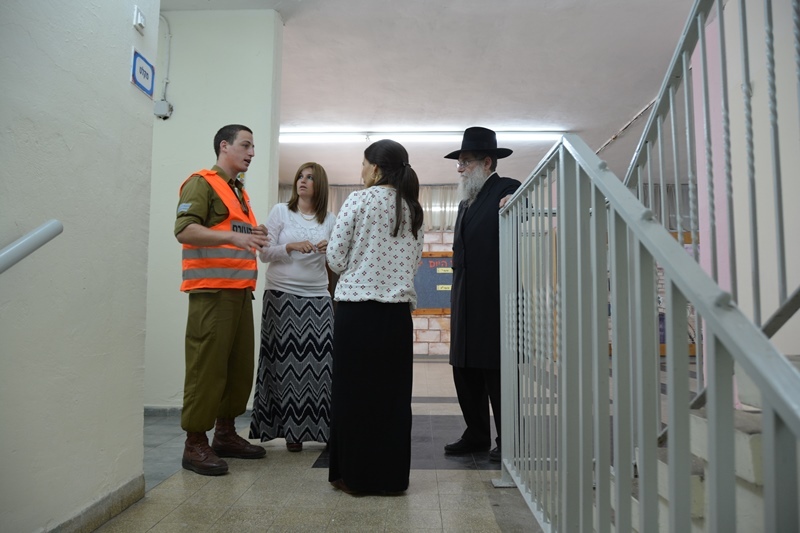 The School year started with a minimal amount of complication in spite of the fact that there were many obstacles getting everything ready as a result of the security situation. 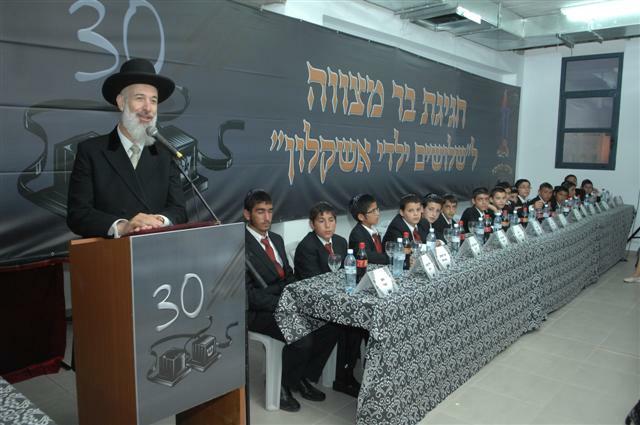 Thank G-D there has been considerable growth in the number of children studying in the Chai Schools, with the student body numbering about 1650 children this coming school year. 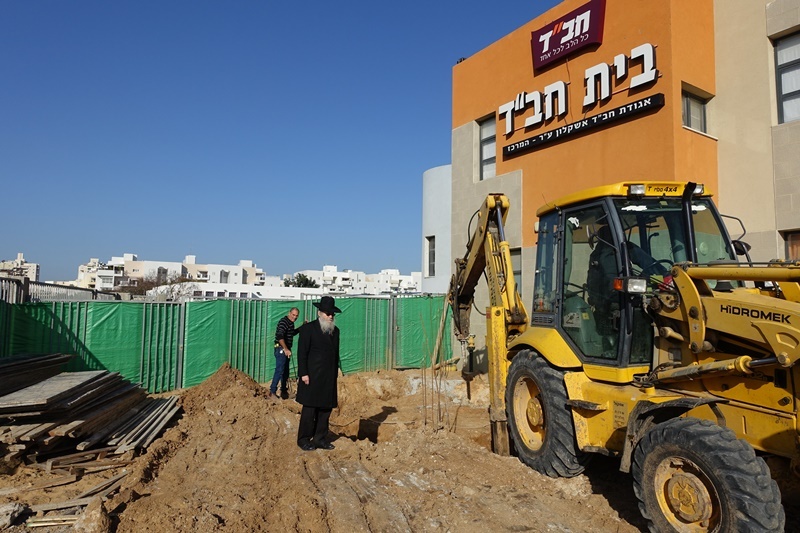 Much damage and destruction was caused to the homes of Rabbi S. Gruzman and Rabbi Shneur Lieberman of Ashkelon this morning. 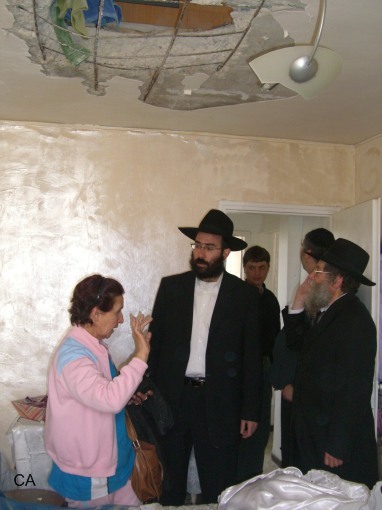 A Rocket fell a few meters from Rabbi Shmuel Gruzman, CEO of Chabad institutions, caused extensive damage throughout the house. 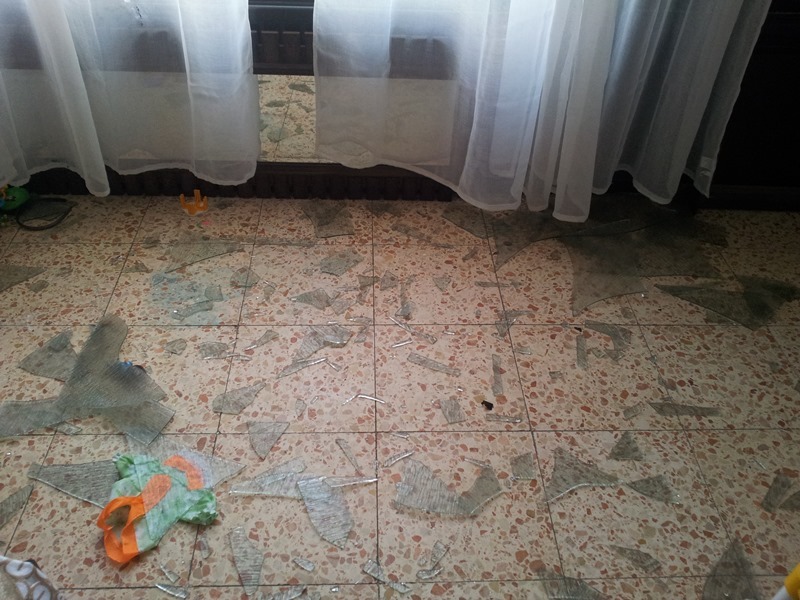 All the windows of the house were smattered with only one window remaining intact. 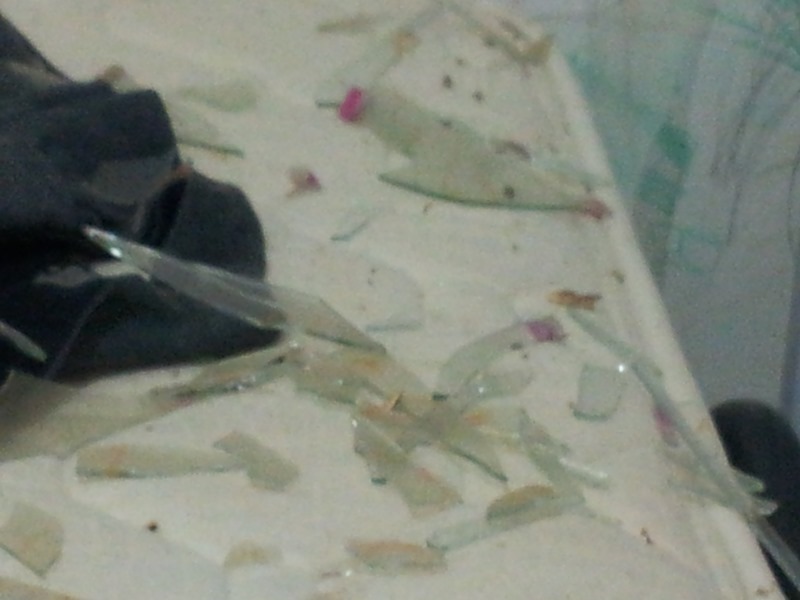 Glass and shrapnel were scattered throughout the house and caused extensive property damage. 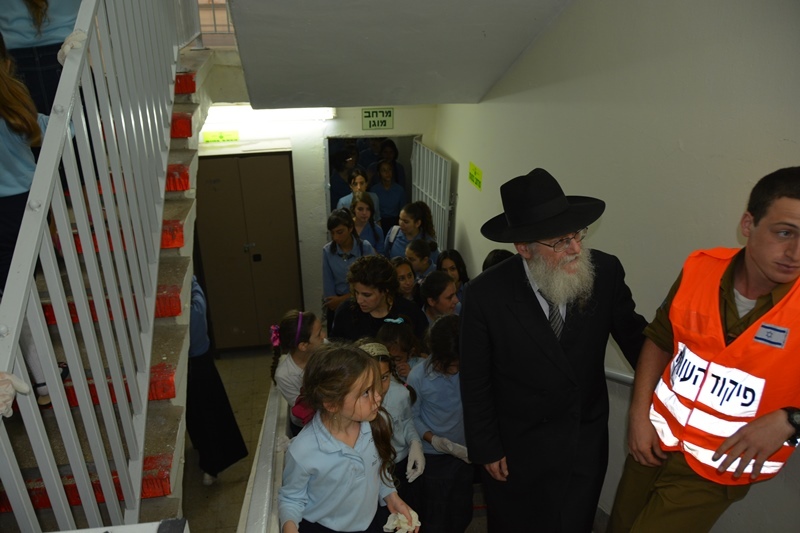 Thank God all the children have been trained to run immediately to the protected space, so even though it was early in the morning, thank God no one in the house was injured. 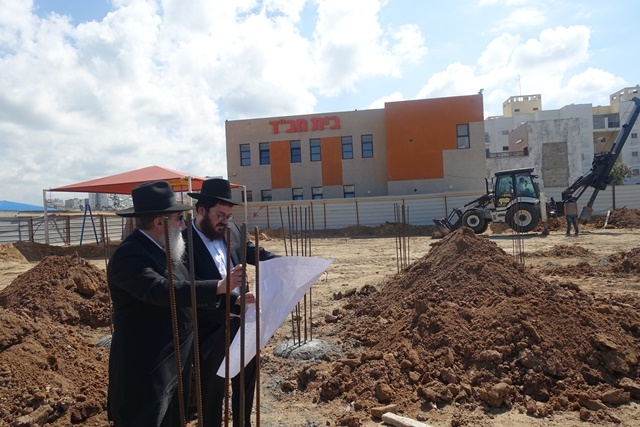 We see close up the miracles, it gives us strength to continue to encourage and strengthen other residents of the city, said Rabbi Gruzman. 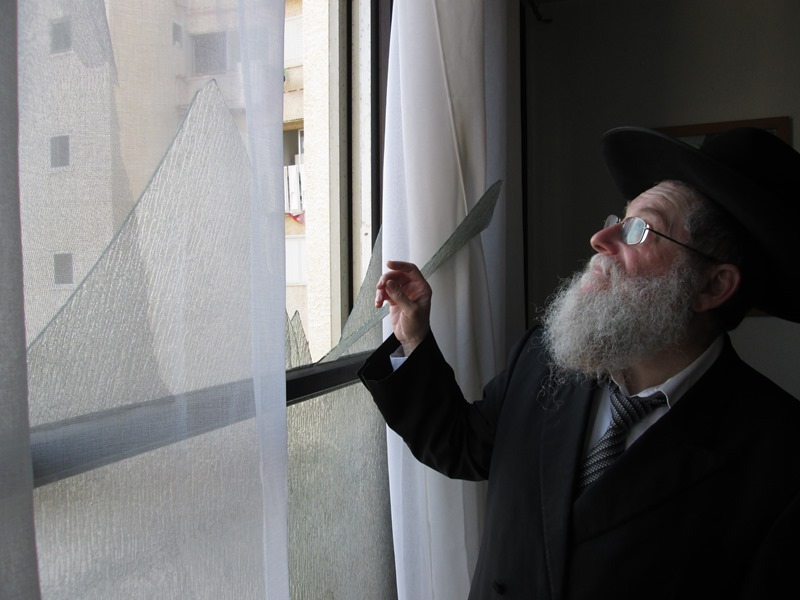 Also the home of Rabbi Shneur Lieberman sustained extensive damage with many shattered windows. 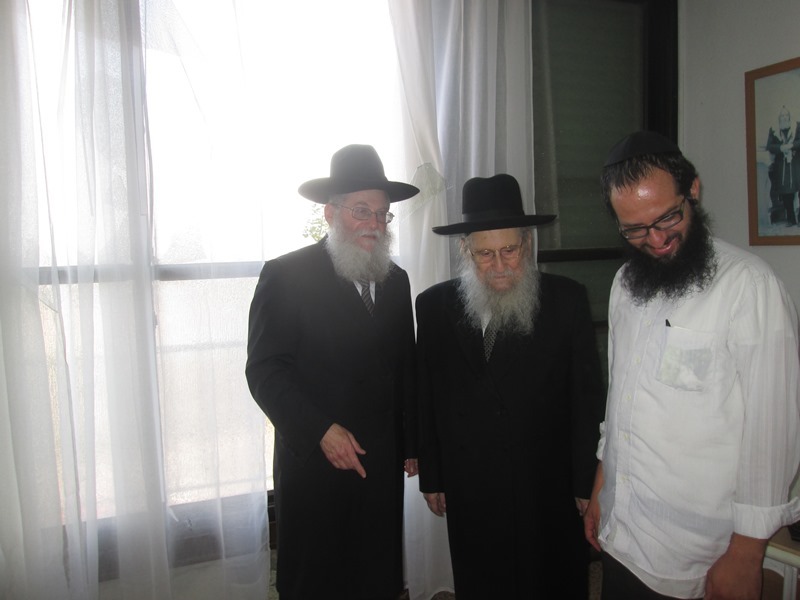 Rabbi Mendel Lieberman, Head Sliach of Ashkelon, came to visit and see the damage up close and view the home of the families. 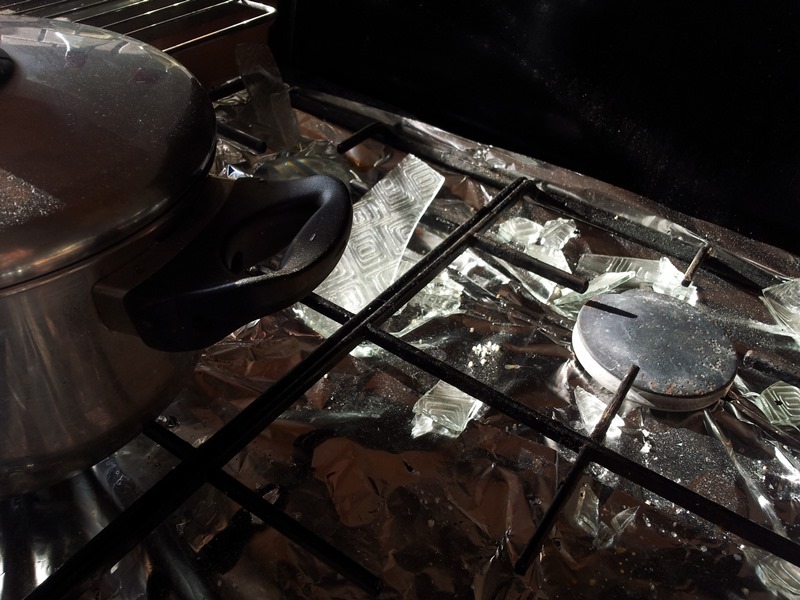 Thank God the damage amounted to property only and every one came out unscathed. 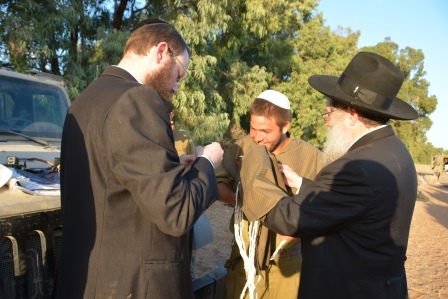 51 people, neighbors of the Shluchim were wounded by shrapnel, glass and shock. 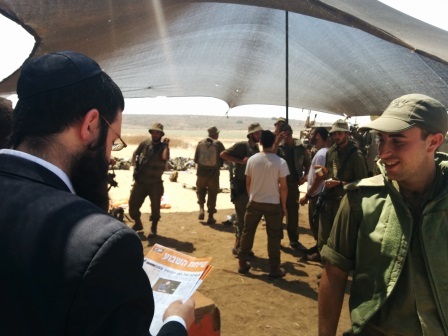 The Shluchim immediately mobilized to encourage and strengthen the residents. 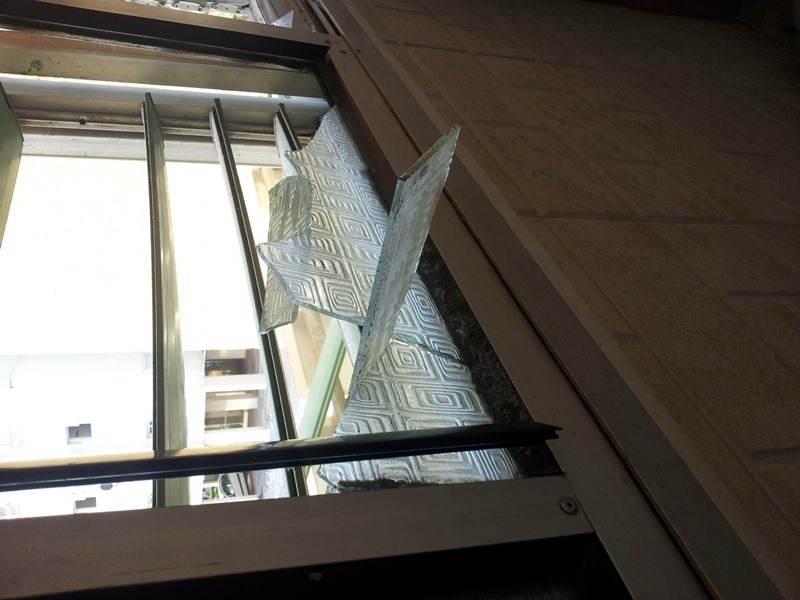 At 8:00 sharp - air raid sirens and rockets exploding were heard throughout Ashkelon. Yesterday was a day of quiet. 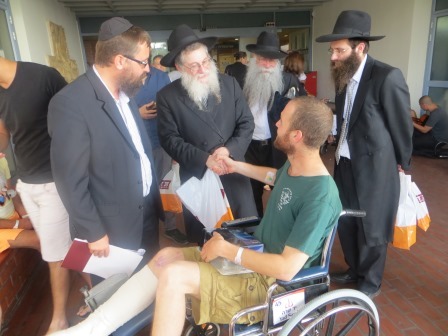 Rabbi Lieberman, the Chai Team with a visiting family from Montreal Canada went to visit the wounded soldiers in the Barzilie Ashkelon Hospital. 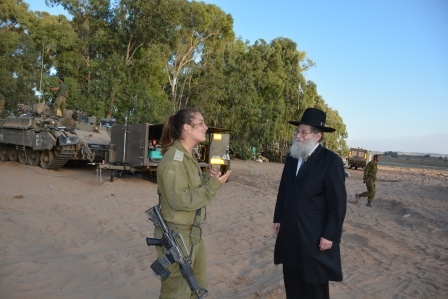 The soldiers needed to hear the “Thank You” and the expression of appreciation – for the tremendous self-sacrifice of themselves - for us in Ashkelon. 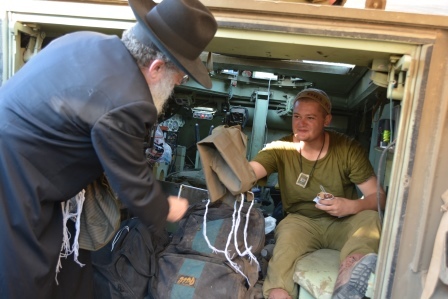 Especially moving was to see a helmet punctured by shrapnel, a soldier – a member of our Shul – whose leg was badly hurt – a soldier whose face on one side is covered with wounds because that’s where the shell landed. – real self-sacrifice. 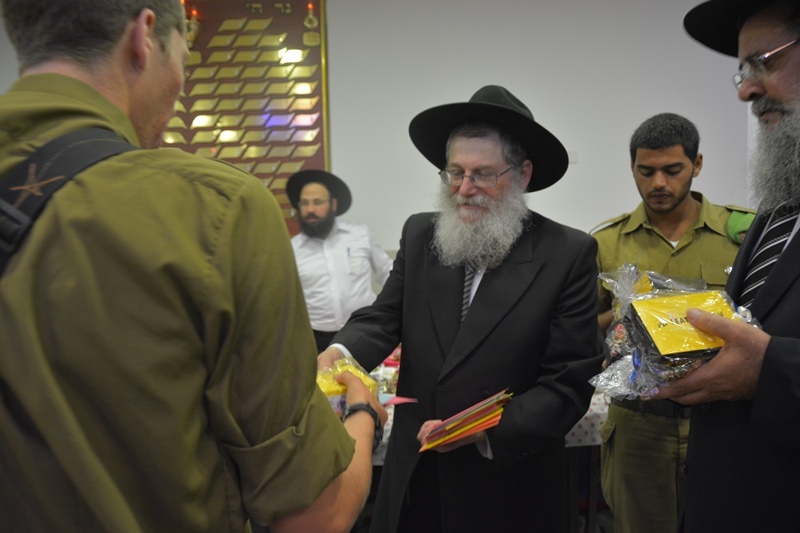 We distributed to the soldiers gifts, letters from children from Boston and Teffiln to a soldier who lost his during combat. 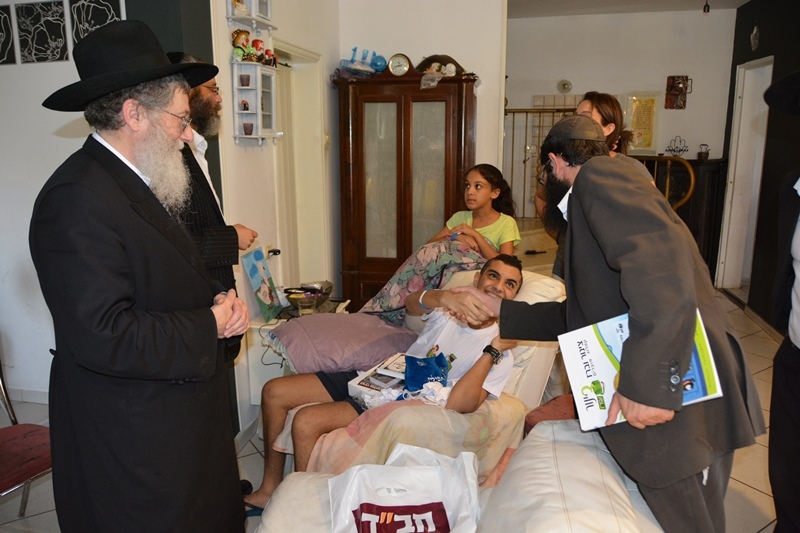 Rabbi Lieberman and several of his associates went to visit Yarin Levy. 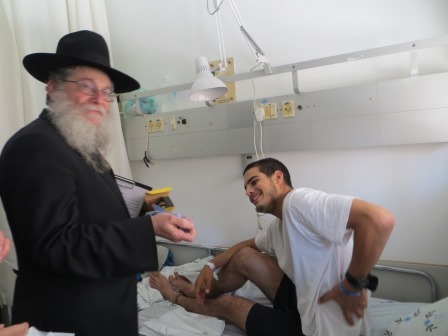 Yarin was seriously wounded in the first days of the war – when a piece of shrapnel tore through his chest, punctured his lung and lodged in his rib. Till today his body is riddled with shrapnel. 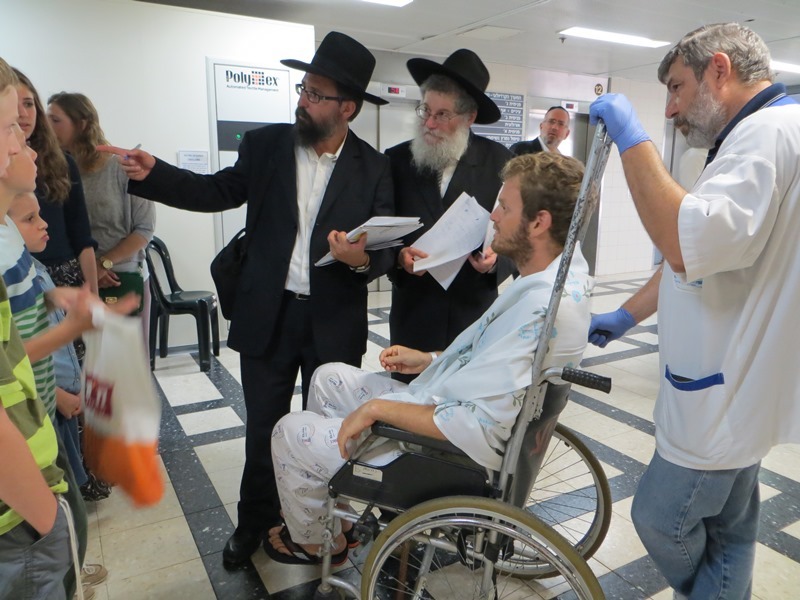 At the time he was received at the hospital – no one thought he would make it. 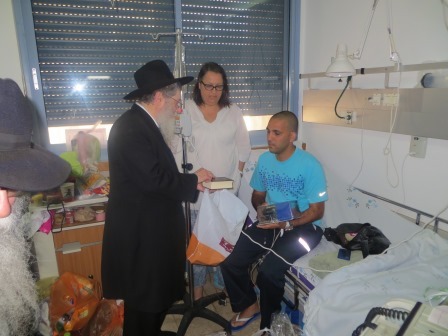 After three weeks of intensive treatment and several operations – thank G-D he is on the way to recovery. 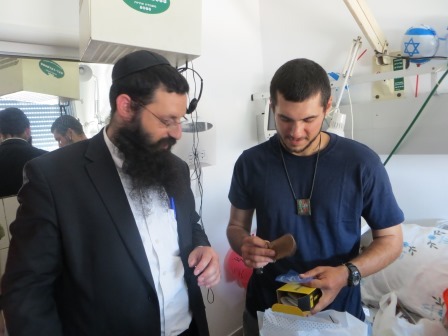 Yarin a student of the Chai School system was visited regularly by his classmates and friends, who together saw the miracle, unfold in front of their eyes. 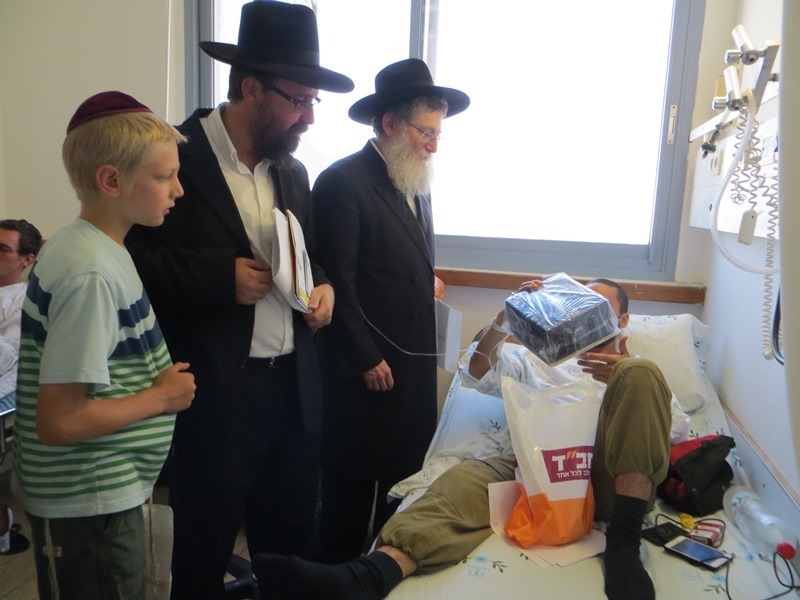 Rabbi Lieberman presented Yarin a new pair of Tefiln, TziZit and an Ipad to help him pass the many hours he still needs to convalesce. 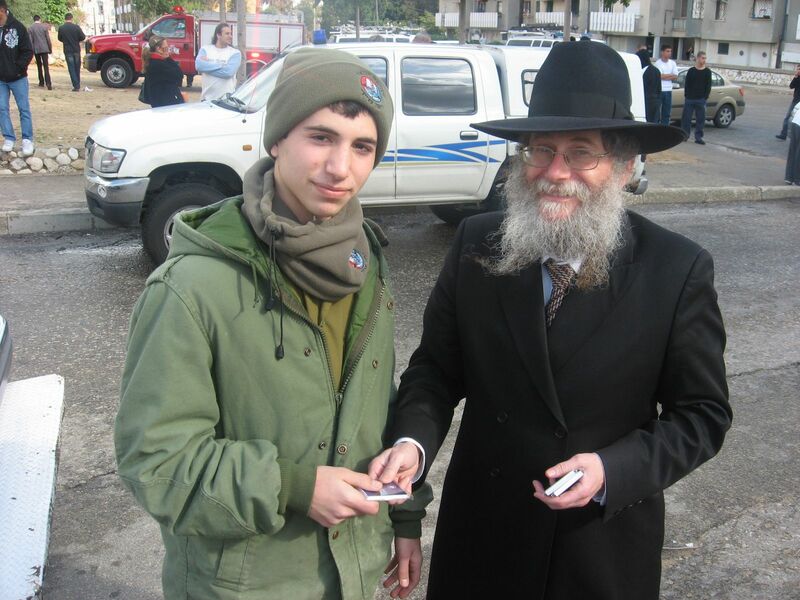 He still has a way to go, but B”H he is still with us. 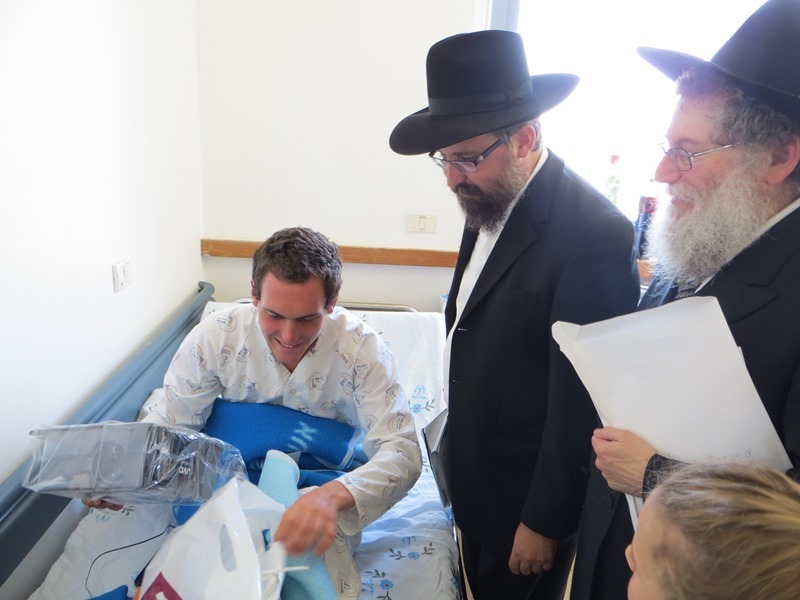 Yarin and his family have undertaken to show much appreciation to Hashem and in addition plan to make a grand celebration in recognition of this miracle. Yes quiet – but not back to normal. 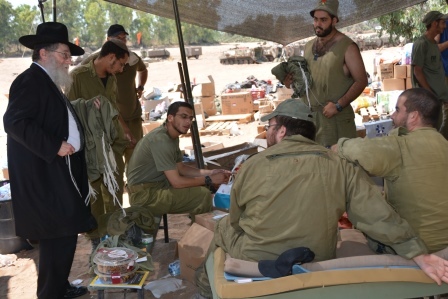 The authorities do not trust the Hamas – therefore it was Back to Normal with limitations. 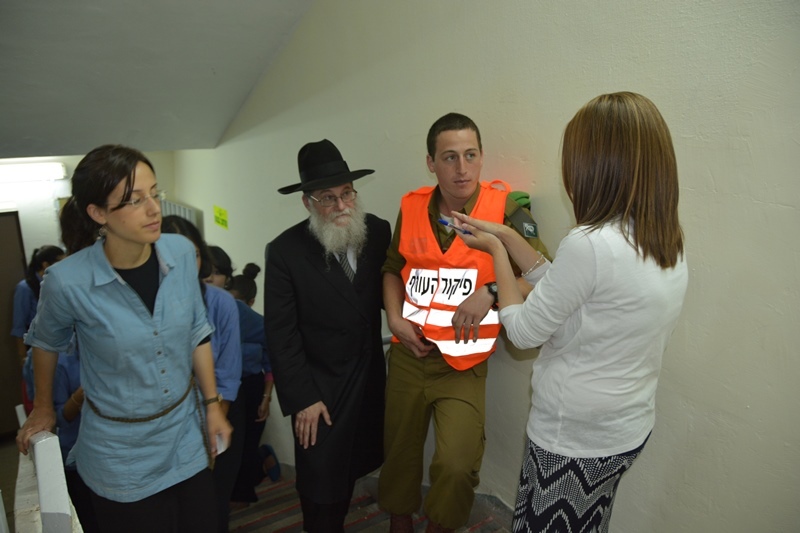 Though there was an official cease fire the civil defense did not let any organizations operate unless they had the ability to get everyone into a safe area within 30 seconds. 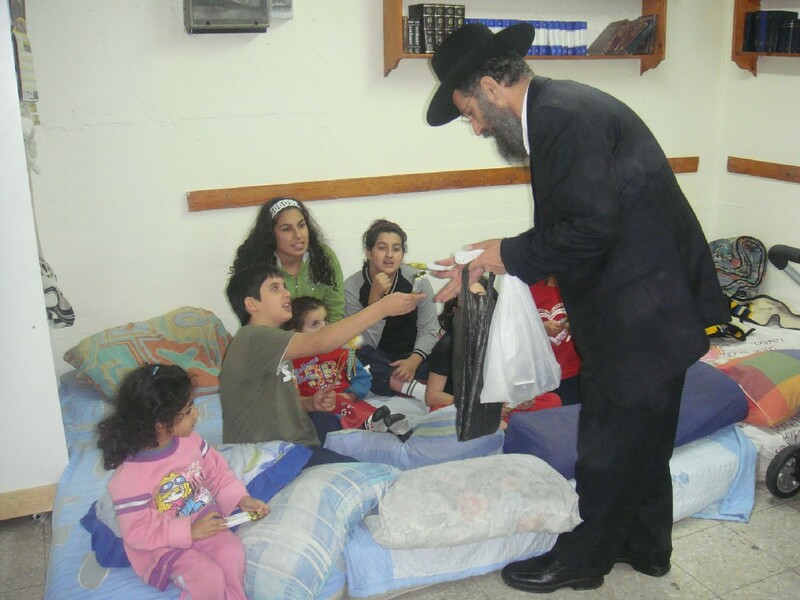 So we had one more day of taking care of the children, elderly and the many that needed extra help. 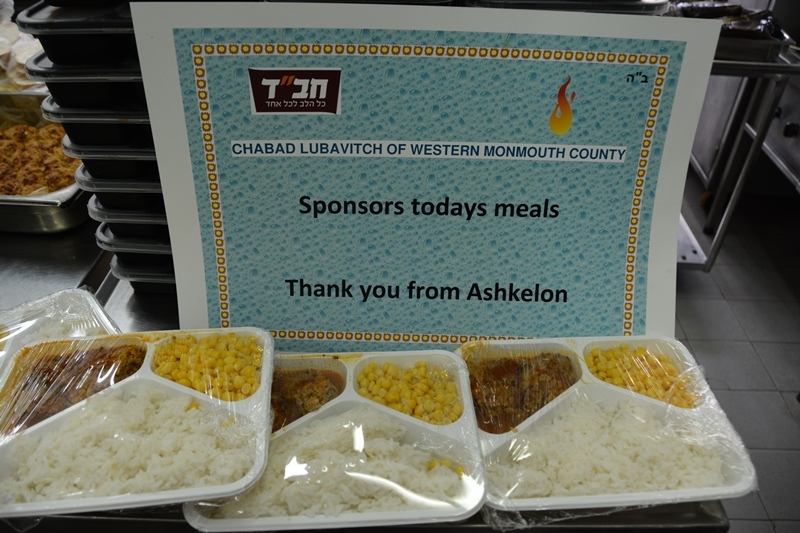 Today’s meals went out with the help of the CHABAD LUBAVITCH OF WESTERN MONMOUTH COUNTY community. I can only say – help in need is help indeed. I would like to thank all those who rallied to action and helped our brothers and sisters with deeds of caring and kindness. 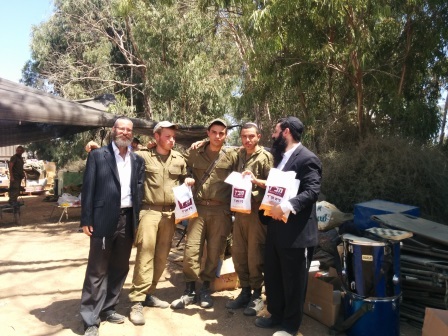 Chai Ashkelon was chosen by Africa Israel Investments Ltd. to distribute their gifts to the combat soldiers. 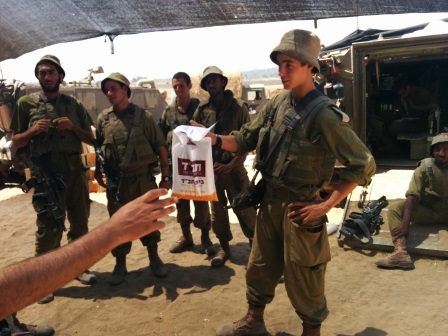 The Chai Team used the lull in the fighting to go to the front lines and express thanks and appreciation to our soldiers. 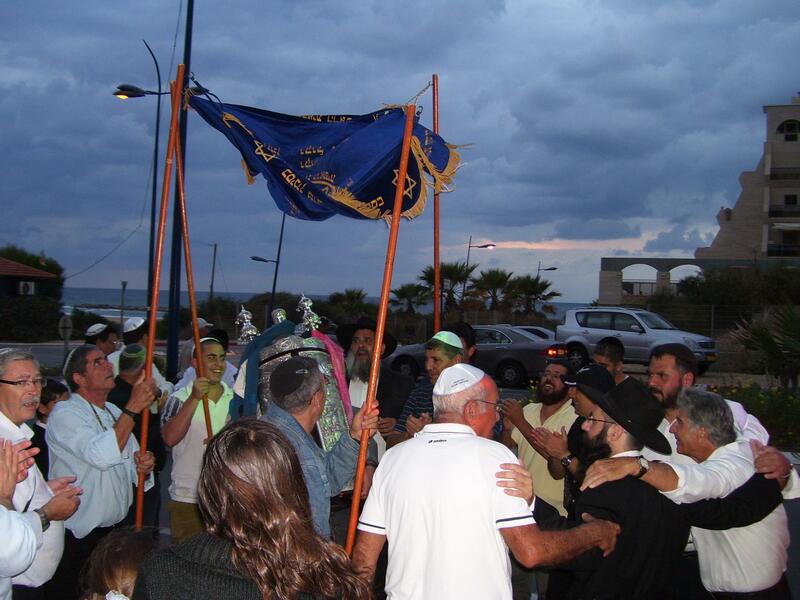 As residence of Ashkelon, where we have experienced Rocket attacks for years, the appreciation is felt so much more so. 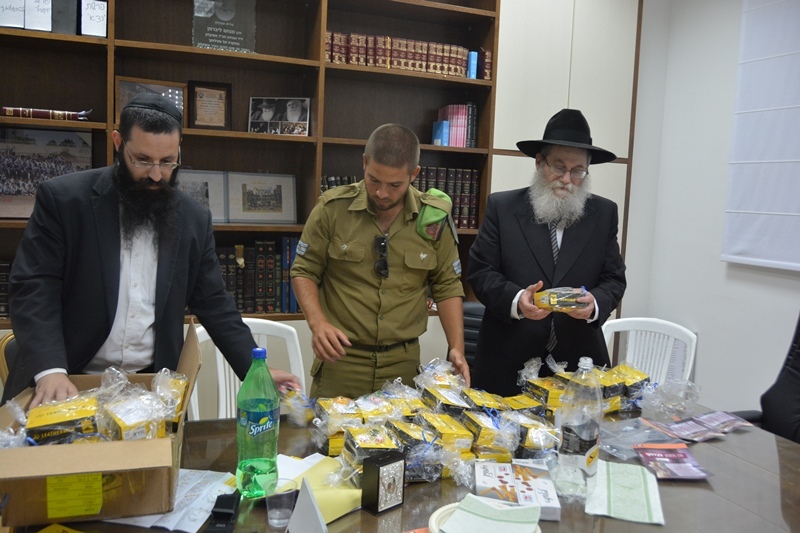 The Chai Team – led by Rabbi Moshe Peles, the Assistant Director of Chai distributed hundreds of pairs of Tzizit as well as boxes of gifts collected by the employees of by Africa Israel Investments Ltd..
AFI Group is an international holdings and investments group. 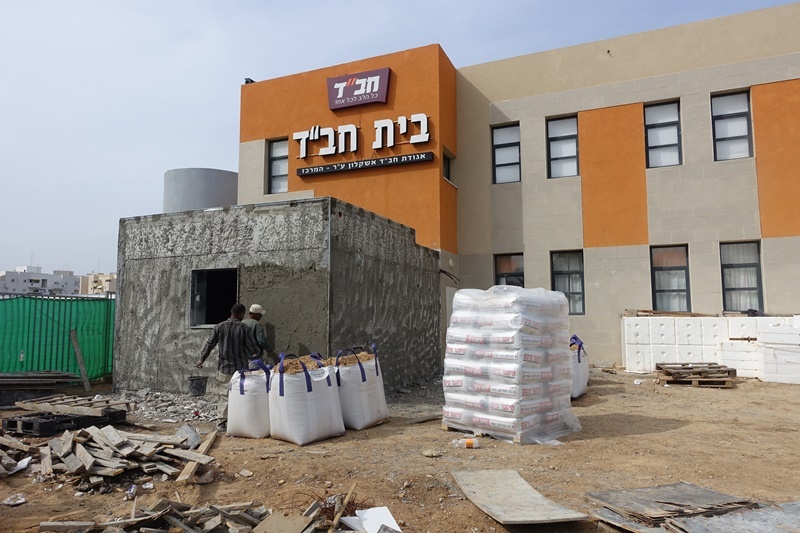 It is one of the most prestigious investment groups in the country and is traded in the London and Tel-Aviv stock exchange. 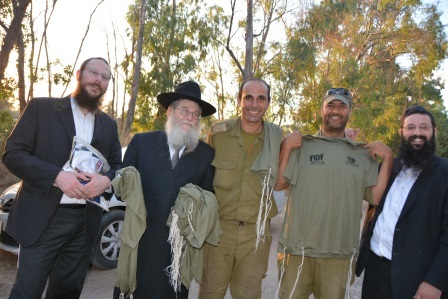 It was an honor to partner and express our feelings to our soldiers. 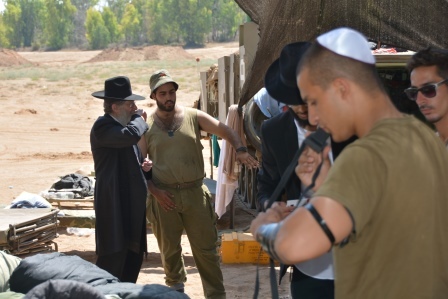 We are still trying to further the campaign for Leatherman wire cutters and knives for front line soldiers. 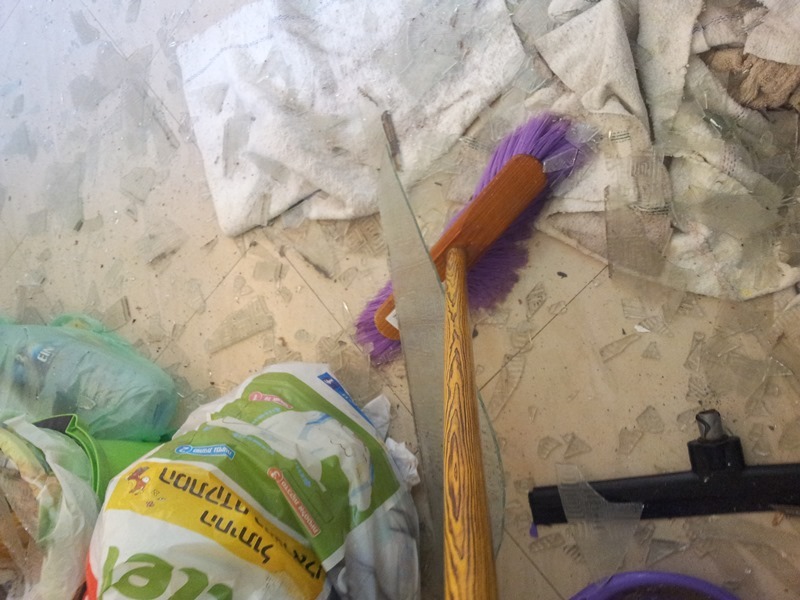 This tool can sometimes save their life – by having these tools on hand. 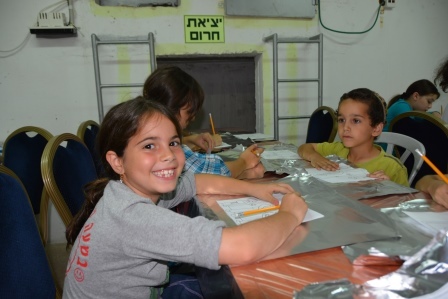 As the rockets continue to rain on Southern Israel the children of Ashkelon spent yet another day of Summer Vacation in the Bomb Shelters. 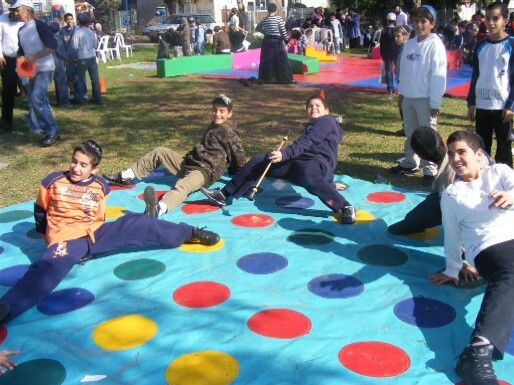 Chai Ashkelon is in the forefront of ensuring that the children are well protected physically and also preoccupied with healthy activity, thereby protecting the children psychologically from all of the stress and tension of the war. 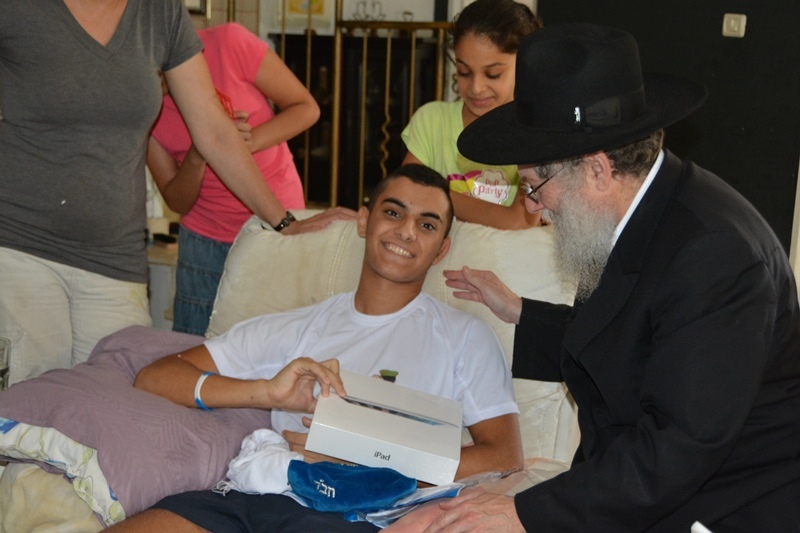 Today Chai ensured a full range of activity for hundreds of children they care for. 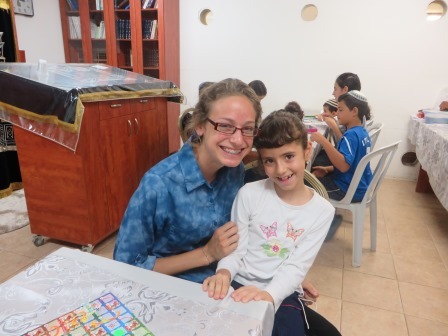 Candy making, arts and crafts, painting and much warmth and love to the children. 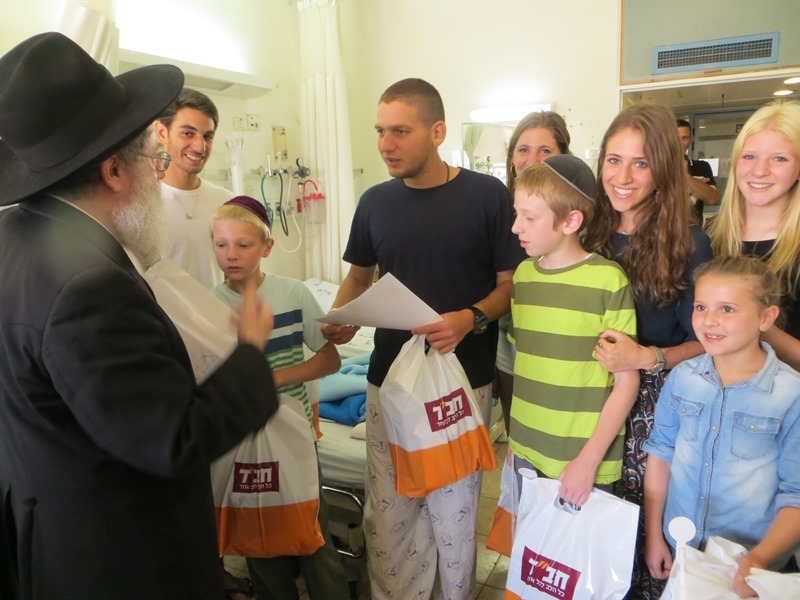 Thank G-D the Chai team was paid back many times over with the smiles and appreciation of the dear children. Please help us continue to strengthen our children, and overcome these trying times. Adopt a Bomb Shelter today. I would like to thank all those who answered our call and helped continue this vital work. 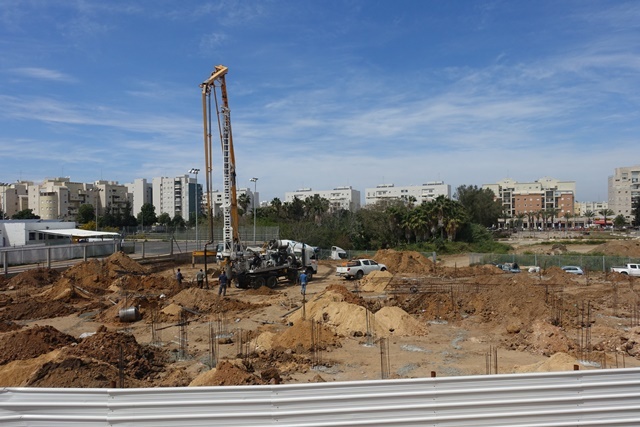 At the moment the city of Ashkelon leads as the most targeted city by the Hamas. We have the distinction as having the most rocket strike and air raid sirens. We have less than 30 seconds to run for our lives and to get to a safe area, so many people are afraid to leave the safety of their home and to leave the children alone. 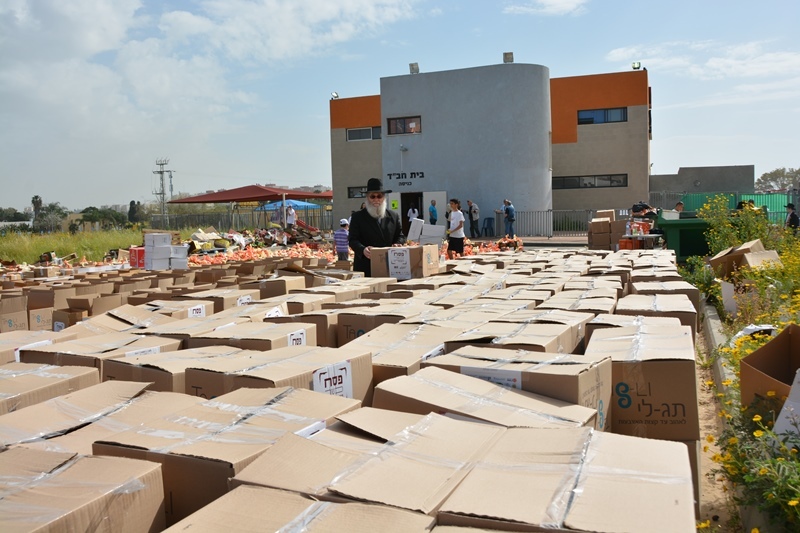 It is for this reason we have established an emergency operation to provide relief of educational and humanitarian needs in the city. 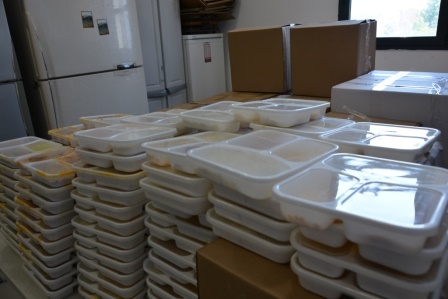 Over 1200 hot meals are distributed daily. 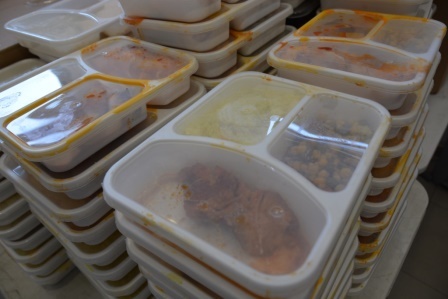 The meals are intended to help mothers who are struggling to watch their children and run their household, elderly who spend their time in bomb shelters and just about anyone whose life is disrupted as a result of the current war situation. 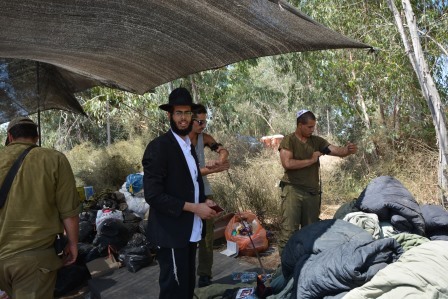 The situation is exacerbated by the fact that the children are spending their summer vacation in bomb shelters instead of summer camps. 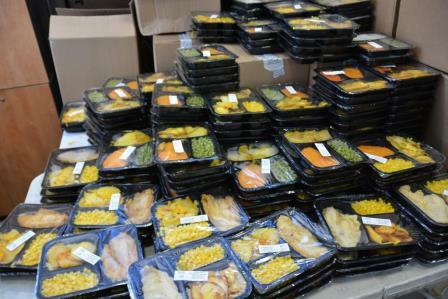 The meals to the shelters help alleviate some of the strain and stress of the situation. 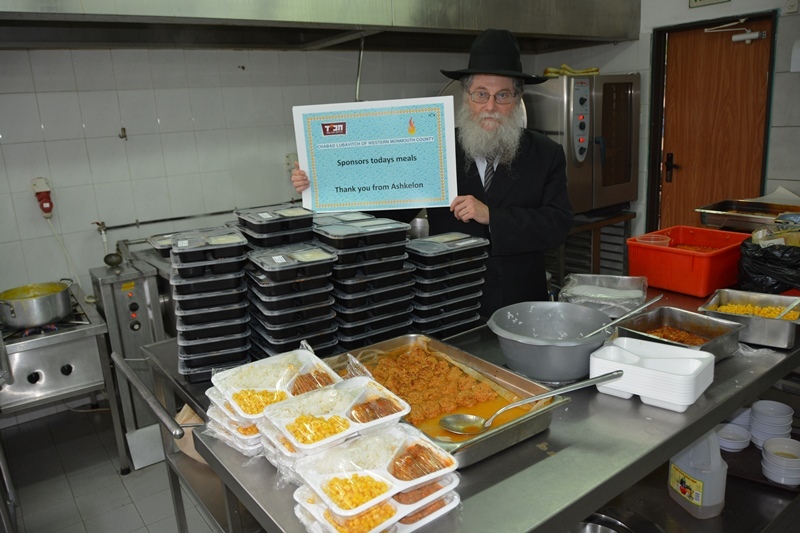 Today we expanded the program to make sure – No family should miss a Shabbat meal. 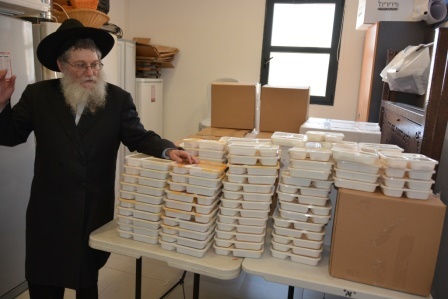 Thank G-d the Meals Program is a lifesaver for so many of the families. We would like to thank a very kind donor who underwrites more than 50% of the costs, and helps up provide this lifesaver for so many families. 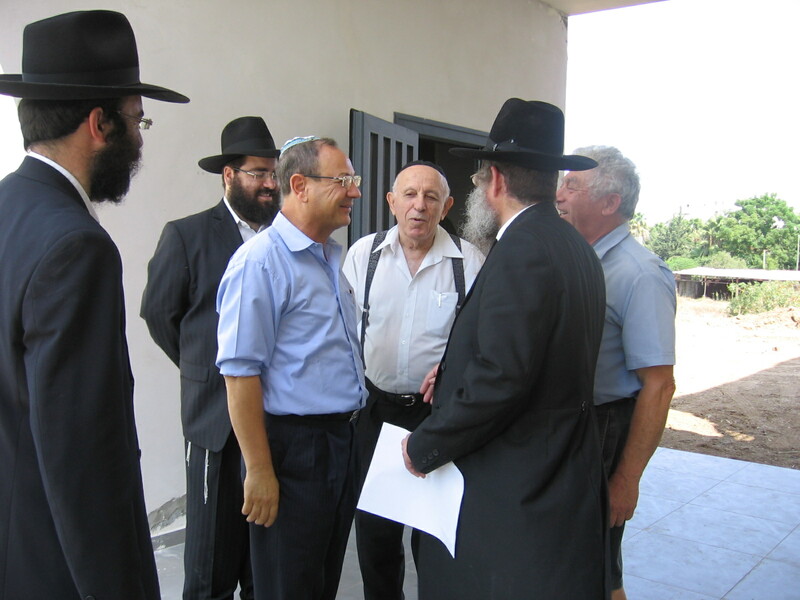 Rabbi David Eliezrie Rabbi of North County Chabad Center, President of the Rabbinical Council of Orange County and Long Beach, Member of the board of the Jewish Federation of Orange County and Chabad's National Liaison to Jewish Federations of North America, came for a lighting visit in Ashkelon, Israel. 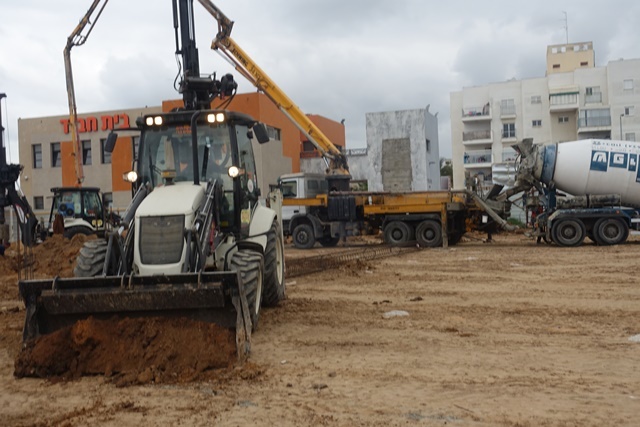 The purpose of the visit in Ashkelon was to see first-hand the effect that the war has on the civilian population on a grass roots level. 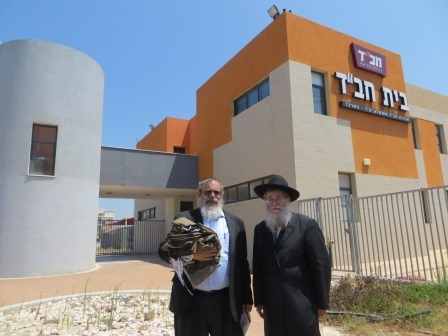 Rabbi Eliezerie toured the city of Ashkelon with Rabbi Lieberman, visited some of the Chabad Schools, met with local Chabad Leaders and learned about the needs of the local residents. 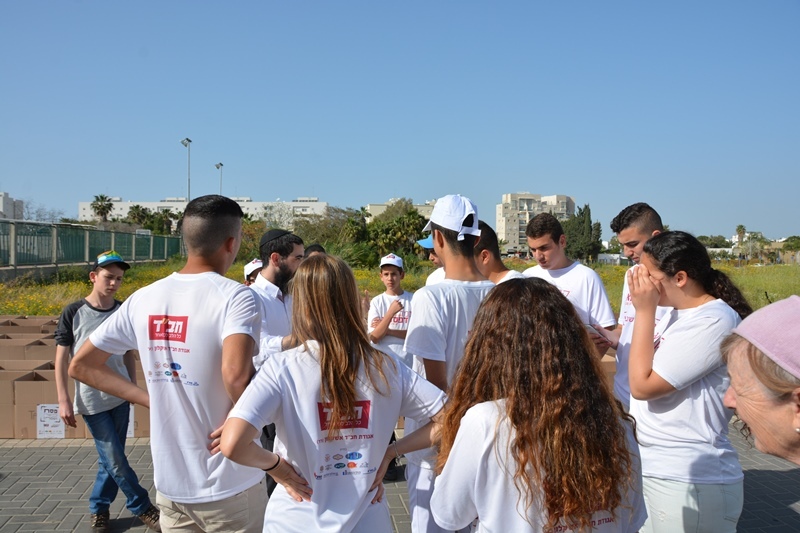 During the meeting, where he learned about the scope of the activities taking place in the city, he was treated to a Rocket Attack from Gaza and ran with the rest of the group to the closest bomb shelter. 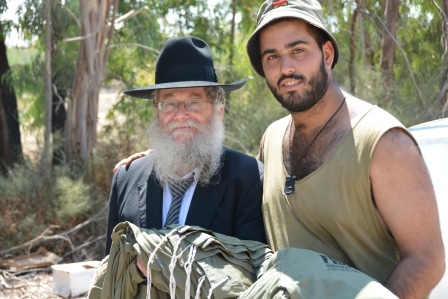 Rabbi Eliezerie expressed how impressed he was with the various activities Chabad Ashkelon is doing to alleviate some of the stress and anxiety that is generated by the war. 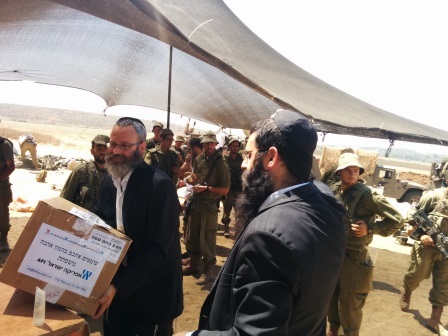 The food distribution (over 1000 meals a day), the Hospital camp for children, the emergency hotline and the Bomb Shelter activity program left on Rabbi Eliezerie a profound impression. 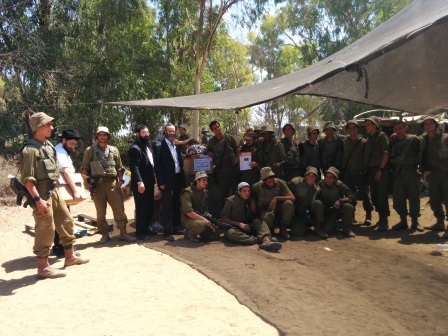 During his trip Rabbi Eliezerie visited the soldiers on the front line and participate live with a solidarity rally in Orange County CA. 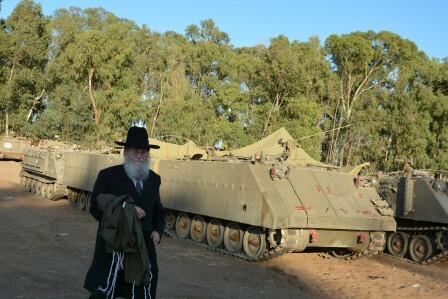 Rabbi Eliezerie took upon himself to see if he can help the war effort in any way. 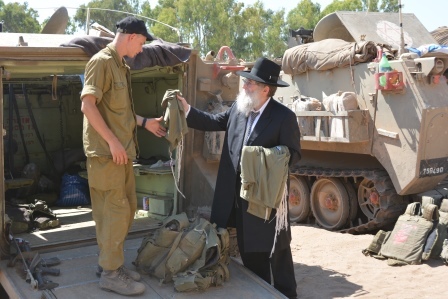 He also called upon World Jewry to see to support the people and children of Ashkelon as much as possible. 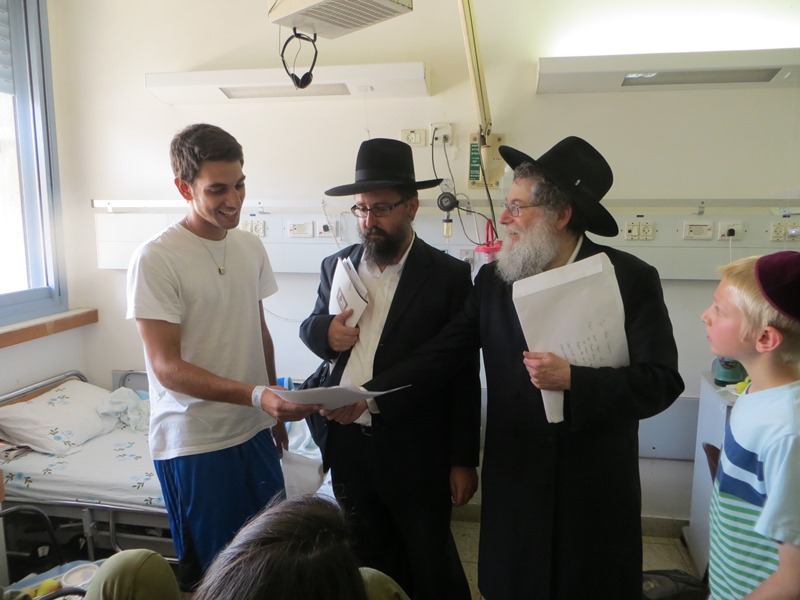 Rabbi Lieberman and the Chaן Team made the rounds in the Barziie Hospital in Ashkelon. 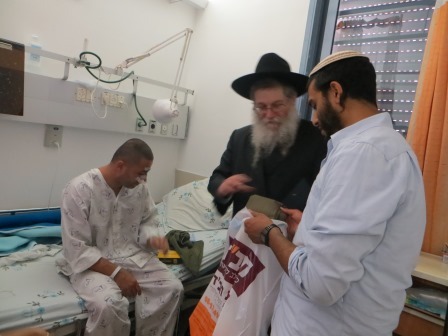 At the time of the visit there were 36 soldiers hospitalized, some from wounds from the fighting, and others from infections and germs they contracted during their incursion into Gaza. The high tense of alert and stress and the constant vigil takes a toll. 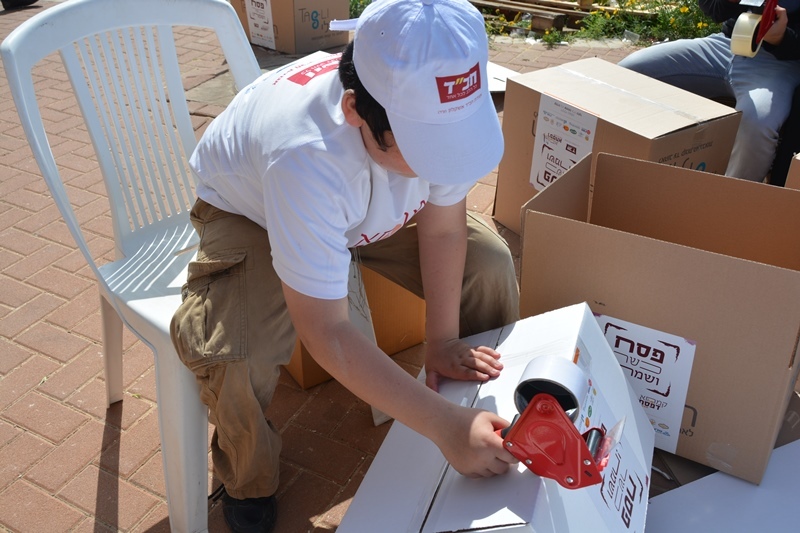 Young boys, who have their life ahead of them, put their lives on line so that we can have some peace and quiet in Ashkelon and surrounding area. So we came to say Thank You Thank You, extend a few gifts of appreciation on behalf of the entire country and take their names and mothers name so that prayers can be said, by our school children and many congregations, for a speedy recovery. 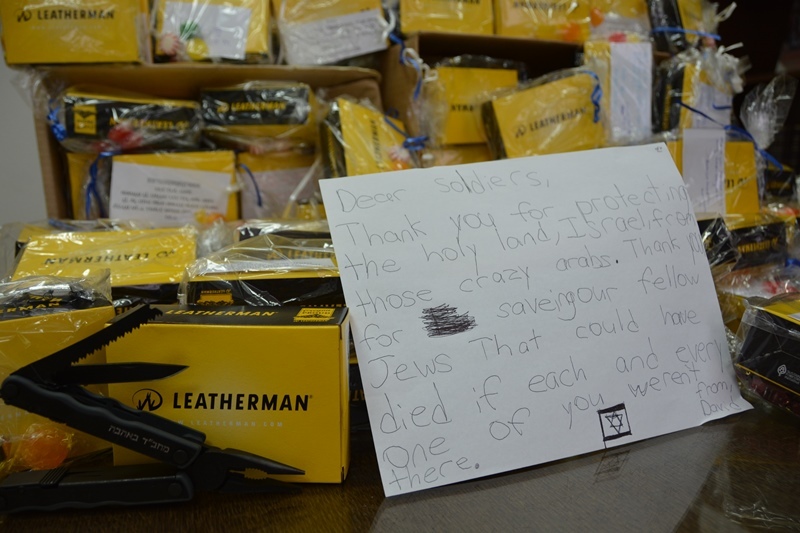 The highlight of our gifts were the Lederman pocket knives and wirecutters, that are so useful for the soldiers during the time they are in the front lines. 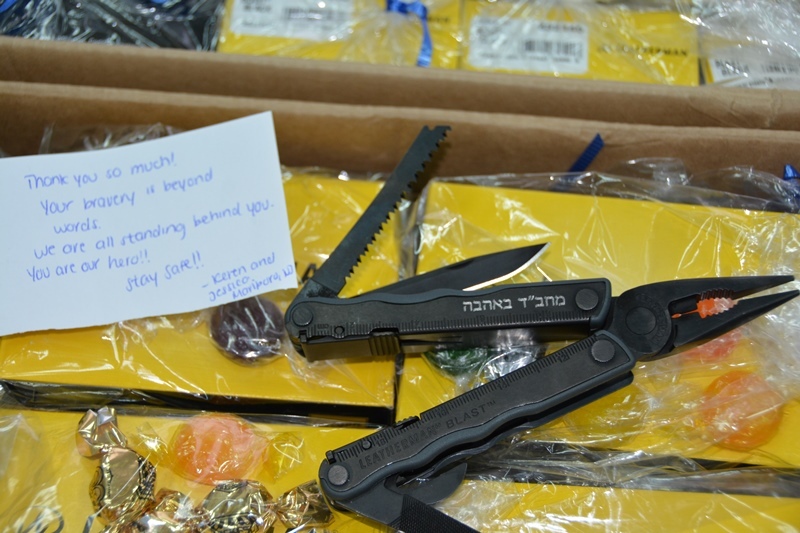 Please follow this link to see the excitement and appreciation when they receive the Leatherman wire cutters and knives, and add friends to our Facebook page. 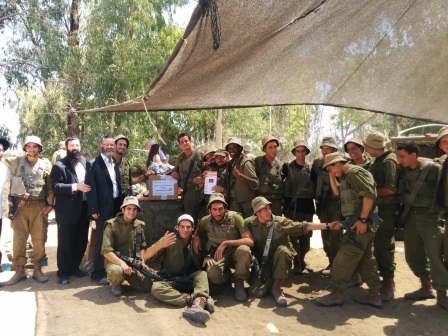 The Chai Team made another round by the soldiers at the front. 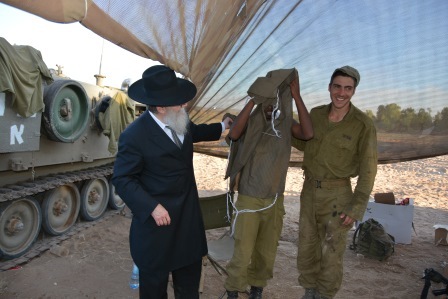 The strength of the country is dependent on the optimism and positive morale of the soldiers. That’s where we can help a lot. That’s where we come in. 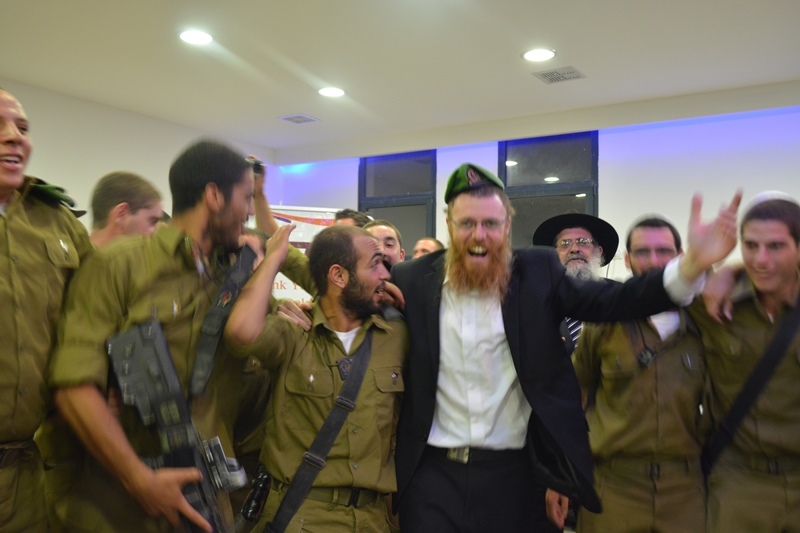 The smile, the happiness the excitement when we come – conveys the message that the country is behind them. 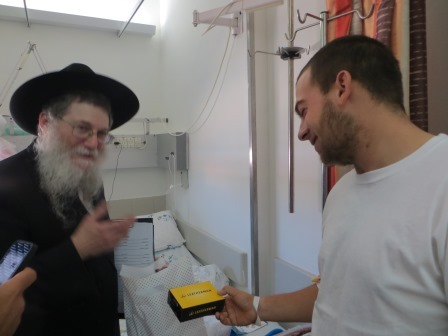 That’s why the gifts – the Tsisit are so important. 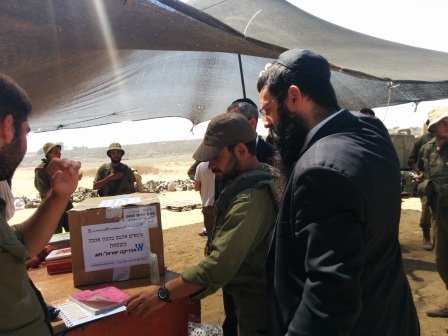 Till today over 2000 pairs of Tsisit were distributed all over the Southern front – we are now trying to put together even a larger order. 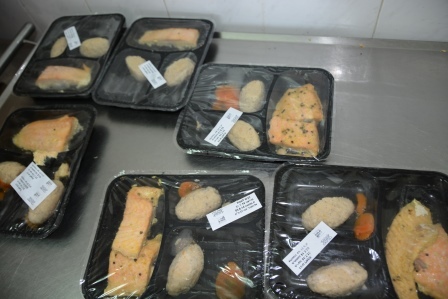 Please follow the link to see some fresh pictures. 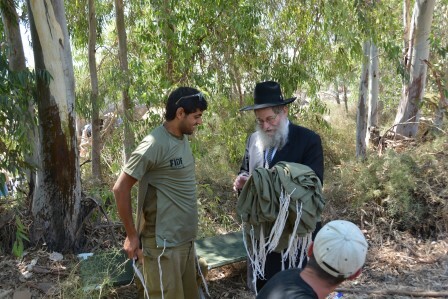 Rabbi Lieberman and the Chai Ashkelon team visited some soldiers stationed not far from Ashkelon. 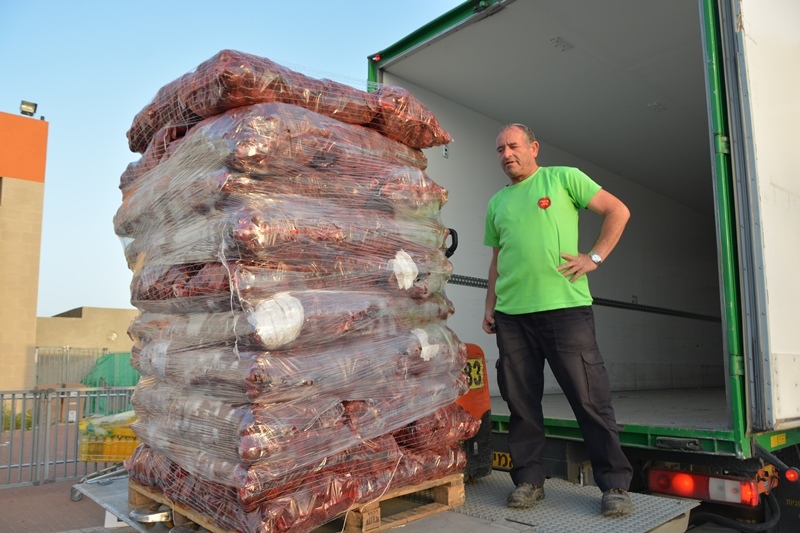 There is a lot of tension and adrenalin in the air – about go in. 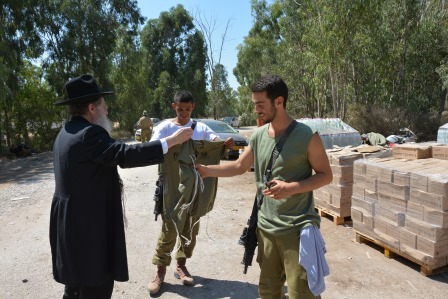 Several hundred Tsisit were distributed to the soldiers just before they go down into Gaza to give added security before the boys engage in battle. 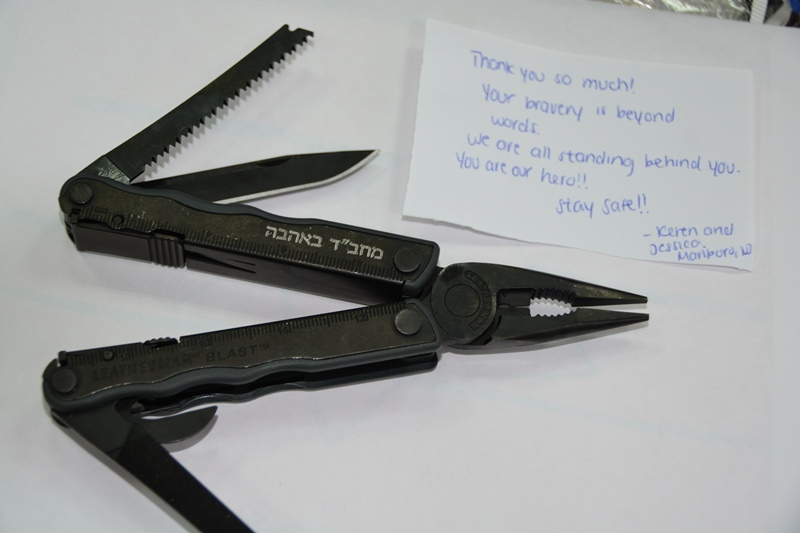 Several of the boys requested Leatherman wire cutters and knives. This can sometimes save their life – having these tools on hand. 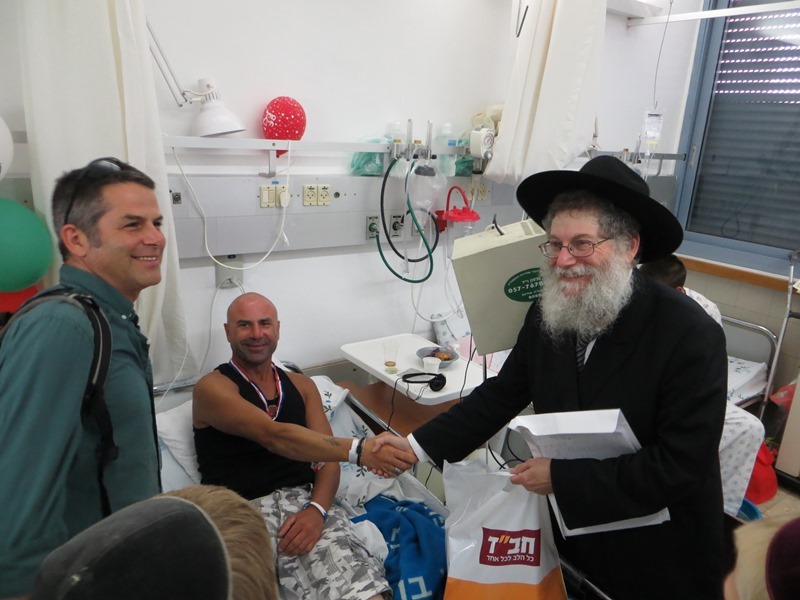 Rabbi Lieberman and the Chai team visited our wounded soldiers in the Ashkelon Hospital. 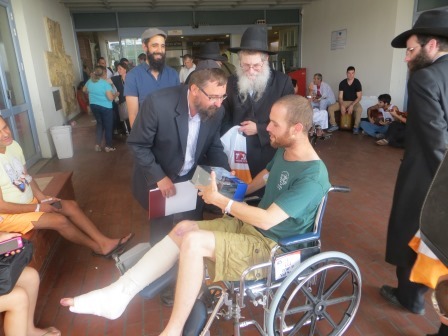 Thank G-D many are on the way to recovery. 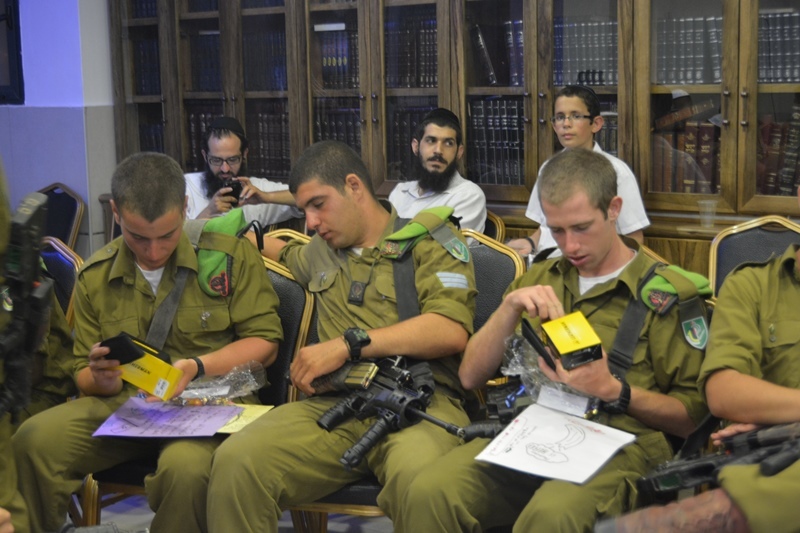 Each soldier got a good set of earphones a good book and a hearty blessing and thank you. We are looking for sponsors of IPads for the boys. 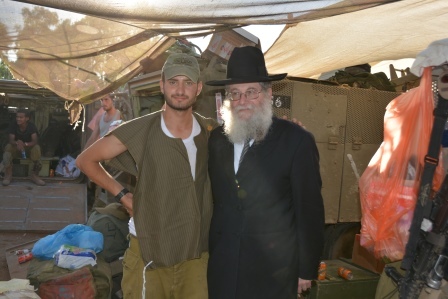 As the war continues and the tragic toll in human life grows. 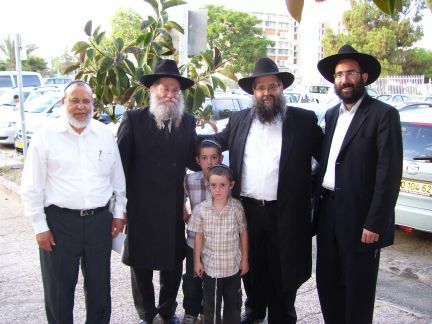 The Chai Team with Rabbi Lieberman visit and encourage the children. 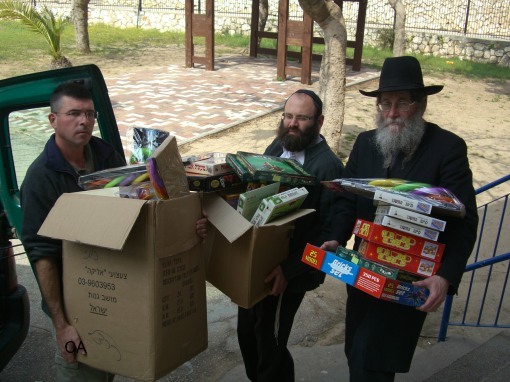 The toys and prizes help the time pass as well do not let the children dwell on the threatening sounds of war. 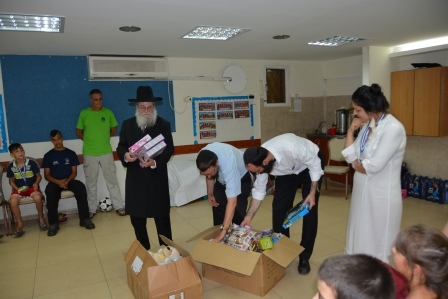 Hundreds of children were visited and presents as well as sweets were distributed. 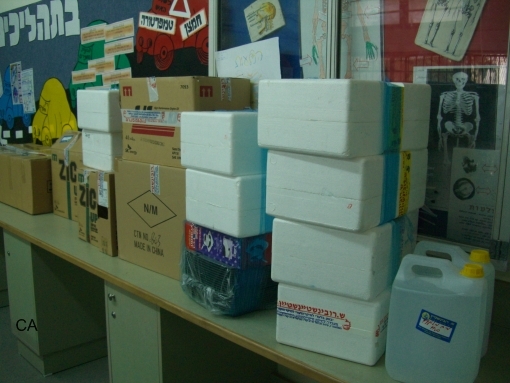 Chai would like to thank all the donors who made the gifts possible. 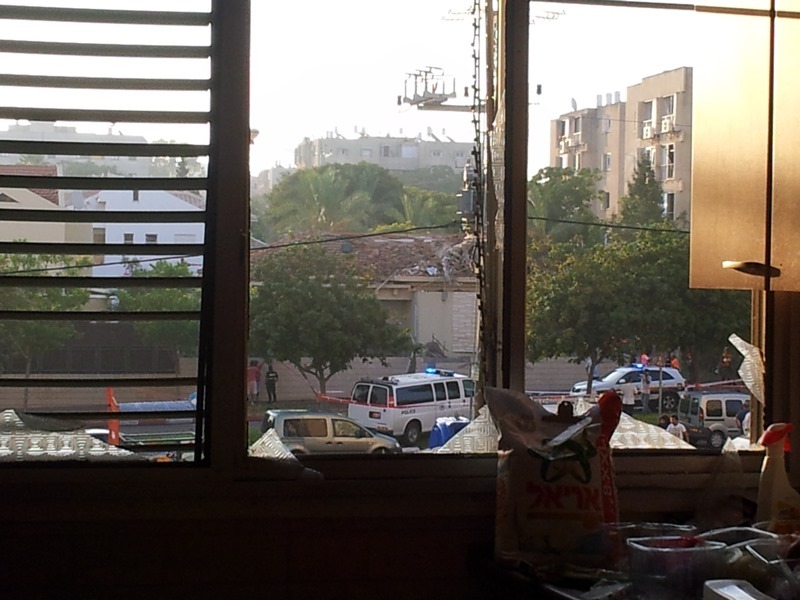 Dozens of deadly missiles are fired onto Ashkelon daily from the nearby Gaza Strip. 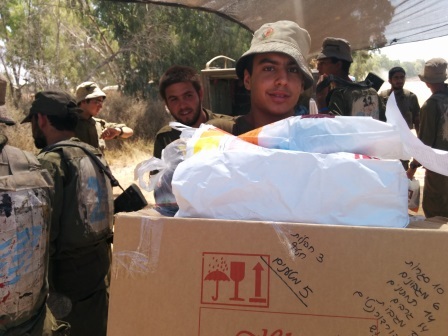 Summer has come but there is no vacation for the children of Ashkelon. 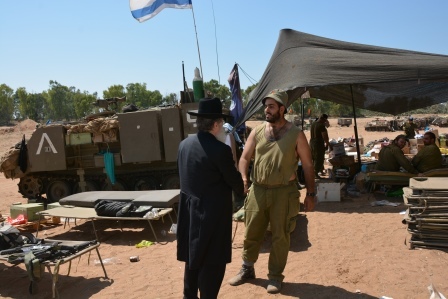 Well over 1500 rockets were fired into Israel with Southern Israel getting the brunt of the attack and Ashkelon getting its fair share. 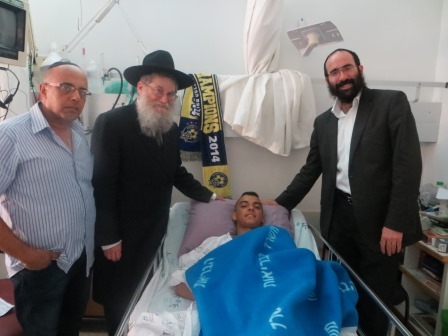 Yarin Levi (16) who has been a student in Chai since First grade was badly hurt. 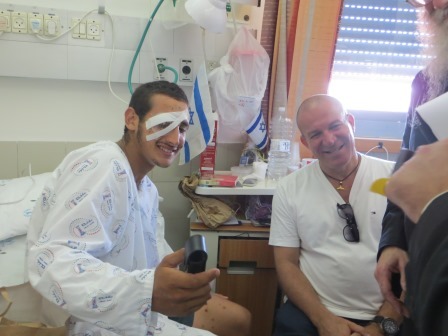 As he stepped out of his home a missile landed not 5 meters (15 feet) from him. 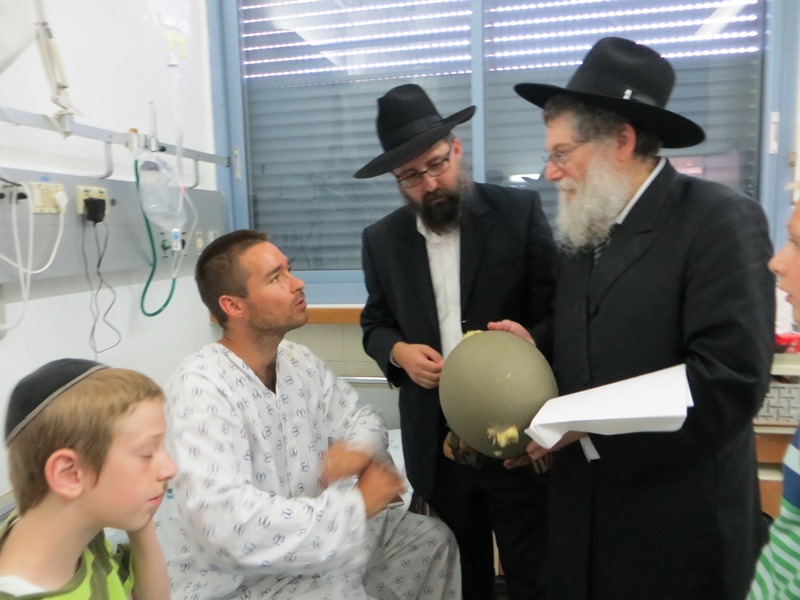 A piece of shrapnel tore through his right chest, punctured his lung and finally lodged in a rear rib. 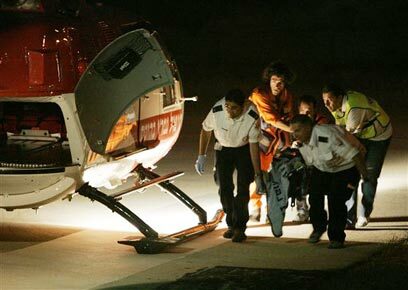 He was brought to the hospital in very critical condition. 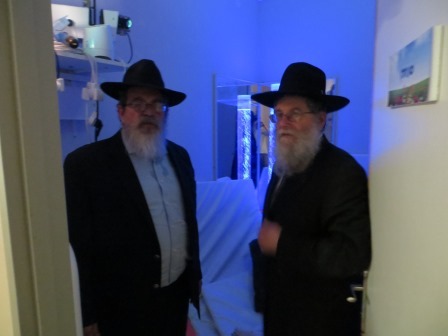 Today thank G-d his condition has been stabilized and was visited by Rabbi Lieberman and Rabbi Vilenkin. May we all pray for his speedy recovery. 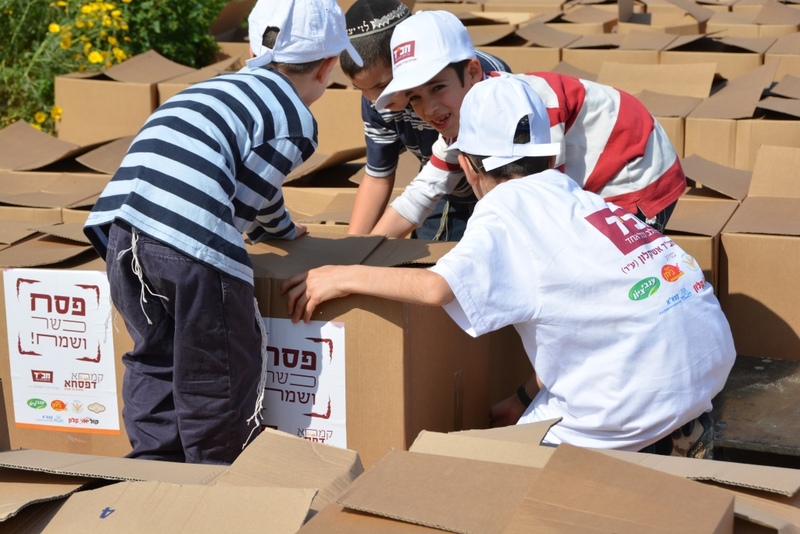 Students from the Chai Schools in Ashkelon - volunteered their vacation time to pack Passover Food Packages for the needy. 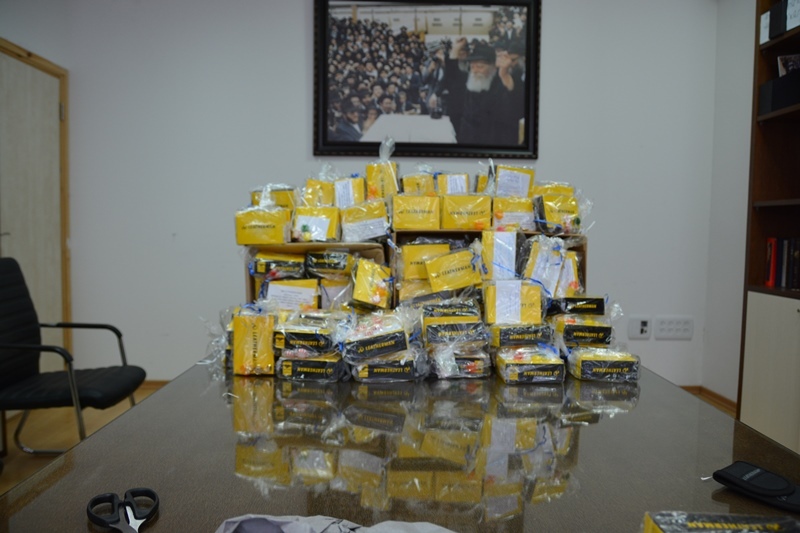 Some 400 packages were prepared and filled with Matzoth, Wine, food stuff, fruit, snacks for the children and everything else needed for the families to enjoy themselves for the Pesach Holiday. 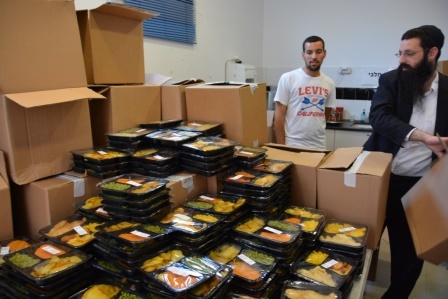 This year’s packages were enriched due to a contribution from the Invey Hagefen Company in Ashkelon. As well we would like to thank our regular contributor’s for making this vital program possible. 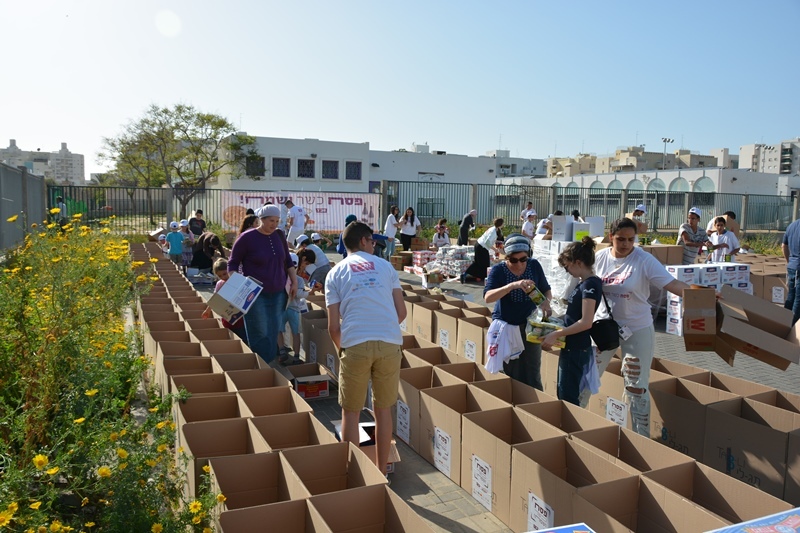 There is still a big need to include more needy families.. 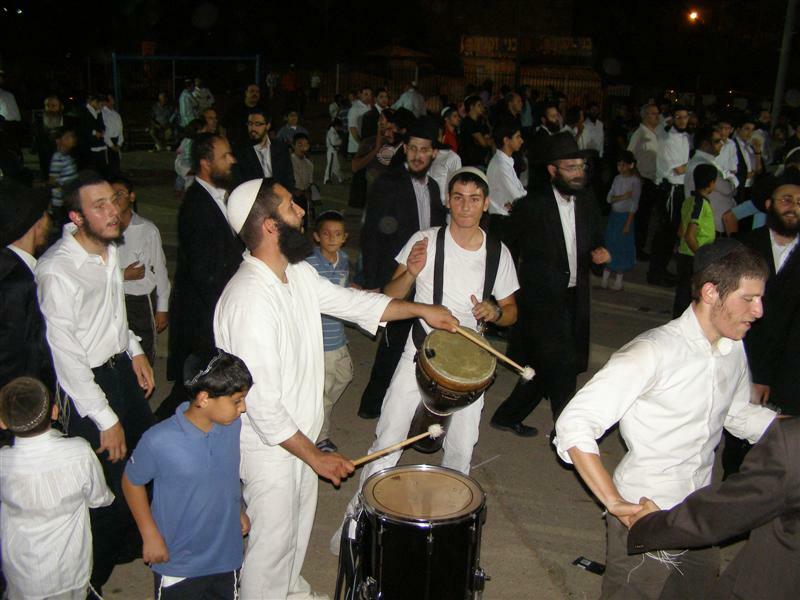 The annual Lag Bomer parade was attended by over 3000 children and parents. 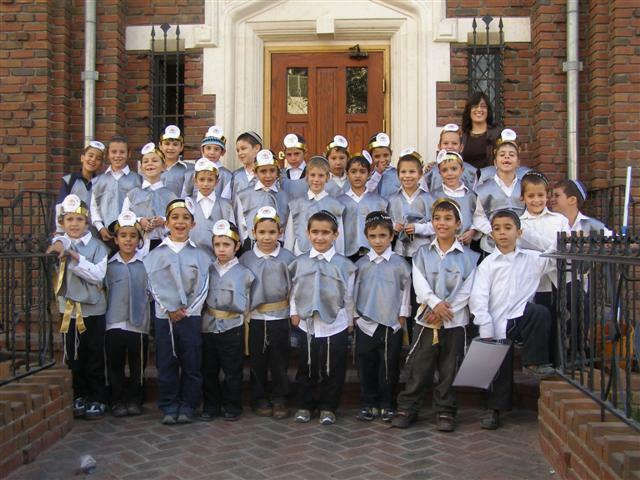 The parade was lead by the marching band of the Chais Or Menachem boys school. 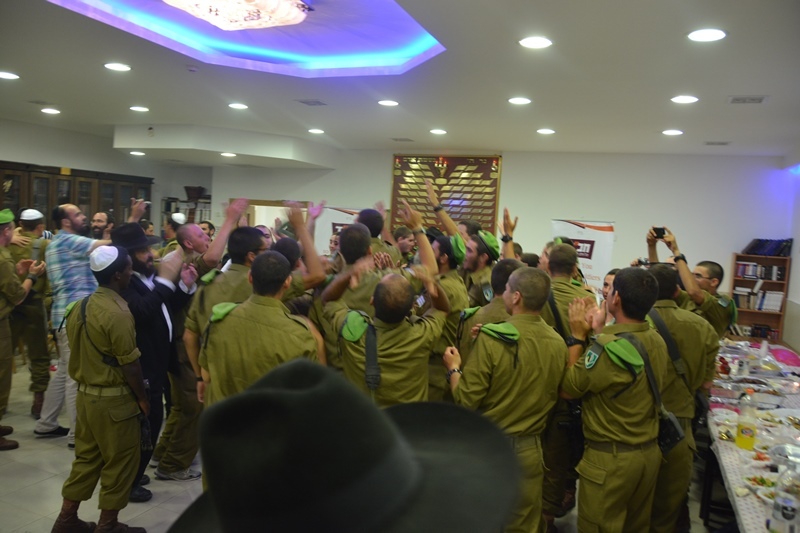 They marched uniformly on the main street of Ashkelon to the indoor sport stadium. 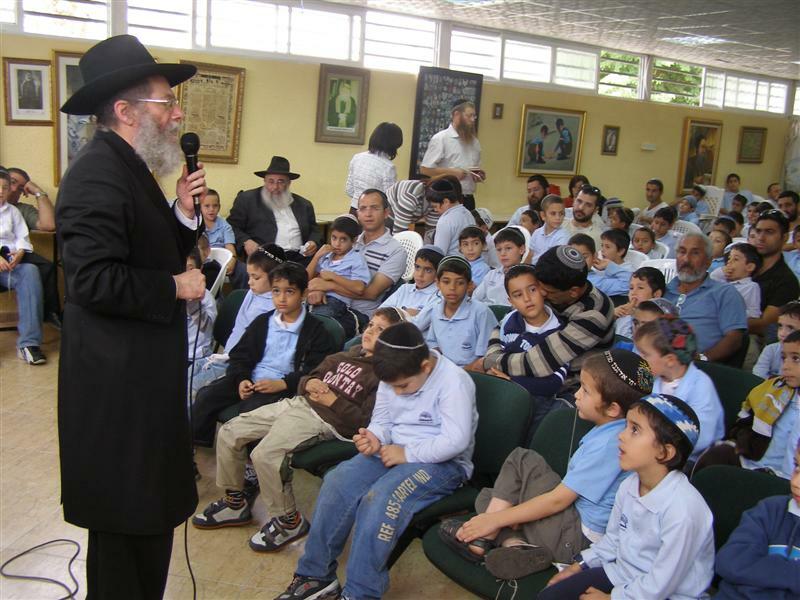 Rabbi Lieberman warmly greeted the children and their parents and relayed the message of the importance of the study of the Torah. 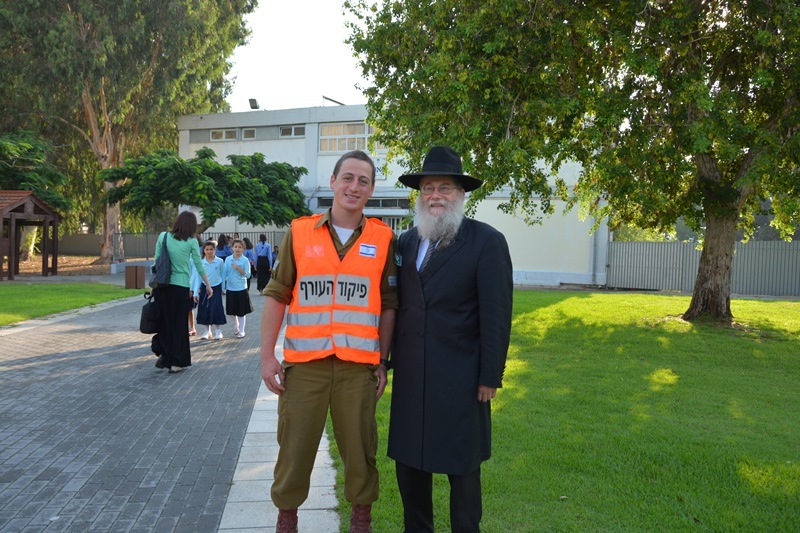 The deputy executive of KZAA, Mr. E. Friedman who sponsored the advertisement for the parade by including safety instructions for lighting bonfires, addressed the children and encouraged their efforts in keeping the environment clean. 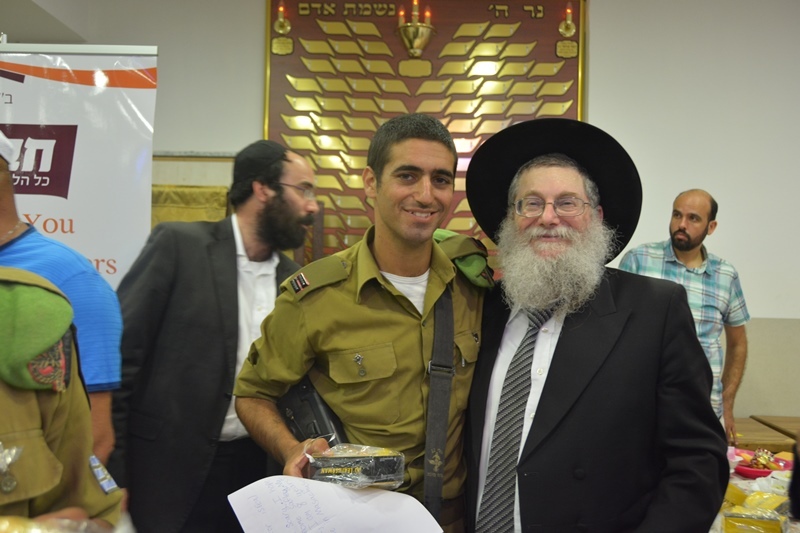 The mayor Mr. Beni Vaknin was proud to attend the magnificent gathering honoring Rabbi Shimon Bar Yochai. 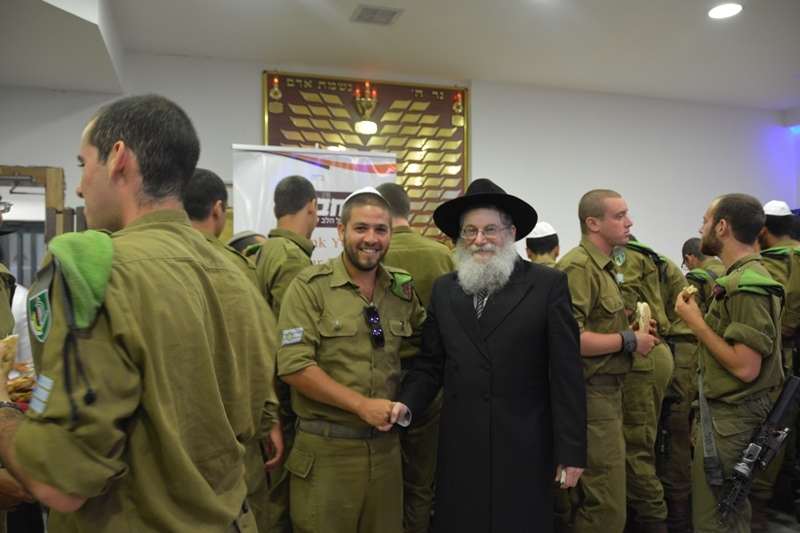 Rabbi Gorelik, who coordinates and organizes the programs and the parade in the city, spoke about the merit of attending the parade since Rabbi Shimon Bar Yochai is also here blessing each and everyone. 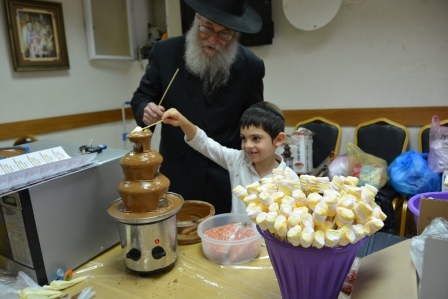 The program began with the performance of the school band, followed by children from different schools reciting 12 Torah passages, a special soap bubbles shoe and great raffle prizes. The parents and children thanked Chai for the tremendous investment and dedication for the wonderful event. 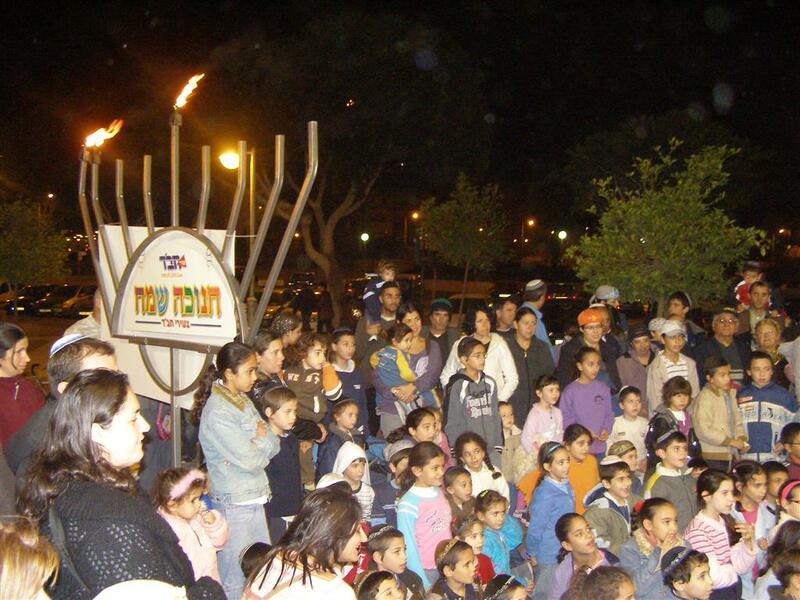 Hundreds of families in every neighborhood in the city gathered to celebrate Lag Bomer with the traditional lighting of bonfires. 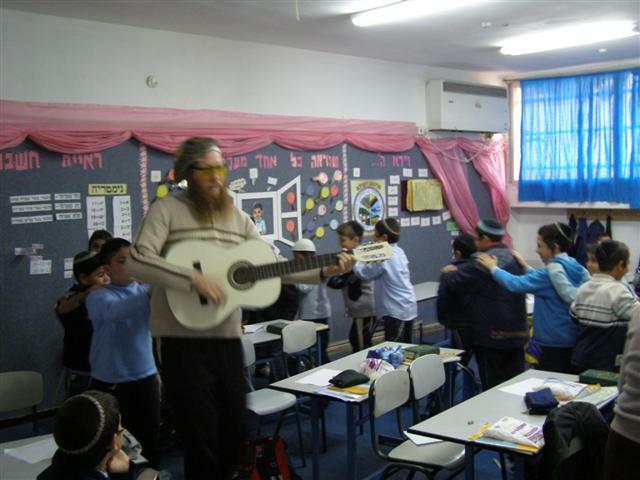 They joined in the singing and dancing and learned about the sacred Kabbaliast Rabbi Shimon Bar Yochai . 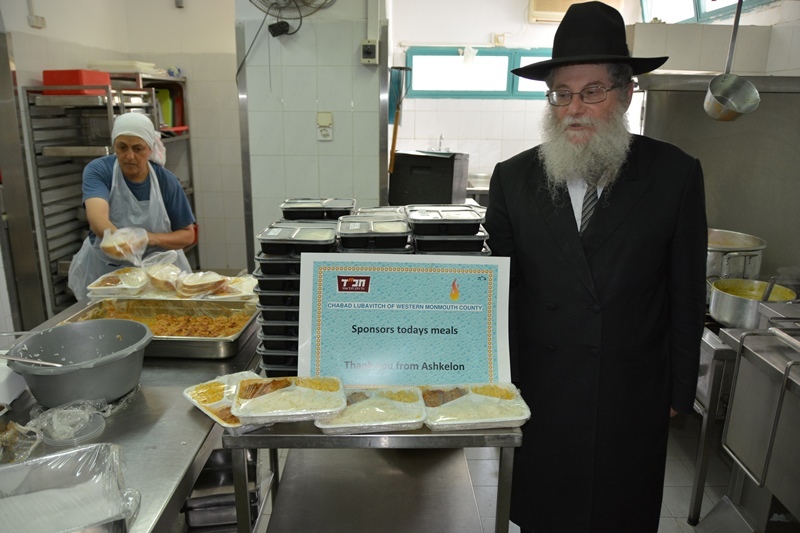 Food and refreshments were served and the children enjoyed a special program. 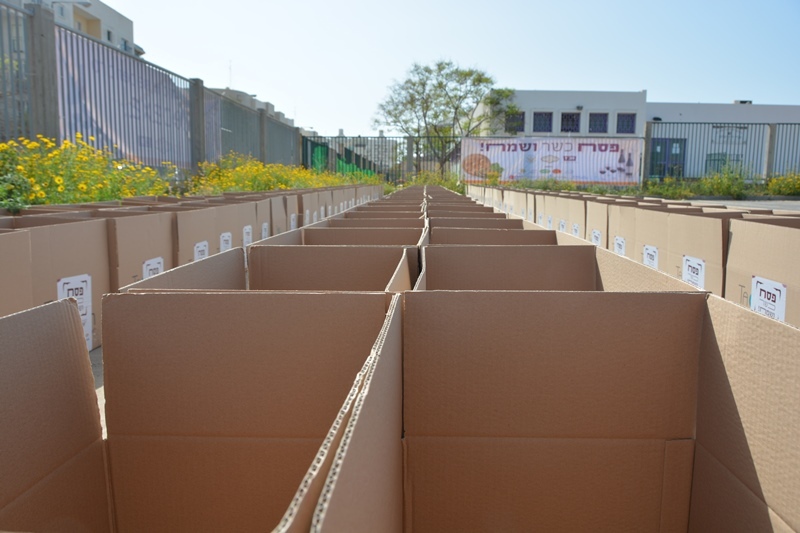 The Chesed Center Of Chai Ashkelon distributed close to a thousand basic food packages for the Passover holiday. 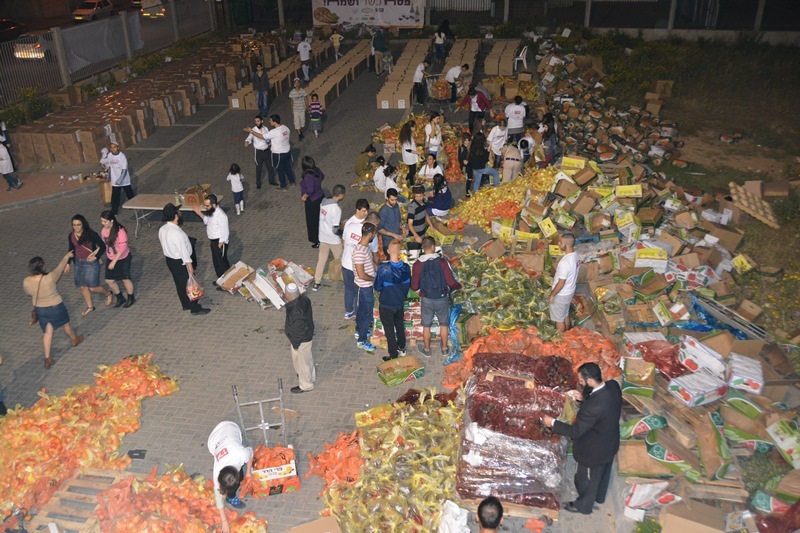 Hundreds of needy people who came to receive the packages pointed out that the distribution helped them celebrate the holiday, without worrying, and joyfully. 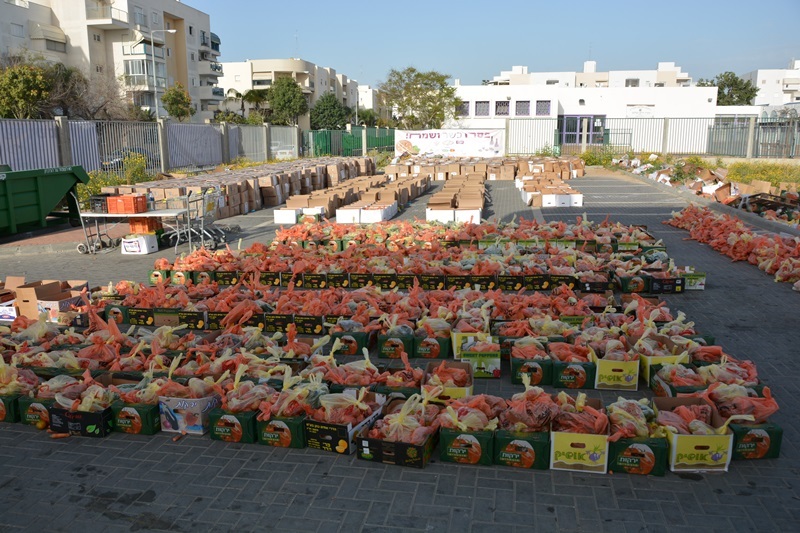 In addition, many extensive packages were distributed to families in deep financial difficulties. 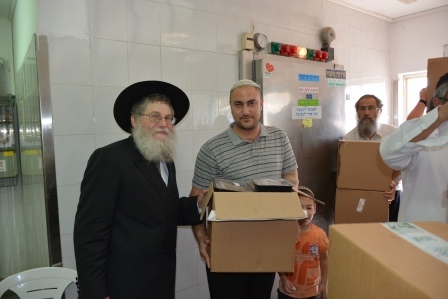 700 children of the Chai daycare centers and kindergartens attended the annual Passover fair. 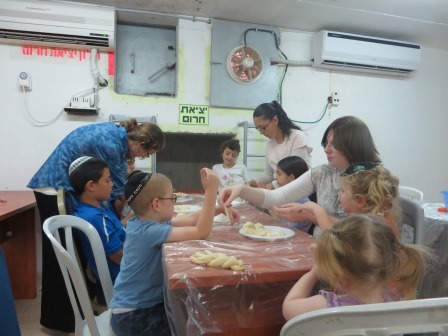 Wearing chef's hats and aprons they kneaded, rolled and baked the traditional round handmade Shmura Matzot. 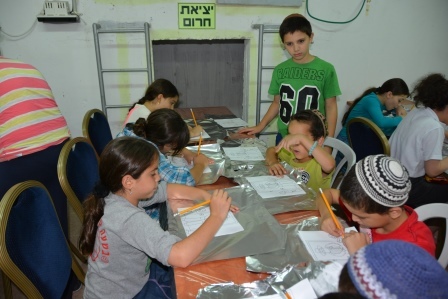 They also learned about the traditions and customs of the holiday through games, crafts and fun activities. 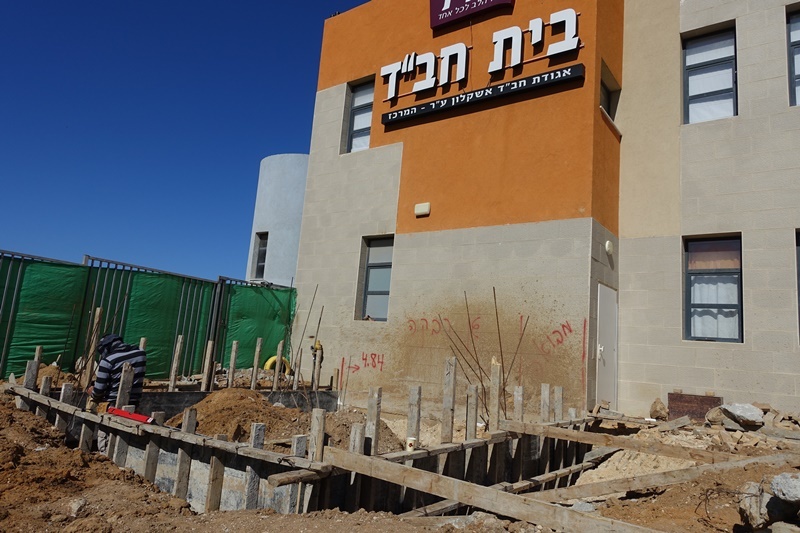 Chai operates the largest private preschool system in Ashkelon, due to the tremendous investment of the dedicated director and staff members. 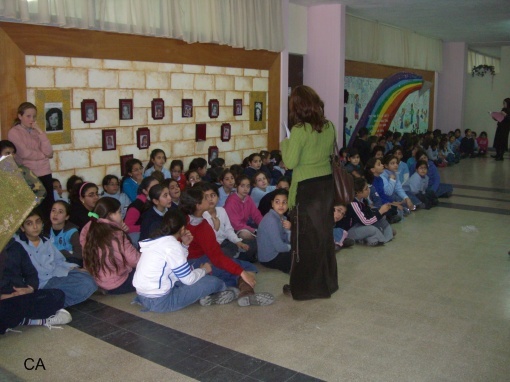 The professionalism, caring and warmth along with the learning skills and values instilled in the children have contributed to Chais reputation as an excellent educational institution. Happy children is Chai's educational motto. 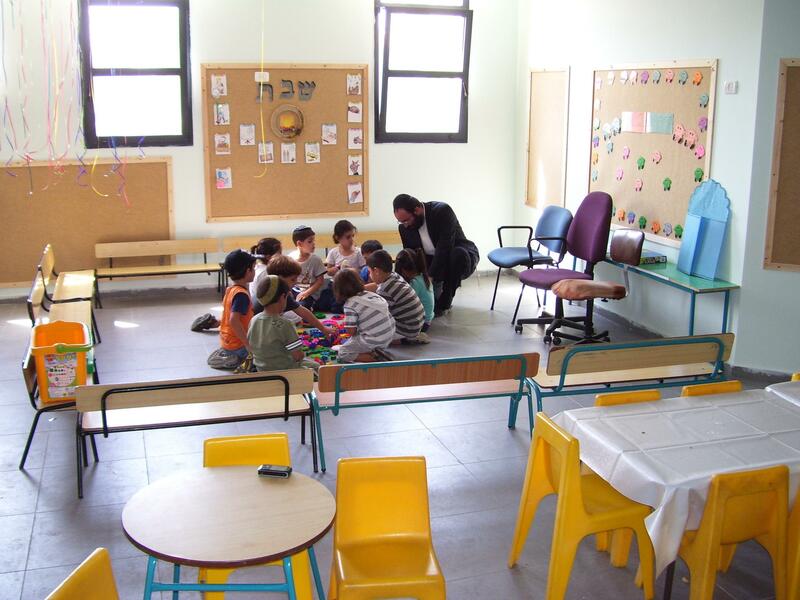 Great emphasis is placed on insuring that children are happy to come to school each morning. 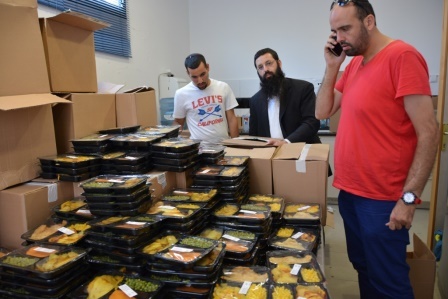 In the festive month of Adar this is stressed even more. 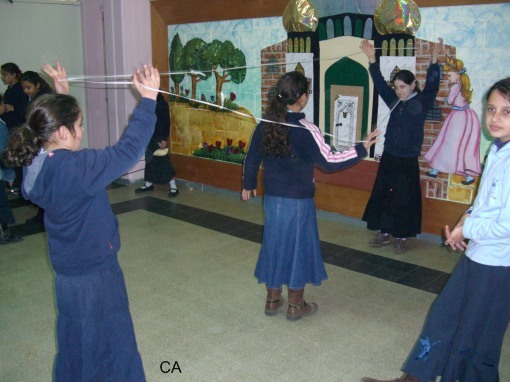 The children enjoy a variety of fun programs including dancing, costumes, competition and plays to the delight of the children. 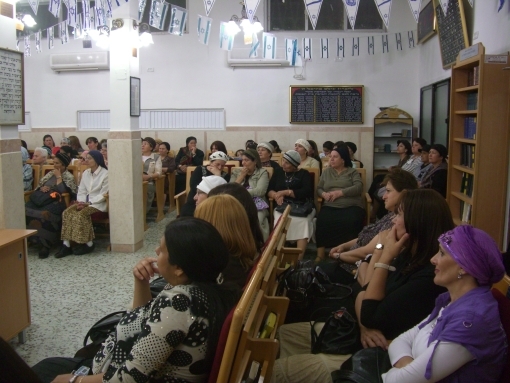 Hundreds of women packed the hall for the annual gathering commemorating the passing of Rebetzin Chaya Mushka O"BM wife of the late Lubavitcher Rebbe. The evening is the climax of the women's functions throughout the year. 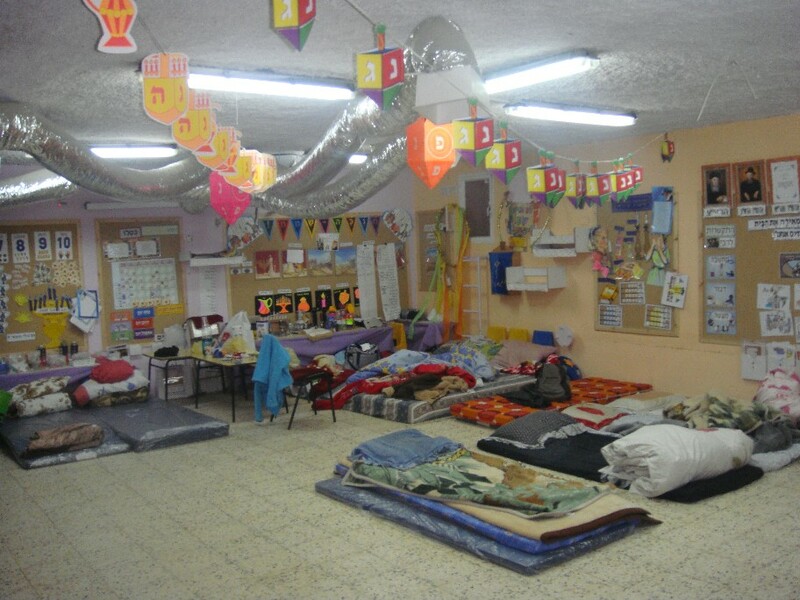 These include monthly gatherings, weekly classes, assistance to mothers and newborns. 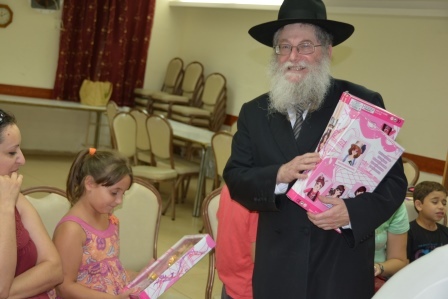 The women were greeted warmly by the Neshei Chai organizers and each received a gift. The tables were elegantly set with a light meal. The theme of the evening was giving the benefit of the doubt. 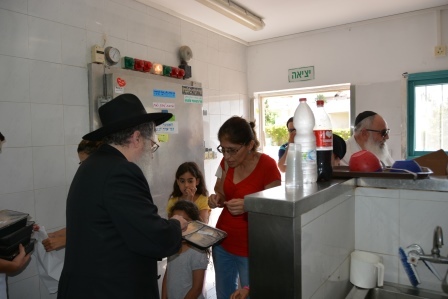 Rabbi Gorelik lit a candle and learned Mishnayot in honor of the Rebetzin. 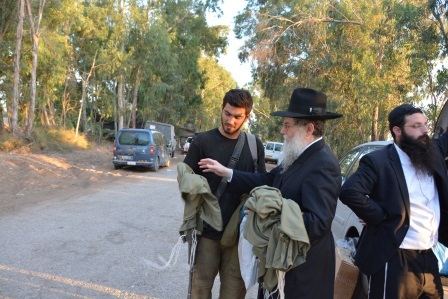 Rabbi Lieberman the director of Chabad addressed the crowd. 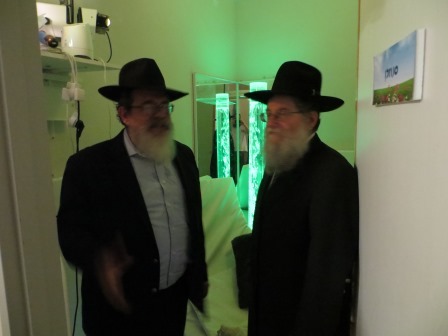 The program included a video of the Lubavitcher Rebbe. 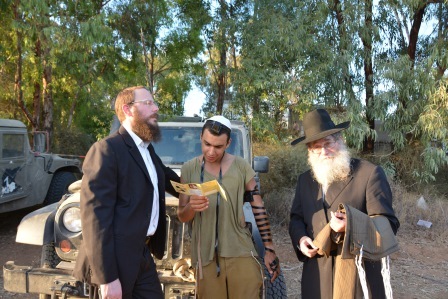 The Chai actor M. Veigel performed humorous and emotional acts. 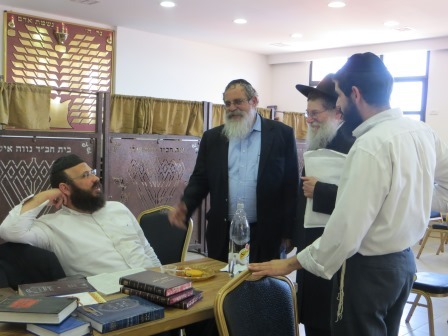 The keynote address was by Rabbi Katzbi on giving the benefit of the doubt in marriage in the light of Chassidic teachings. 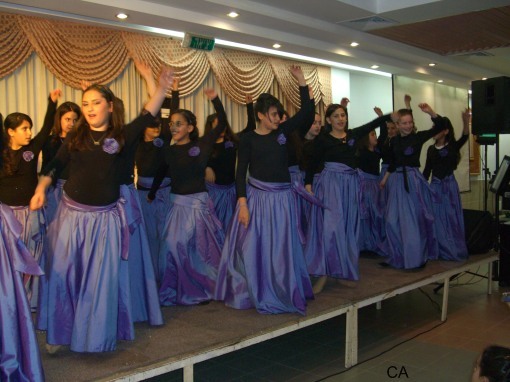 The girls' school performed a spectacular dance accompanied by the singer Yaffa with songs written especially for the evening. The evening ended with raffling of the Chinese auction on expensive items donated by local businesses. 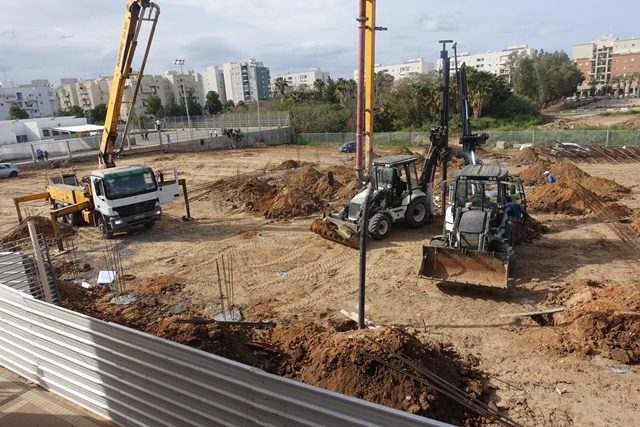 The Eilat Ashkelon Pipeline Company organized a fascinating program in the Or Menachem Chai boys' school. 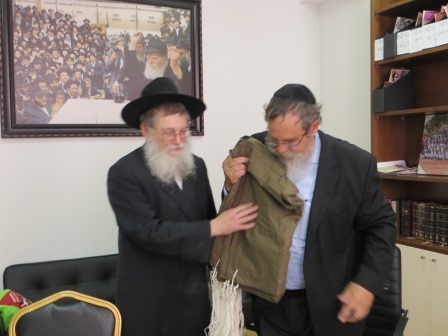 The program was initiated by courtesy of its vice director Mr. E. Friedman, a personal friend of Rabbi Lieberman, director of Chai Ashkelon. 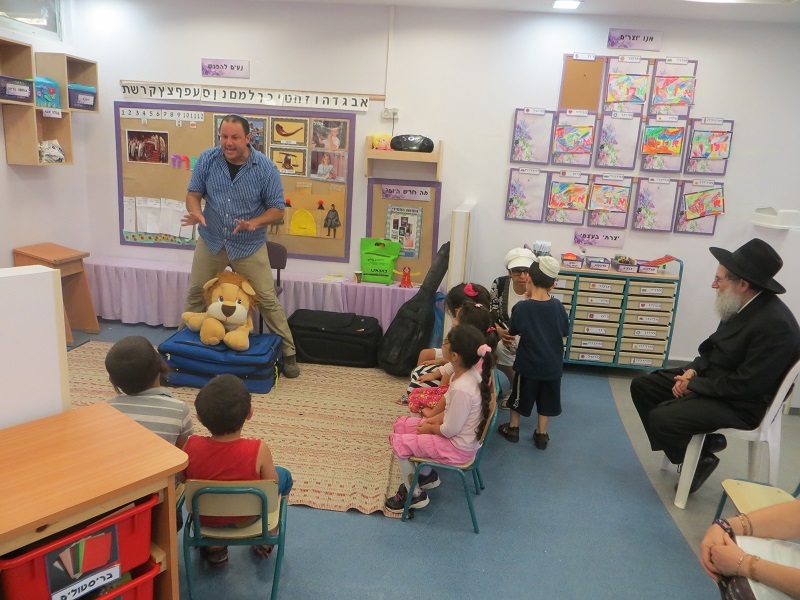 Mr. Friedman came with senior members to watch the children's' excitement in the special activities. 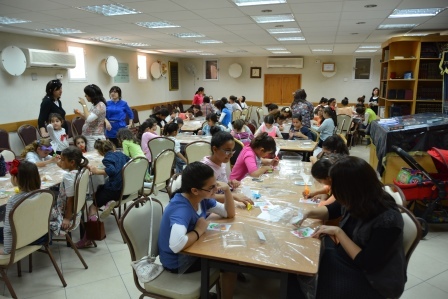 The children prepared flutes from reeds, recycled candles, colored sand and many other crafts and learned about green environment in a fun way. partnership and wishes them much success. Chai emphasizes preparing children for first grade. 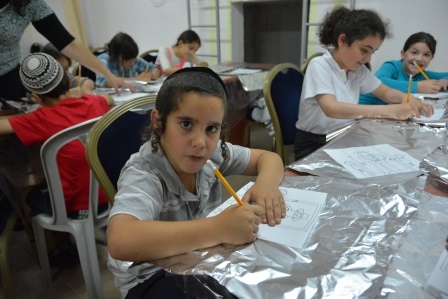 The children learn letters reading, writing and thinking skills during their pre1a class. This way they come prepared for school. Indeed children who learned in the Chai preschools are sought after by many schools. As a preparation for first grade the children spent a day in school where the first grade teacher prepared an interactive program for them. 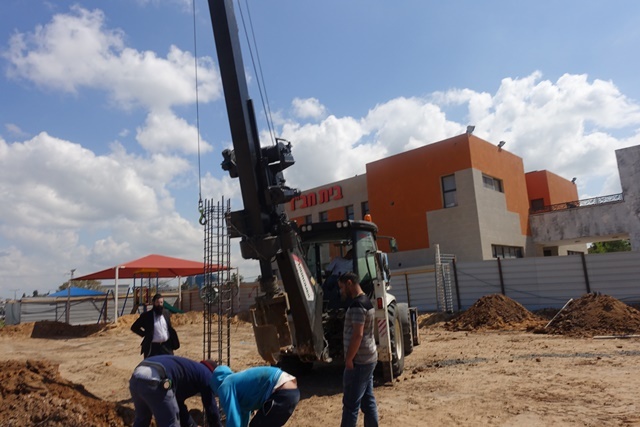 They were introduced to a school and classroom structure. 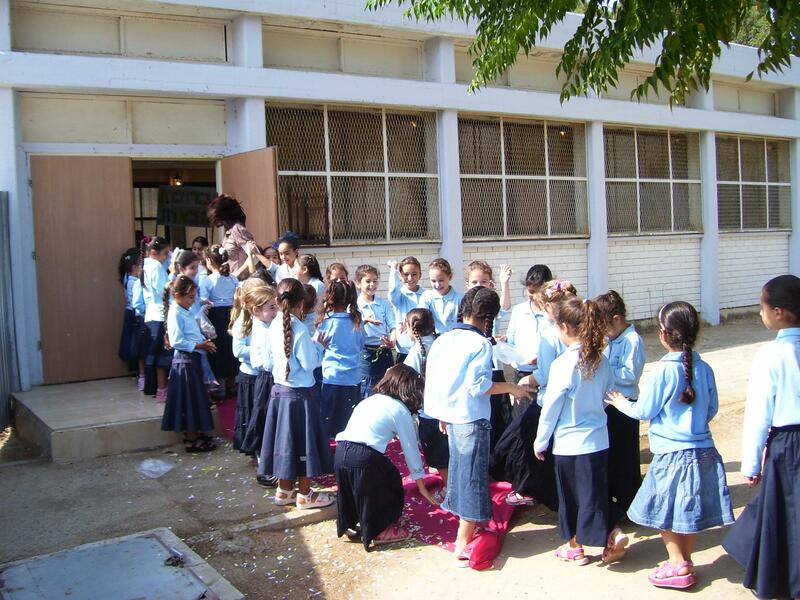 Each child received a preparation for school booklet and a gift. The children were happy to meet their friends from kindergarten who were now in school. The visit to school with their kindergarten teachers helps alleviate the anxiety many children have from school and helps boost their self confidence in the first days at school. 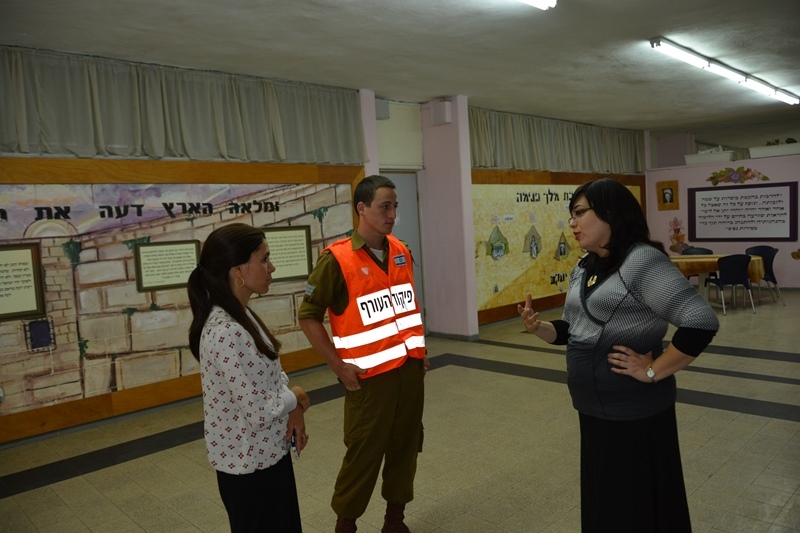 Chai schools emphasize the importance of safety on the road. 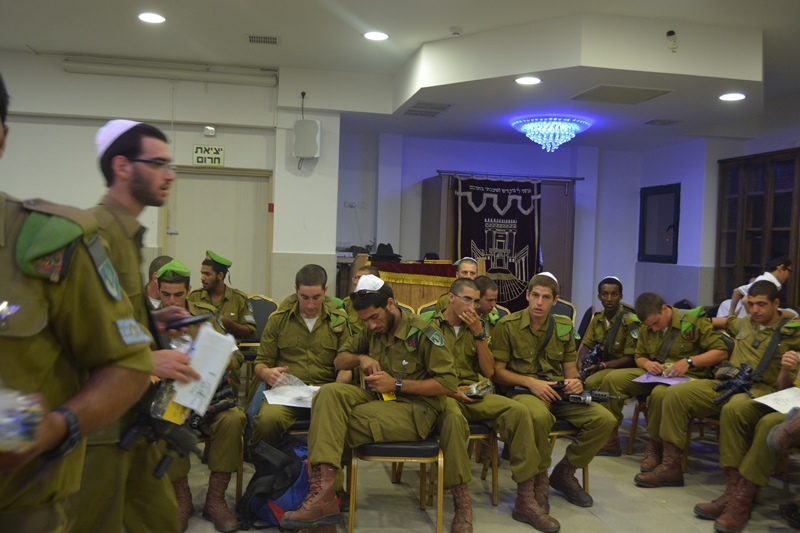 After many lessons, programs and activities teaching the importance of the topic, the students went to practice in the field of the national safety organization. They learned how to cycle and cross safely in accordance to the road signs and crosswalks. After a few hours of practice the children felt that they had gained new knowledge and awareness of road safety. 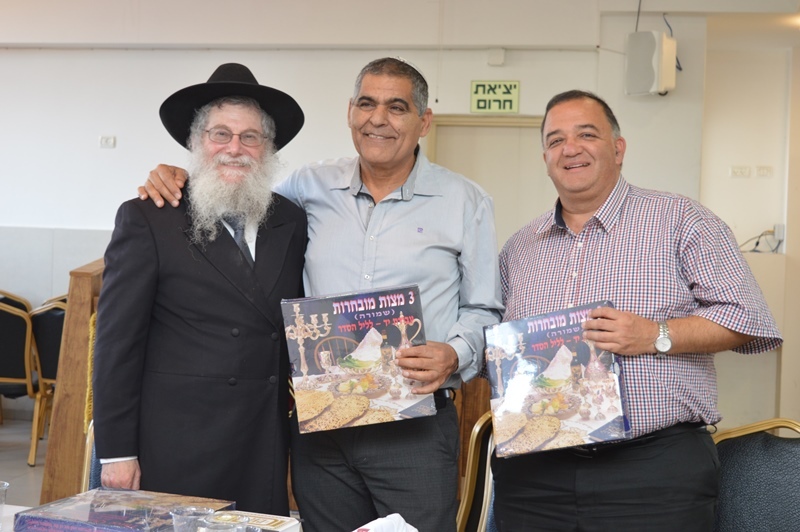 The first grade of Chai Ashkelon celebrated the receiving of the Sidur- prayer book. 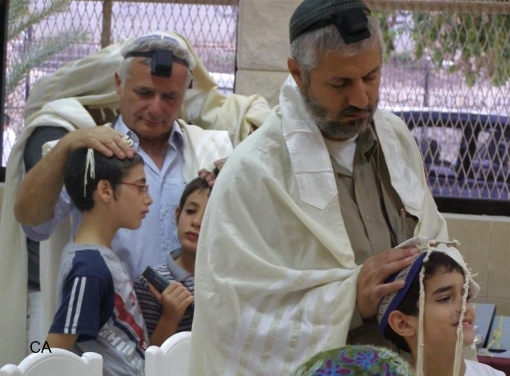 The ceremony took place in Jerusalem by the Kotel- Wailing Wall. 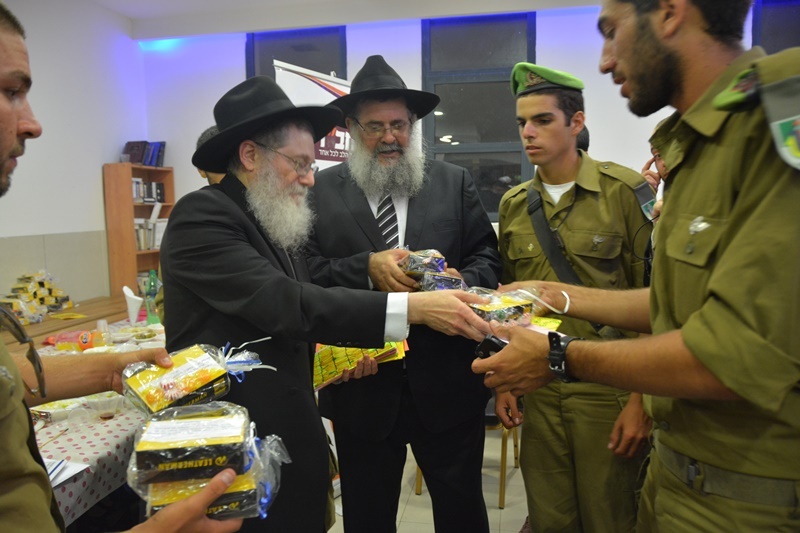 Each child received a Sidur with his name inscribed on the cover. 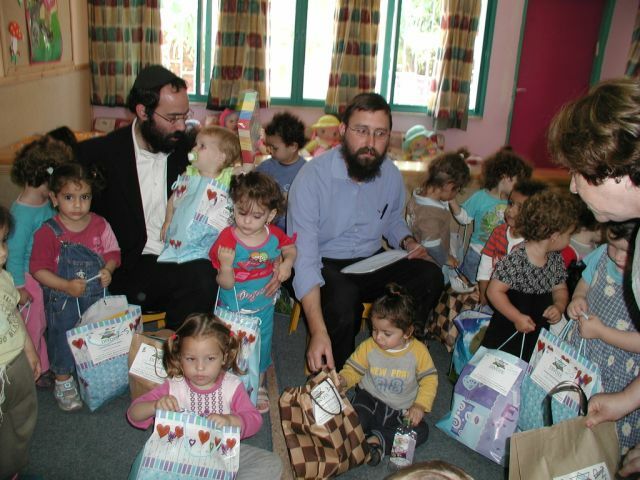 This was followed by a festive brunch where the children performed for their parents. 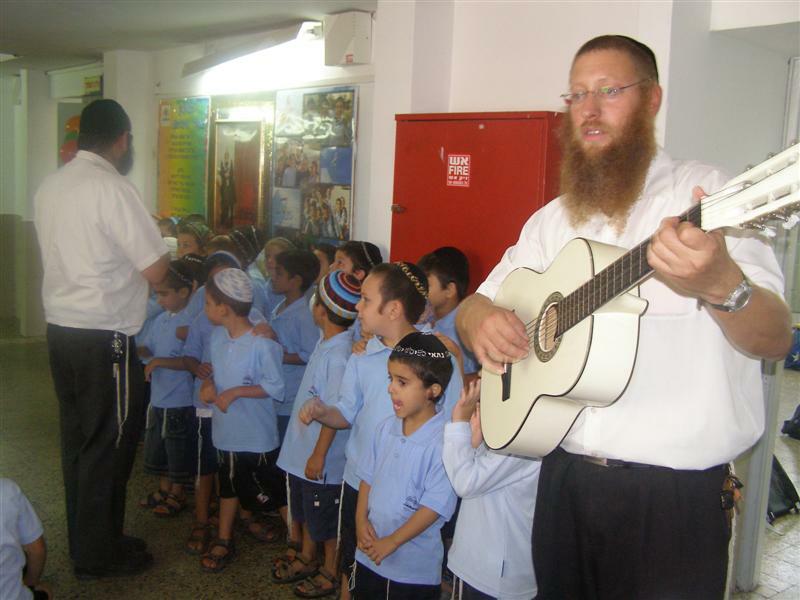 Chai Schools emphasize teaching our Jewish tradition based on the Chassidic values of joy and love for our fellow Jews. 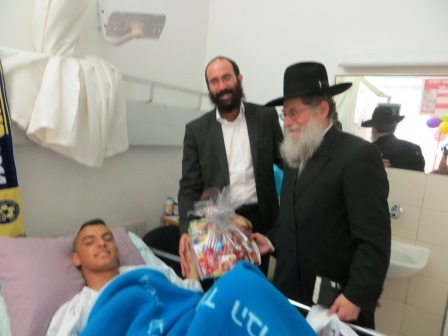 Chai Ashkelon sponsored by Collel Chai spread the holiday joy to hospitalized children. 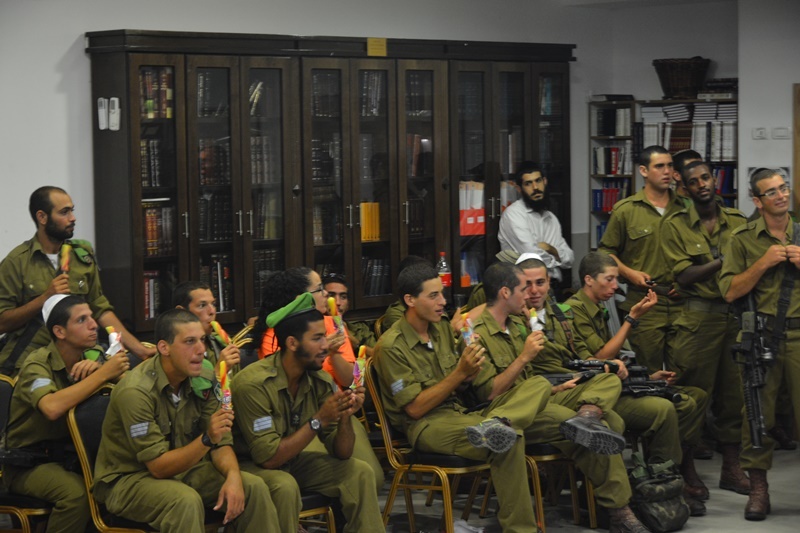 The Chanuka parties began with lighting the Menora, songs, contests and quizzes. 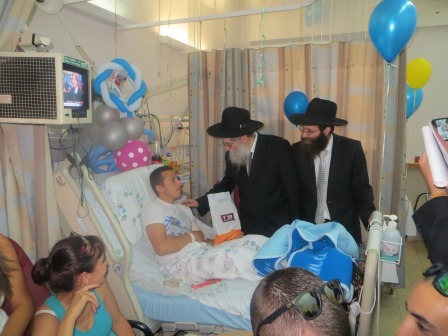 This was followed by the distribution of expensive Chanuka presents to each hospitalized child. 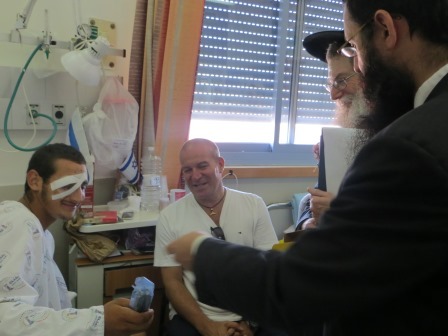 The staff and parents express their deep gratitude for the programs which bring light and smiles to the suffering children. 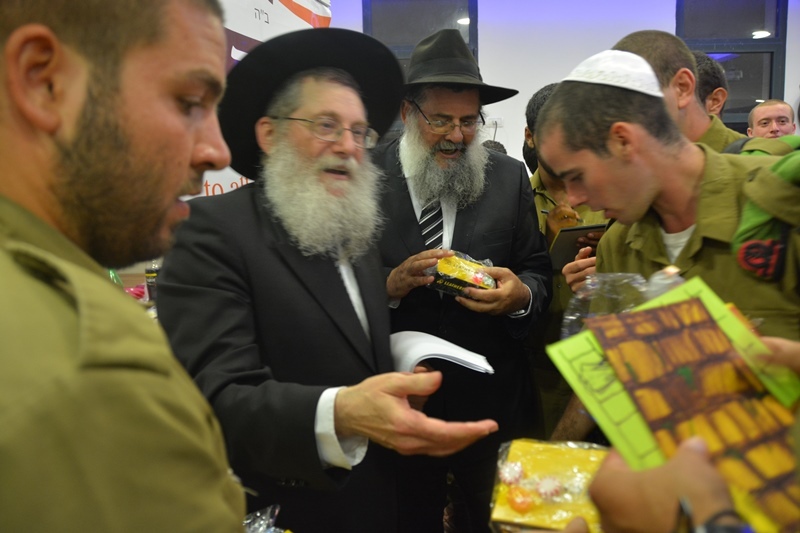 Chai Ashkelon sums up the Chanuka Holiday with dozens of programs. 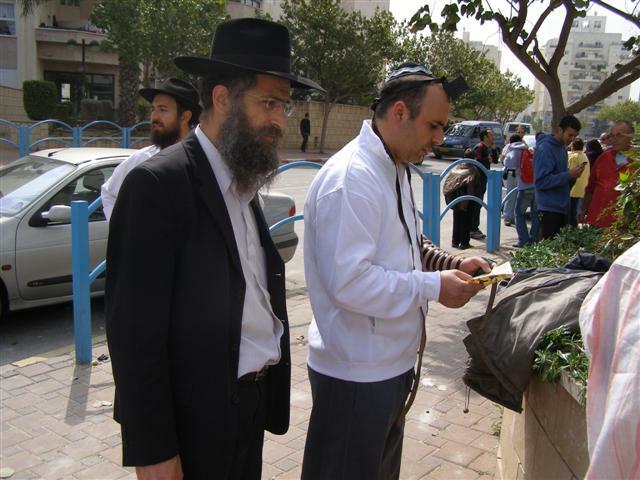 The public Menorahs were lit each night in a different neighborhood. 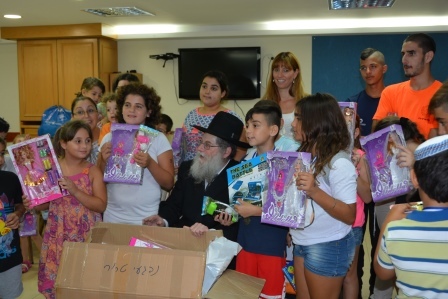 Dozens of children and their parents learned about the meaning of Chanuka, watched a magic show, received prizes and enjoyed the traditional Sufganyot doughnuts. 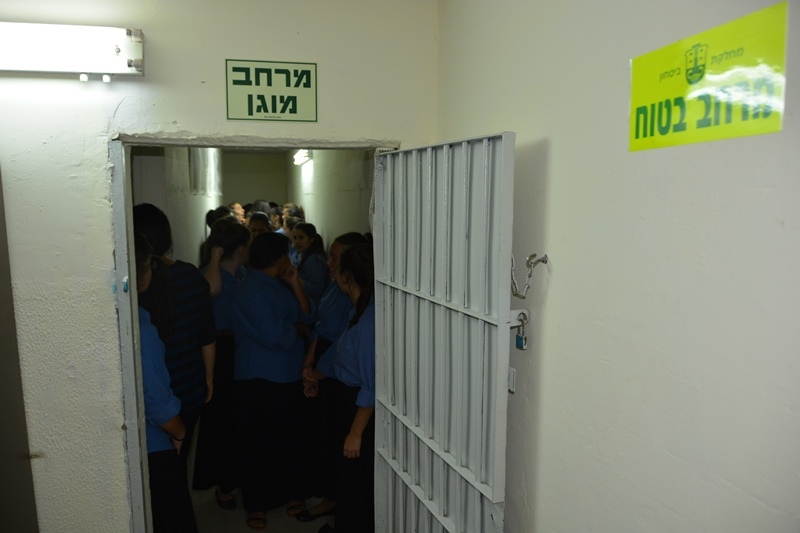 The Menoras were also lit in the old age homes and Barzilai hospital. 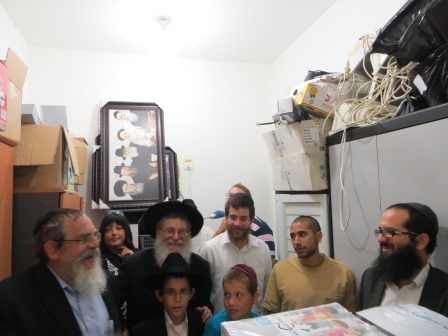 In addidtion hundreds of children attended Chanuka parties in their local Chai Houses. 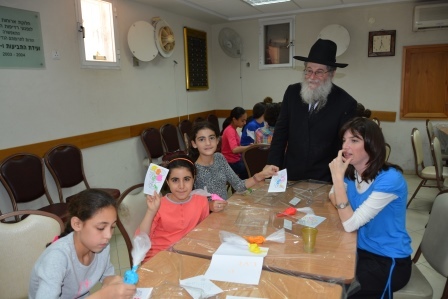 They participated in diverse activities, learned about the message of Chanuka, said the 12 verses of Torah, prepared Chanuka crafts received prizes and refreshments. Many candles were lit in stores thus spreading the light to staff and customers. 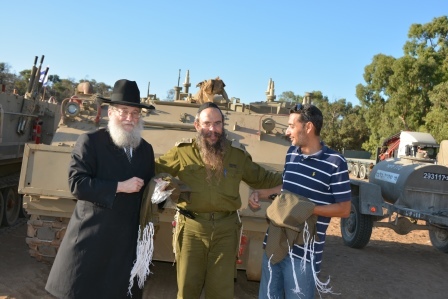 Each night the procession of cars with Chanuka Lights lit up the city and spread the miracle of Chanuka to the entire city. 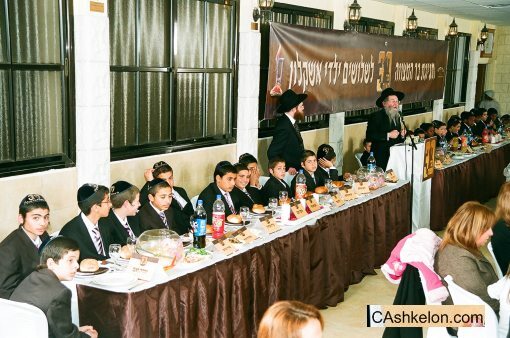 Chai Ashkelon organized a grand Bar Mitzva Celebration for 30 boys. 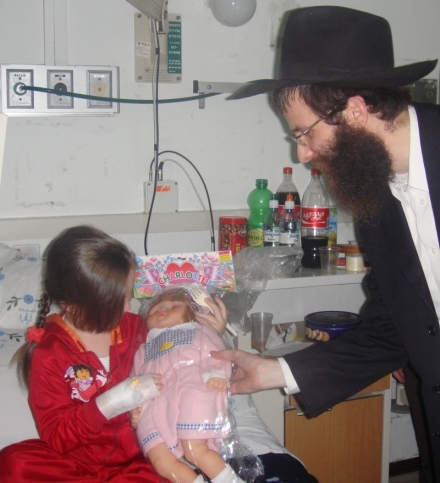 Rabbi Metzger, the Chief Rabbi of Israel blessed the children. 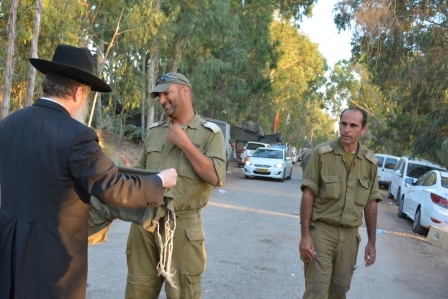 The Mayor arrived straight from the airport to greet the boys. 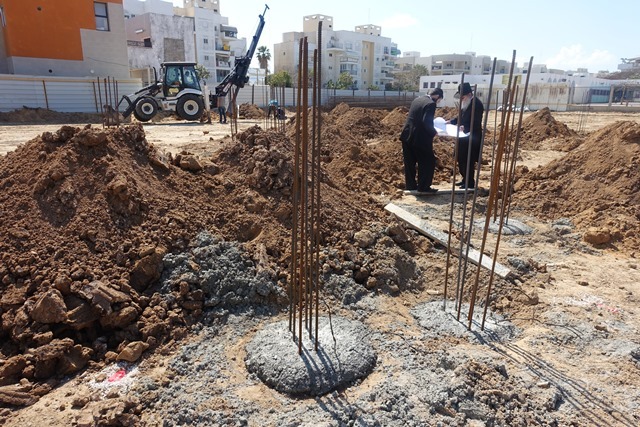 He was returning from Geneva where he staunchly defended the Israeli Defense Forces in a court case against the Operation Molten in Lead in Gaza. 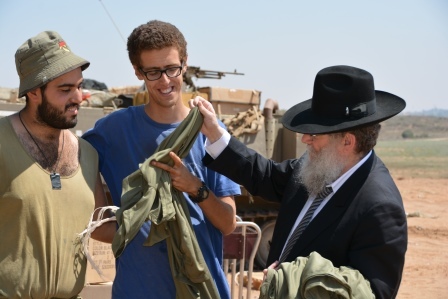 Rabbi Lieberman, director of Chai Ashkelon, warmly addressed the boys and their families. 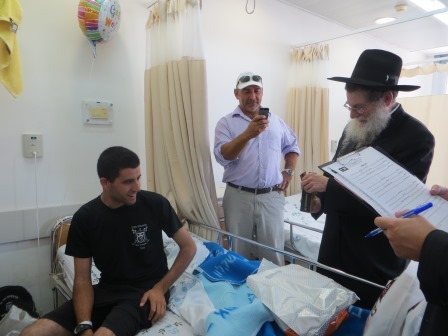 He welcomed them to the Shlavim Therapeutic Center for special needs children, which was built entirely from generous donors. 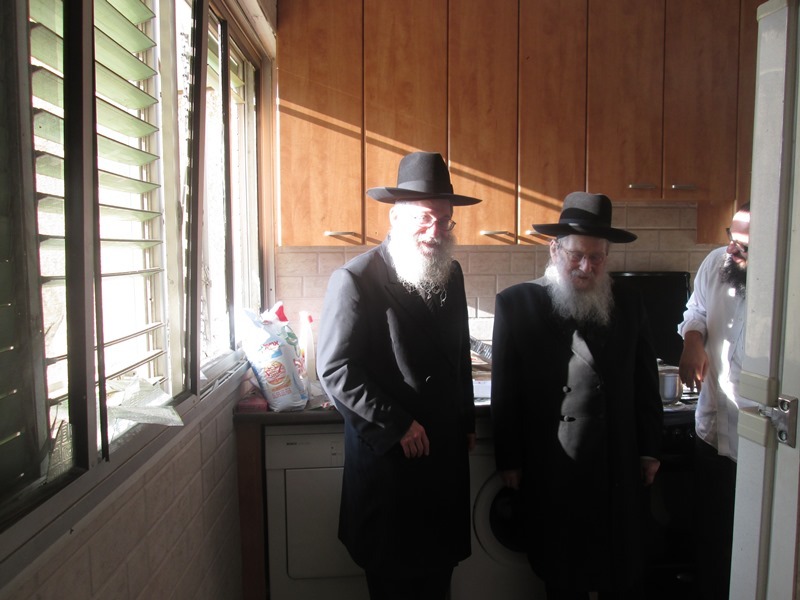 The evening began with a festive barbecue followed by the gathering indoors. 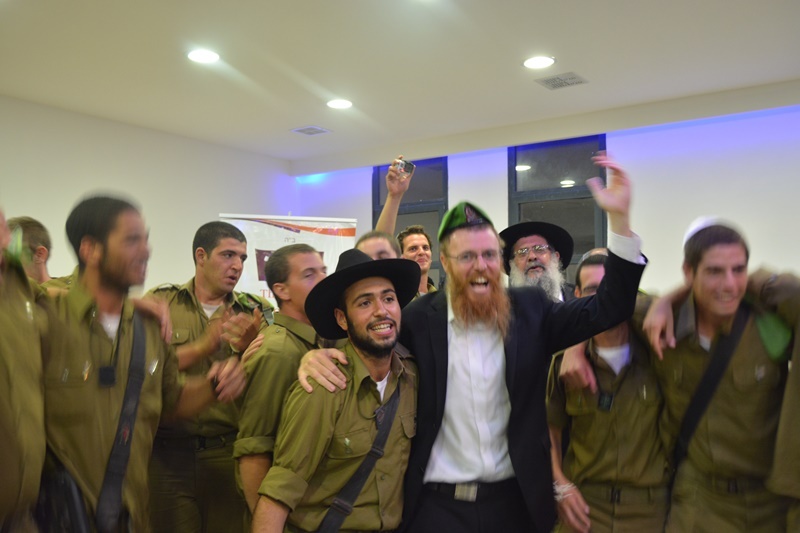 The greetings and speeches were followed by dancing and a magic show. Each boy received expensive presents. The evening was sponsored by an anonymous donor. 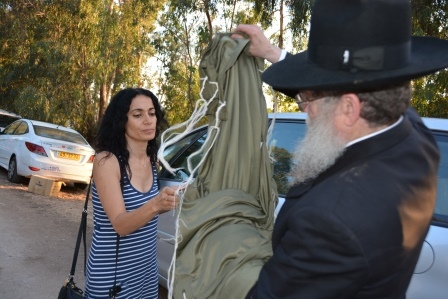 Over 100 women participated for the annual Shavuot gathering. 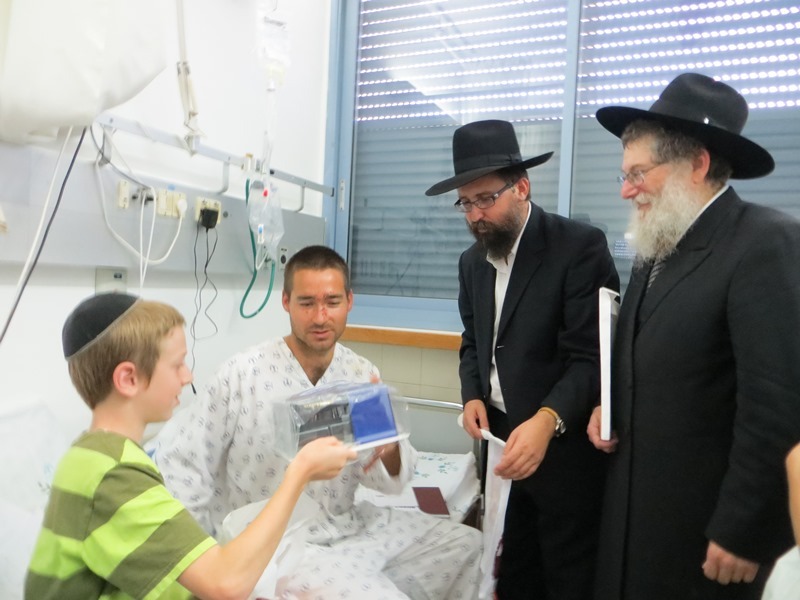 Mrs. Shushan spoke about the significance of the receiving of the Torah at Mount Sinai to our modern day. Melodies of a clarinet accompanied the evening followed by the traditional lavish bar of dairy foods which the women look forward to each year. 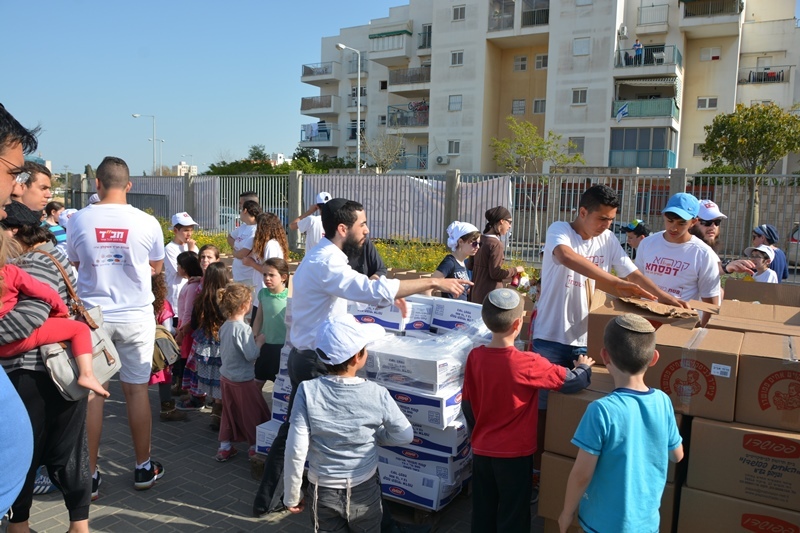 Thousands of children marched in the central streets of Ashkelon in the annual Lag Bomer Parade. The procession was lead by the school band. 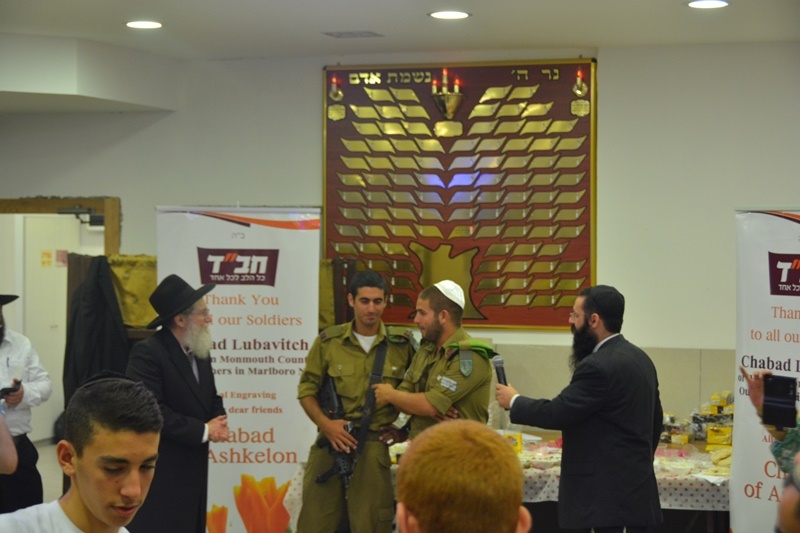 Flags, prizes and surprises were distributed. Floats and huge dolls of religious themes accompanied the marchers who gathered in the huge sport stadium. 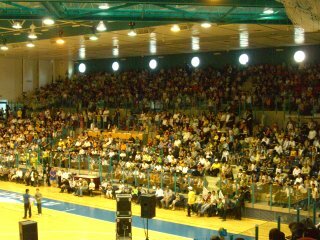 The hall was overflowed and too small for the huge crowd. 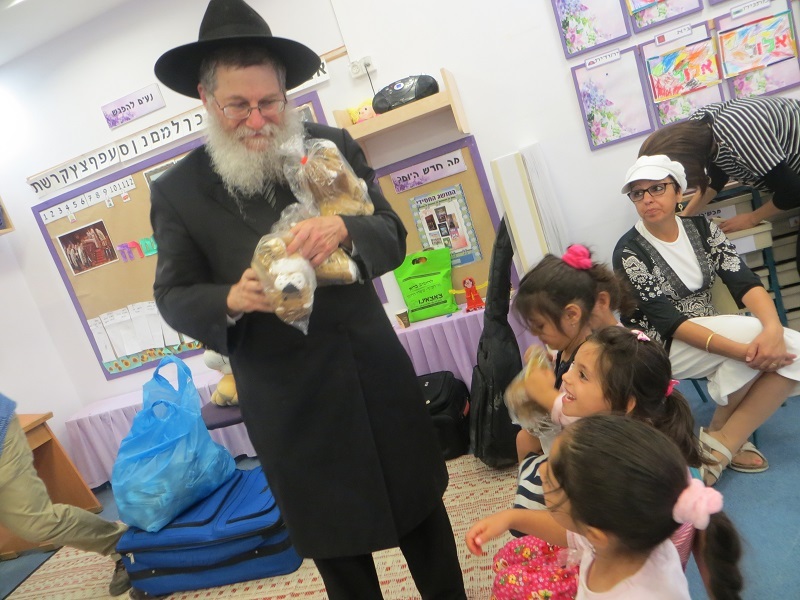 Rabbi Lieberman welcomed the children and parents and spoke about the significance of the holy day. 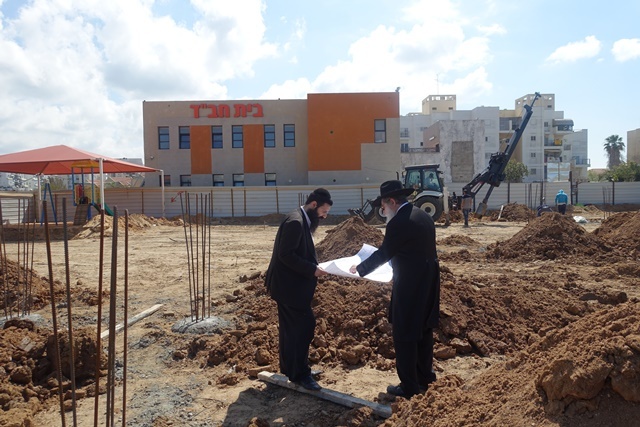 The Mayor Beni Vaknin who greeted the assembly, and Mr. Shani , head of the dept. 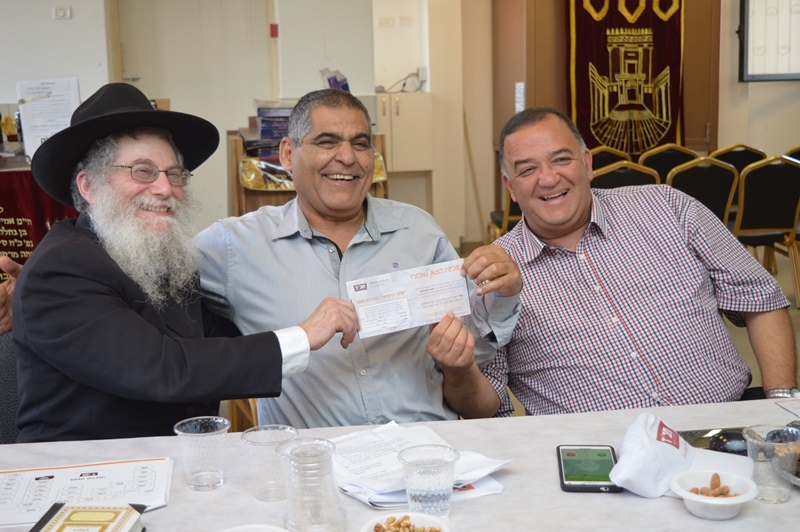 of culture pledged their support for Chais programs. 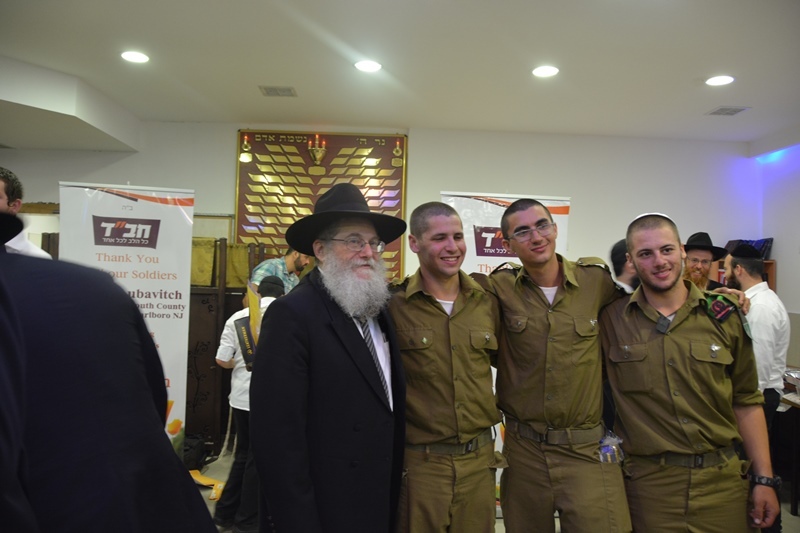 Many other dignitaries attended the gathering. 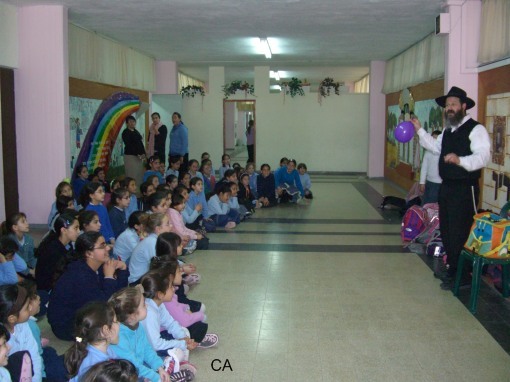 The children sat spellbound at the performance of three professional jugglers and many expensive prizes were raffled. 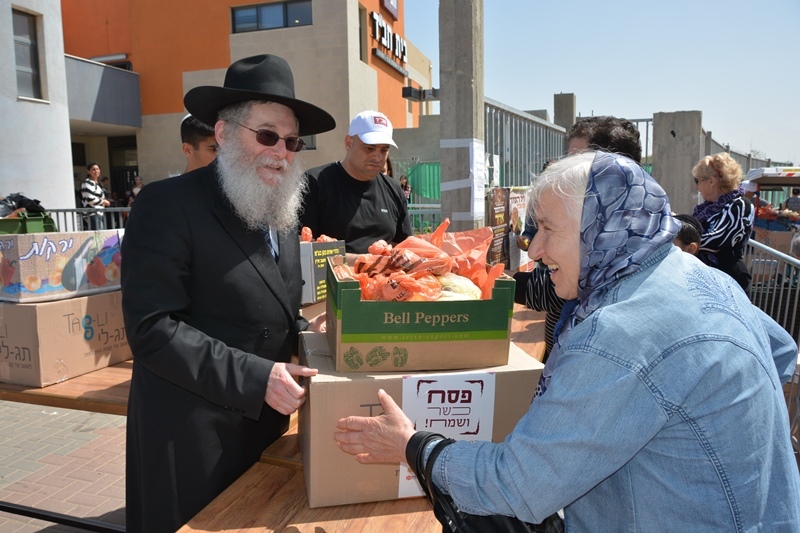 The spectacular parade was organized by Rabbi Gorelik, director of the Shimhon Chai House and yearly programs for the entire city. He thanks all those who volunteered in organizing the program and contributed to its success. 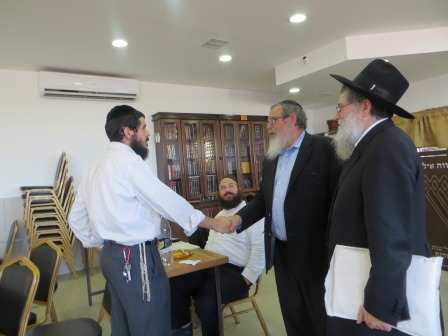 Mayor Benny Vaknin hosted Rabbi Lieberman and the Chai Shlucim in his office in honor of the Lubavitcher Rebbe' s birthday on the 11th of Nissan. 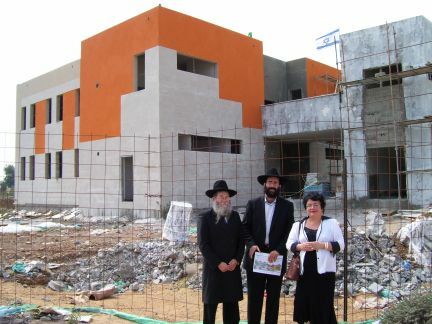 Also participating were Mr. Shlomo Cohen Deputy Mayor' Mrs. Sopie Baylin vice Mayor and other guest. 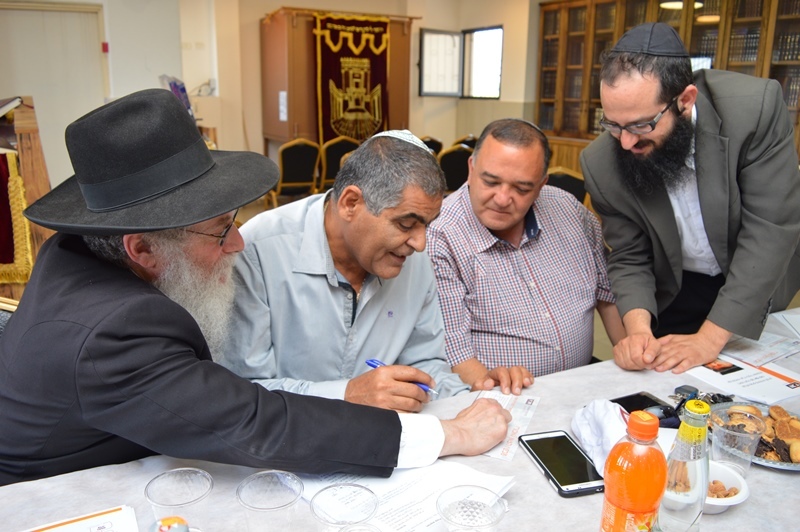 The ceremony was finished with the participants writing a letter in the Sefer Torah being written for the safety of the citizens of Ashkelon. 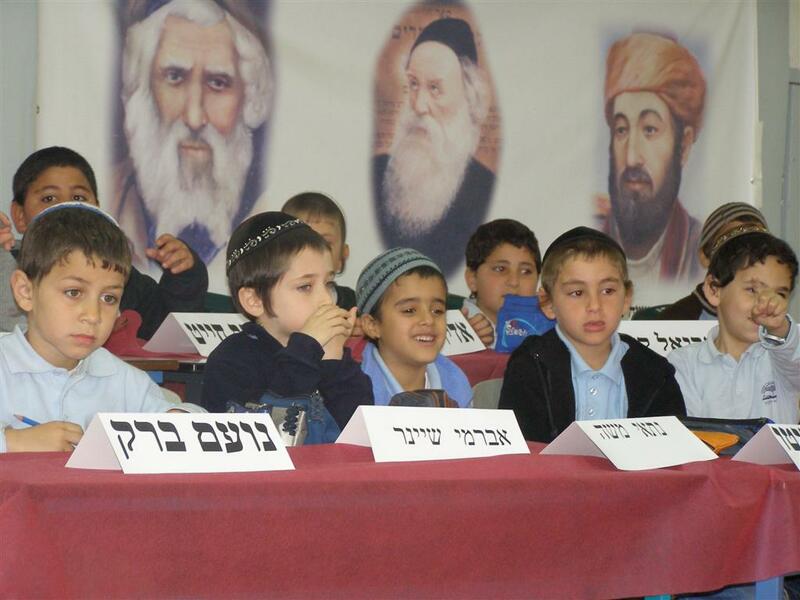 Students participated in the annual Passover quiz. 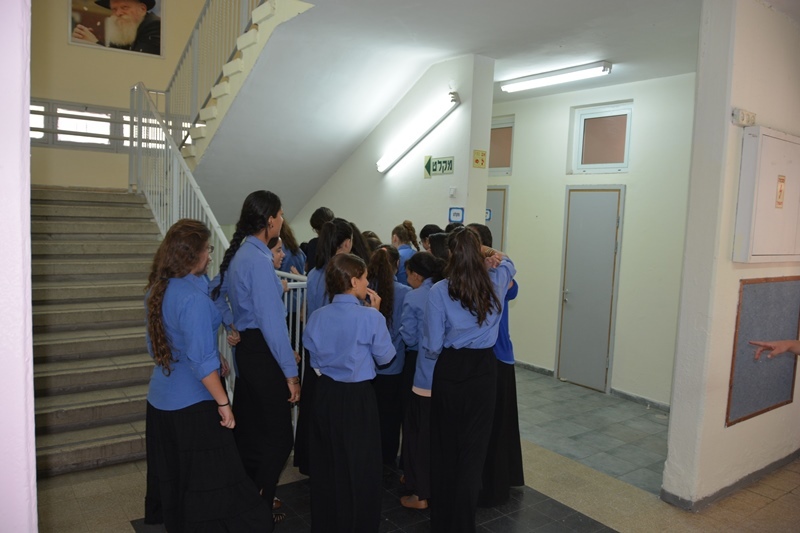 After competing in intermediary tests, the outstanding students reached the final stage. The finalists portrayed expertise in the intricate laws and customs of the holiday. 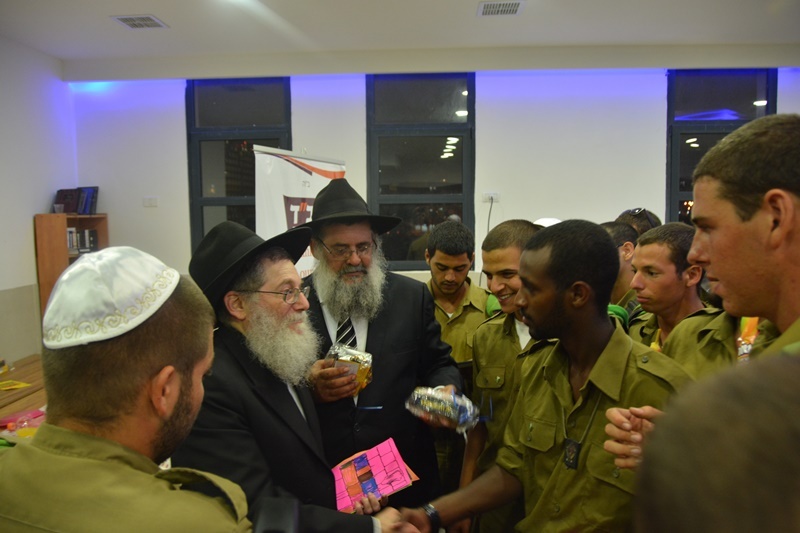 Each participant received a prize and the winners received expensive silver goblets and elegant Hagadot for the Seder. 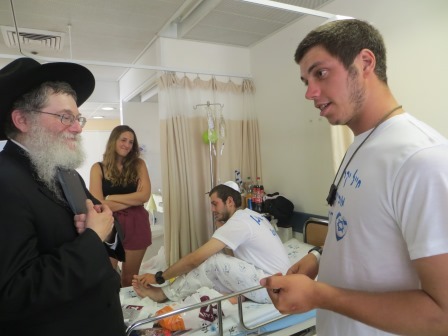 Chai Ashkelon encourages the students to excel. 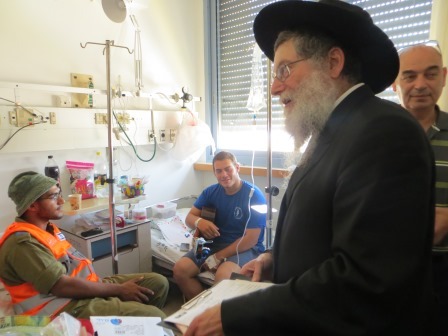 Representatives of Chai visited the wounded soldiers of Operation Molten Lead.Amongst the injured wad a brother of a student in the Chai School. 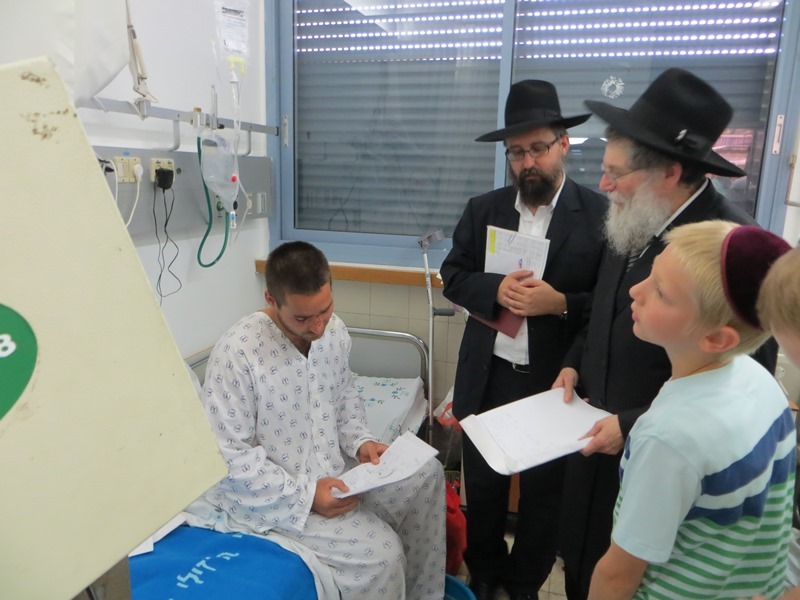 All of the children and staff are praying for his speedy recovery. 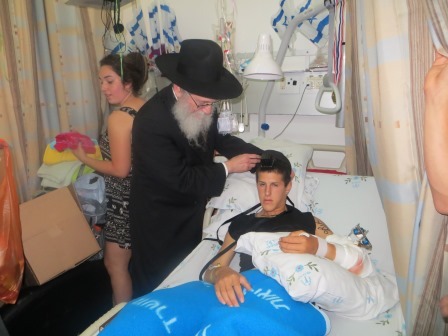 Please join us in praying for Ben the son of Katie Shifra. 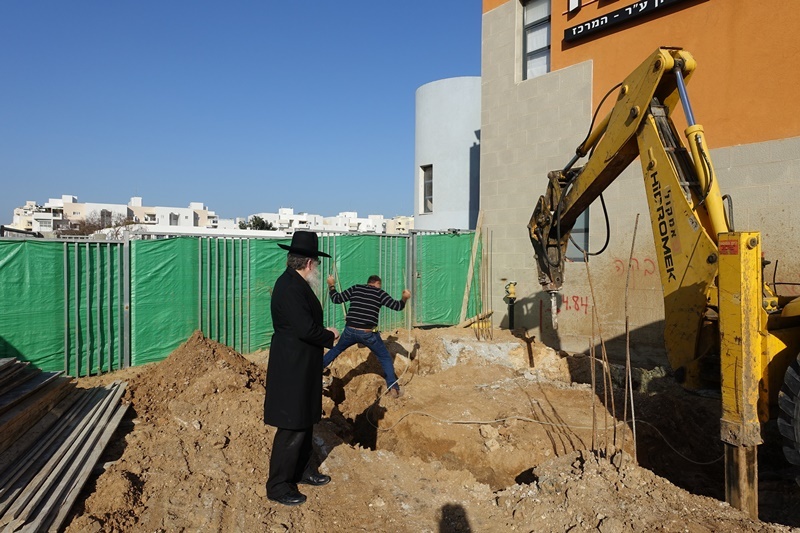 Numerous graves and headstones were damaged in Ashkelon following a direct hit by a rocket. 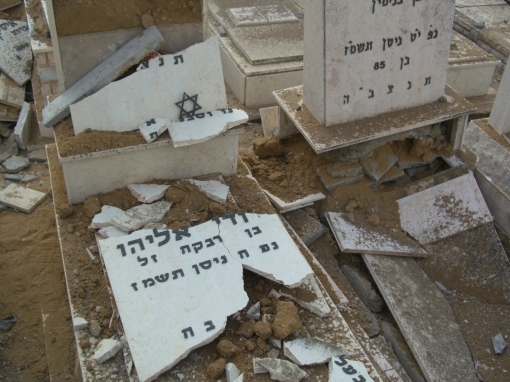 The above photo was taken after the desecrated graves were already re-filled with dirt. 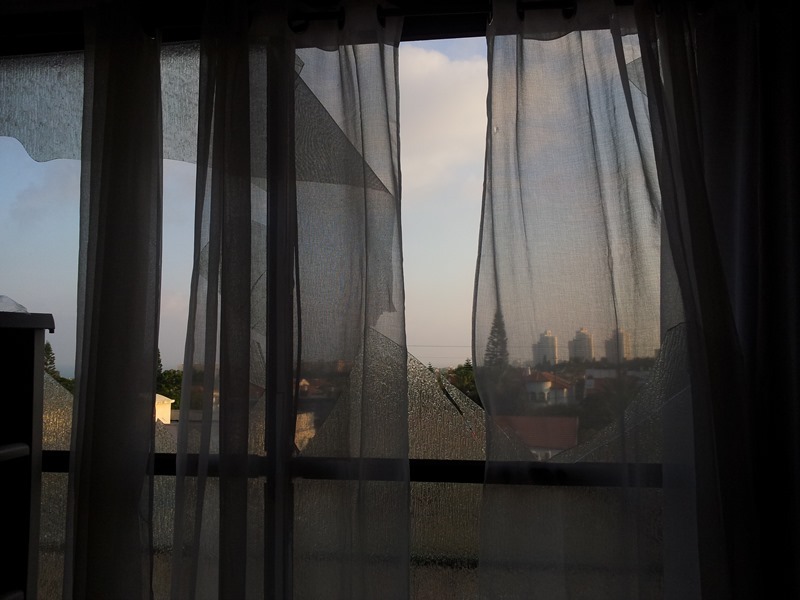 This and other recent attacks leave our children fearful of playing outside, with most trying to stay as close as possible to protected shelters. 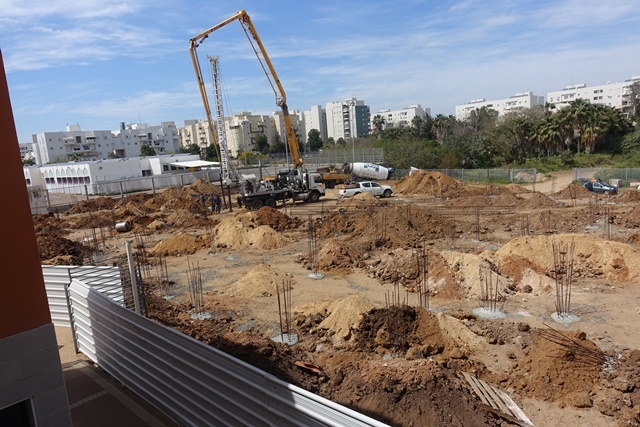 Chai Ashkelon is working to open as soon as possible a Regional Trauma Treatment Center, where residents will find therapy rooms & therapists, psychologists, group therapy rooms and everything else they could need for moral and mental support. 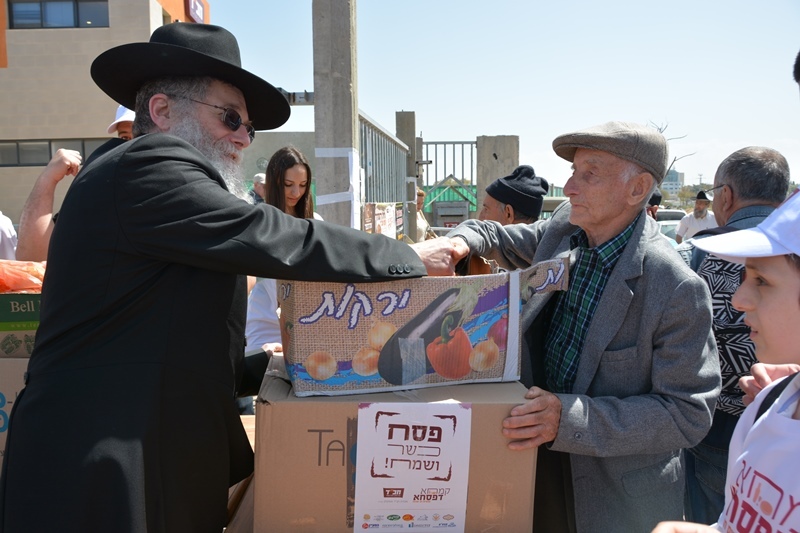 Every year Chai Ashkelon distributes food to the needy during Pesach and this year was no different – with over 720 food packages prepared to help them get through the holiday. 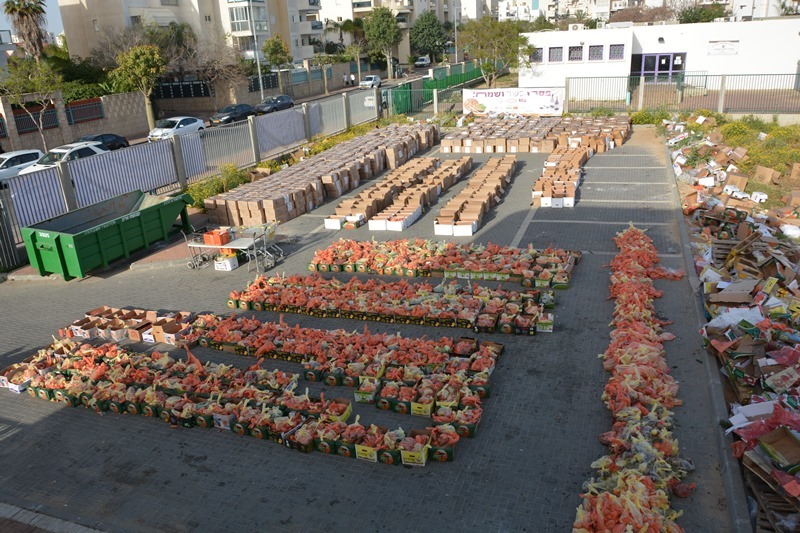 Chai Ashkelon warmly thanks all of you who helped make this possible, providing food to those who could not provide for themselves. 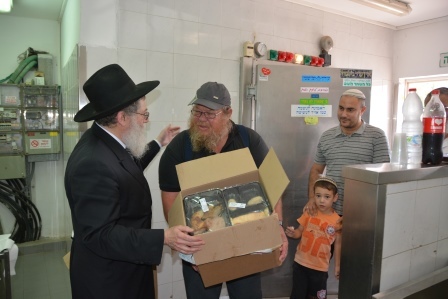 Unfortunately this is not a one time event, Chai Ashkelon’s Meals-on-Wheels program delivers hundreds of meals daily, throughout the year so your continued donations are appreciated. 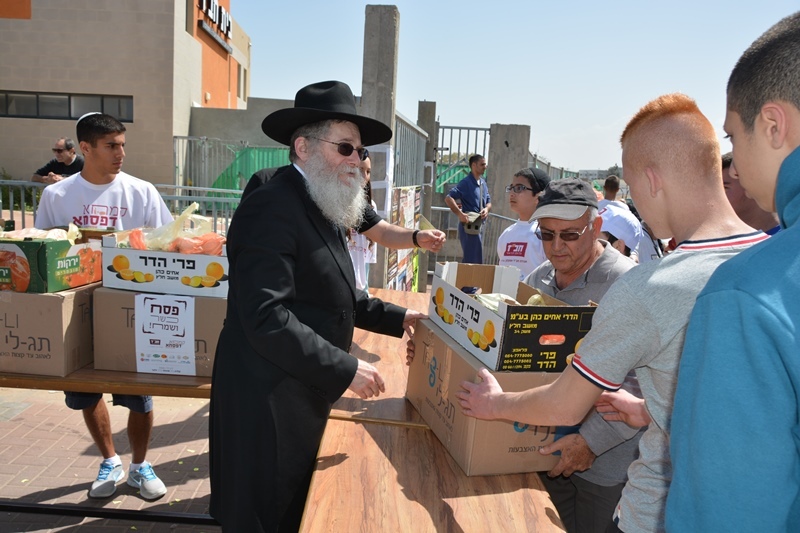 Ashkelon's needy don't have anywhere to buy clothes for Pesach! 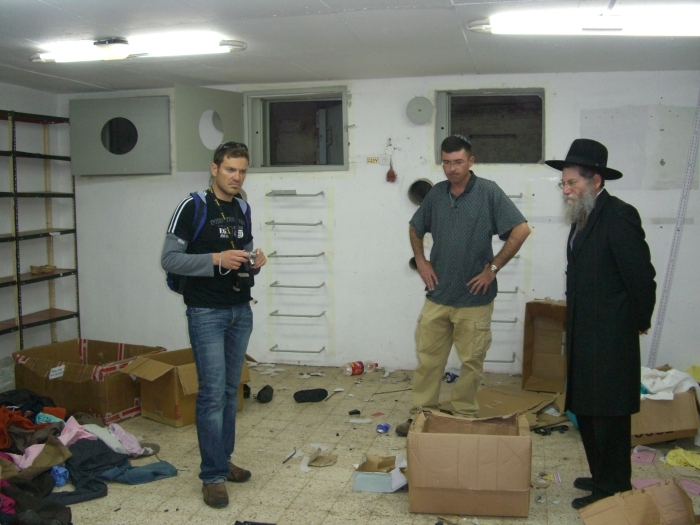 As a direct result of the security situation, when Mercaz HaChesed had to leave their doors unlocked, young vandals totally destroyed the clothing center. 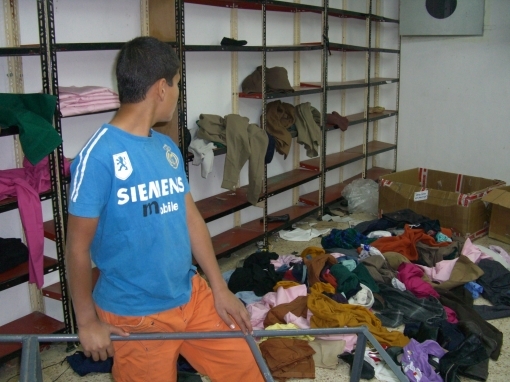 Everything of value was stolen, from clothing to shelving on the walls, the rest was thrown on the floor and destroyed. 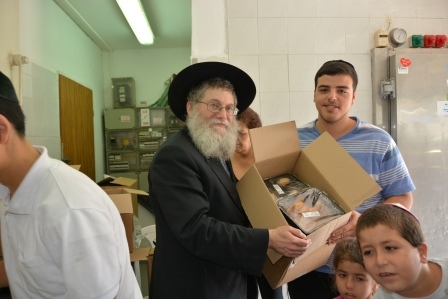 The needy from throughout the area come to Mercaz HaChesed to purchase shoes and clothing at symbolic prices, as well as to find a place that truly cares about them. 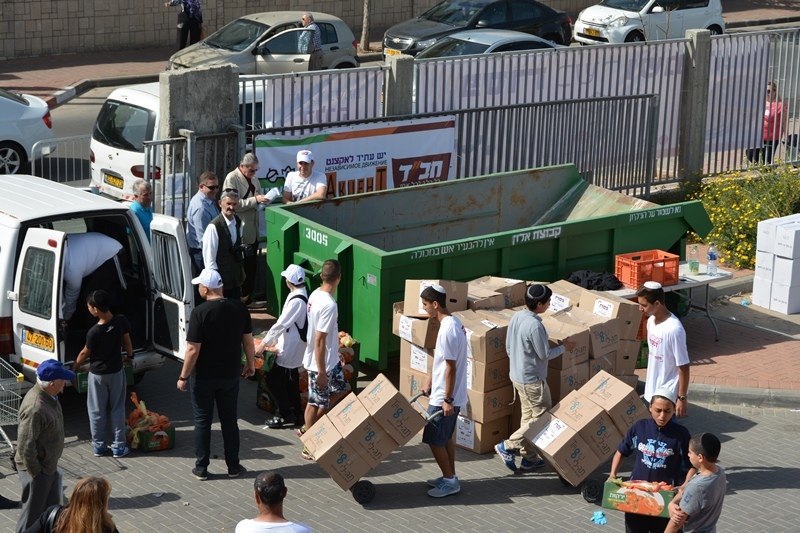 Now when they truly need something, before Passover, the needy are forced to return home empty handed. 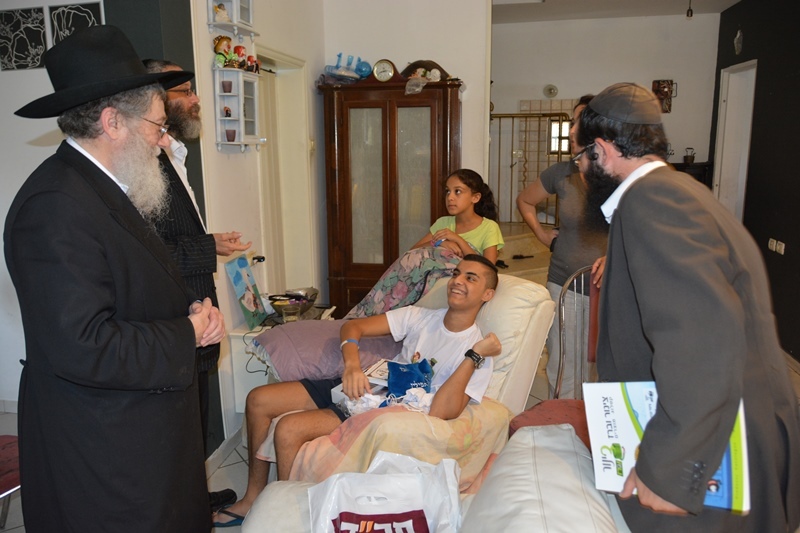 Representatives of Chai Ashkelon went to show support to families whose homes were damaged by rockets. 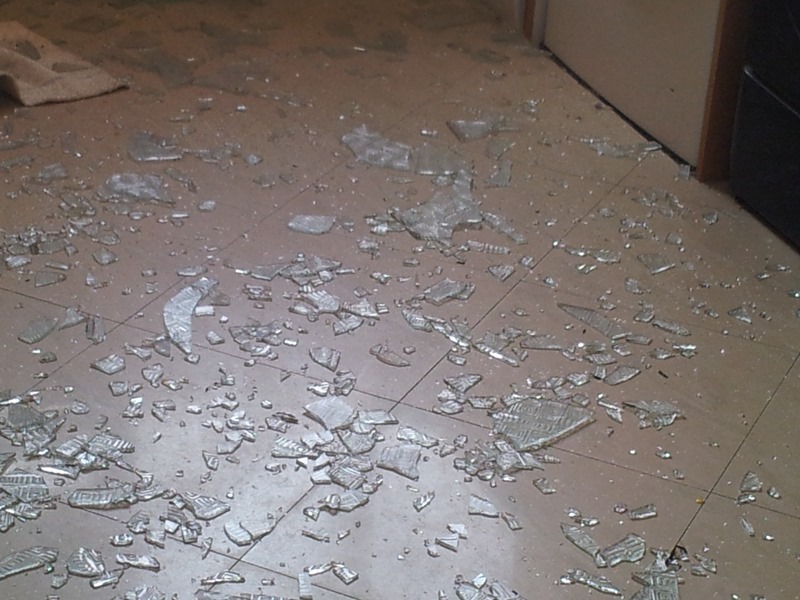 After the direct hit of the Grad rocket the residents of the building are still suffering increased levels of stress and trauma. 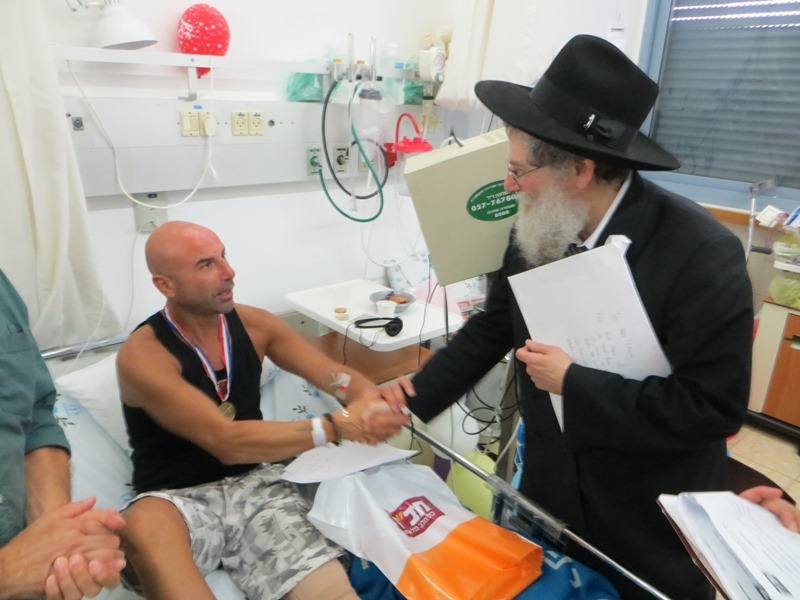 After seeing the representatives of Chai the residents immediately began to share not just about their stressful experience but also their miraculous escape from physical injury. After no small amount of encouragement from the Chai representatives, smiles began to return to their faces. 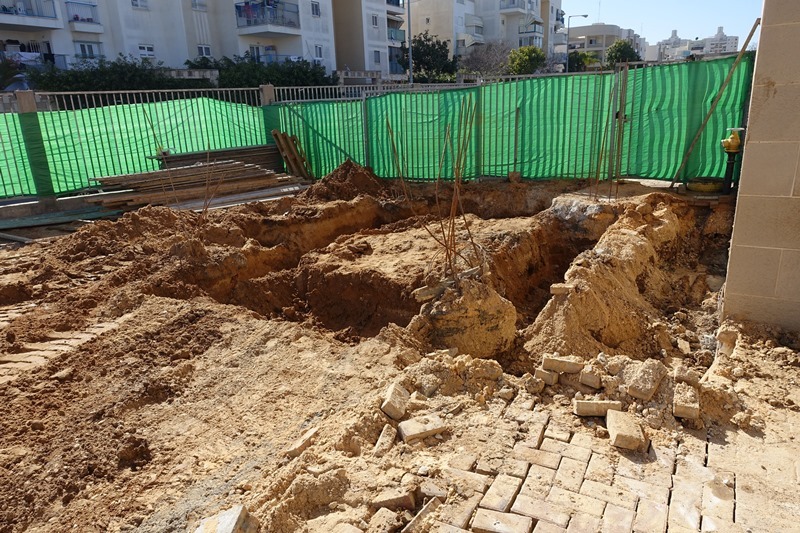 The rocket made a direct hit on the roof of a four storey building, destroying the top apartment and continuing down into the third floor apartment. Miraculously, neither of the apartments were occupied at the moment of impact, with one resident having left just moments before the impact to get her grandson from school. 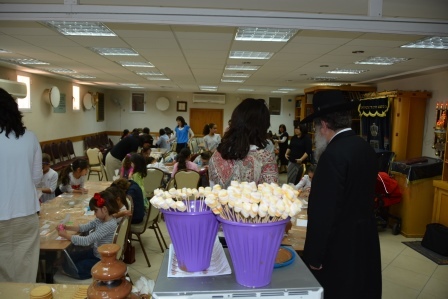 The Chesed Center of Chaiorganized an elegant Bar Mitzvah for 30 boys in the Or Chaya school hall. 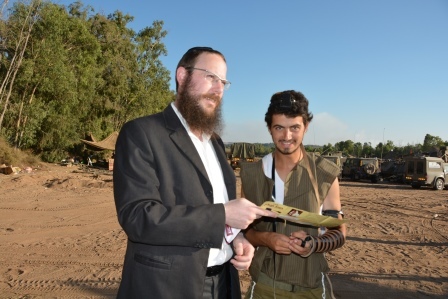 Each boy received a pair of tefillin, a watch and a tailored suit and gifts. 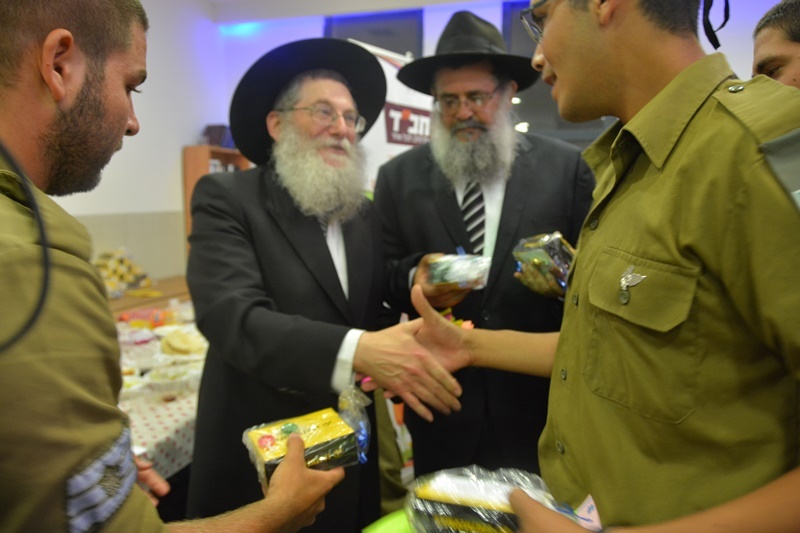 The evening was organized by Rabbi S. Ohayon, the director of the Chesed Center. 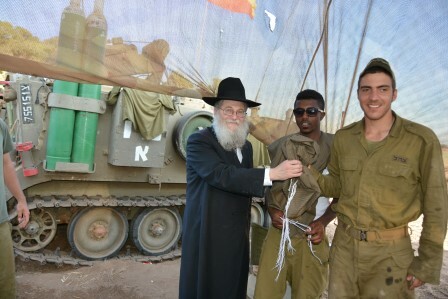 He succeeded in making it a unique event for the boys and their families. 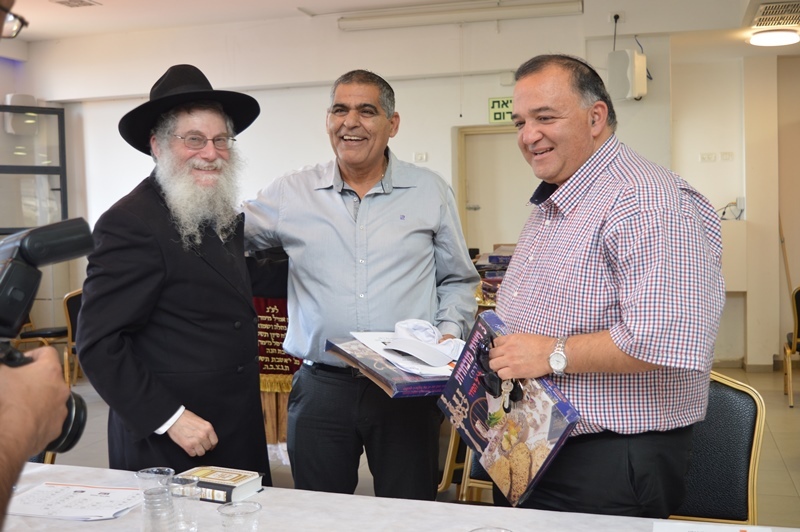 Among the guests attending were the chief Rabbis of Ashkelon, Knesset member Rabbi Porush, supporters and sponsors of the Chai Center, and other dignitaries of the city. 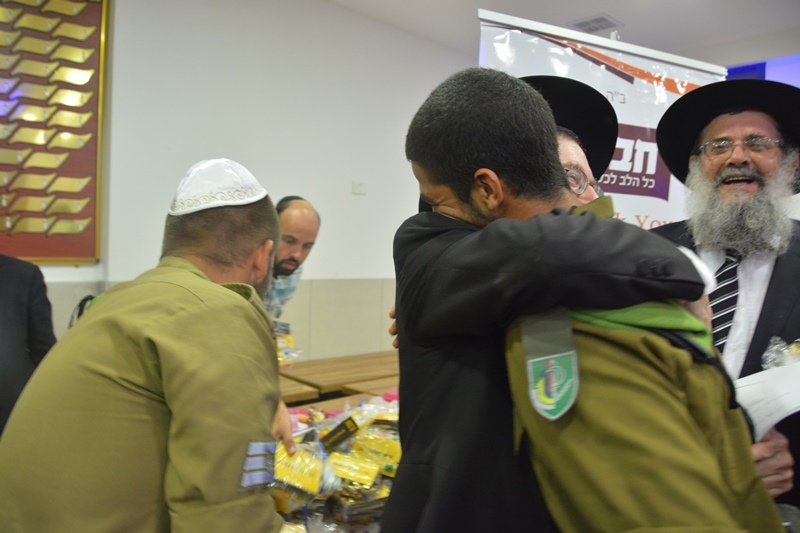 Shlomi Ganon,one of the boys, gave a very emotional speech thanking the organizers of the bar mitzvah on behalf of his mother and family, along with his pain that his father ob"m was not with them to celebrate this special day in his life. 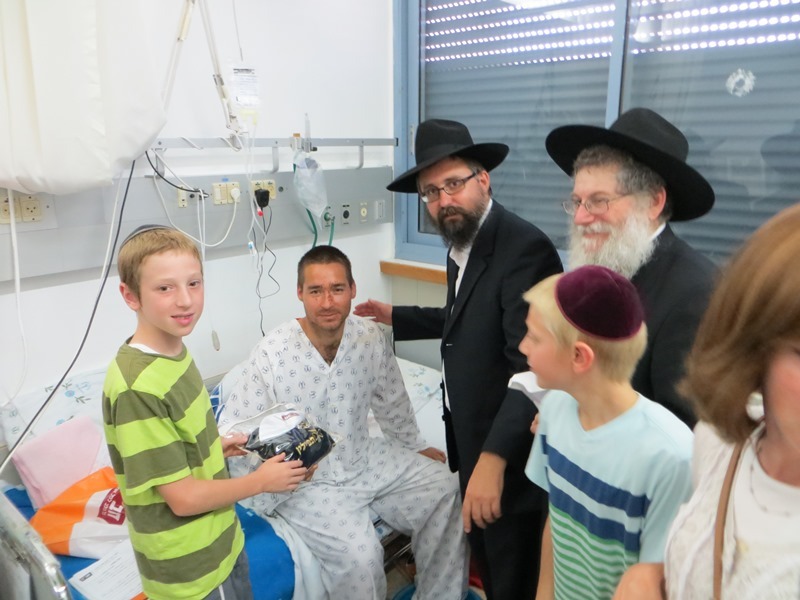 For many children this is the biggest celebration they will have for their Bar Mitzvah. Chai runs a weekly volunteer network of teens. 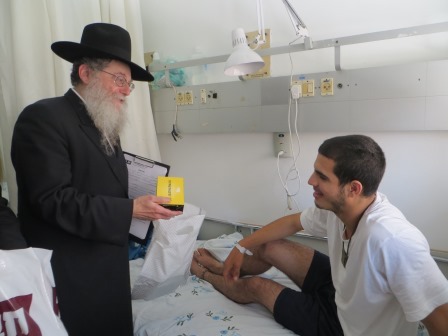 They visit old age homes, the children's class in the Barzilai hospital and special needs children as part of the Friendship Circle. 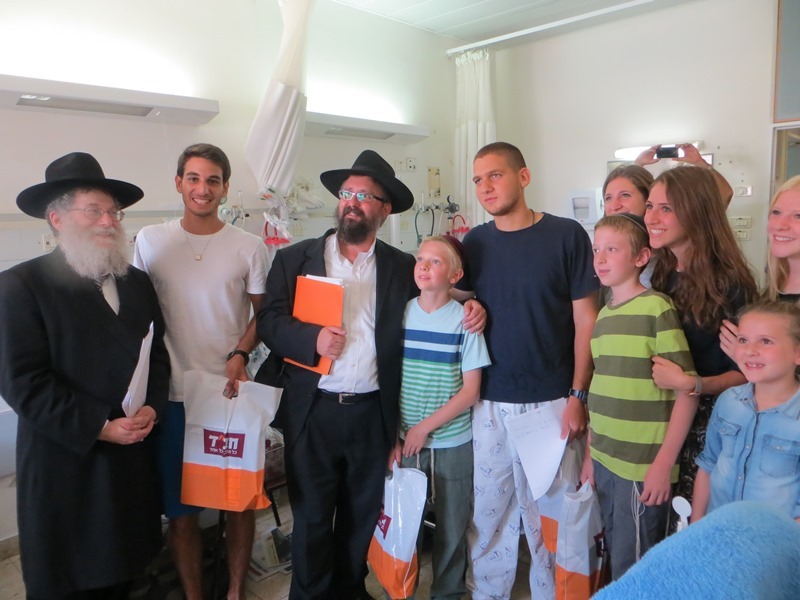 Pictured are students from the Or Chaya High School in the children's ward. 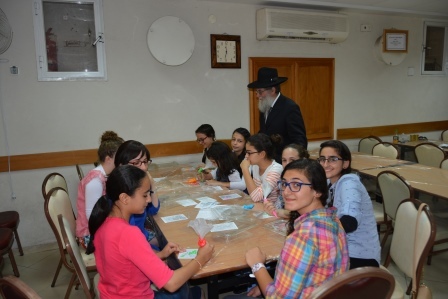 Students and their families were invited to take a break from the war and spend a day in Kfar Chabad. 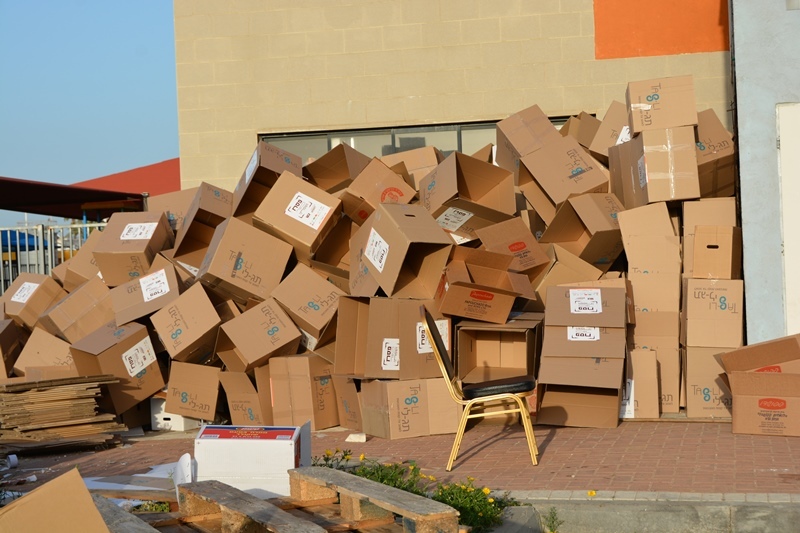 The turnout was much greater than expected. 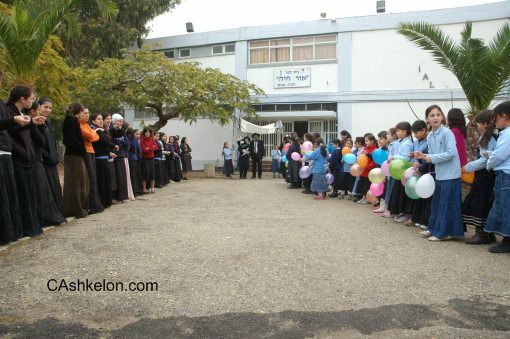 The children and their parents were happy to be in the fresh air without fear of falling rockets. 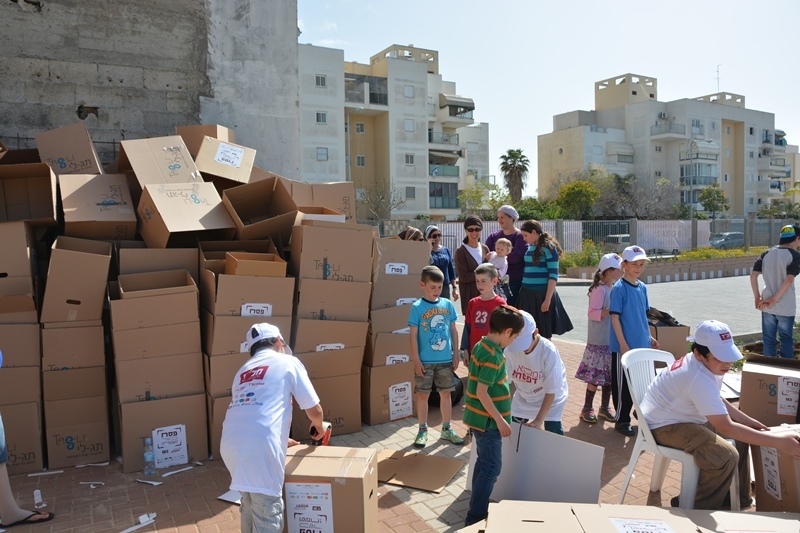 A few little children asked the organizers "Are you sure there are no rockets and we can play outside?" 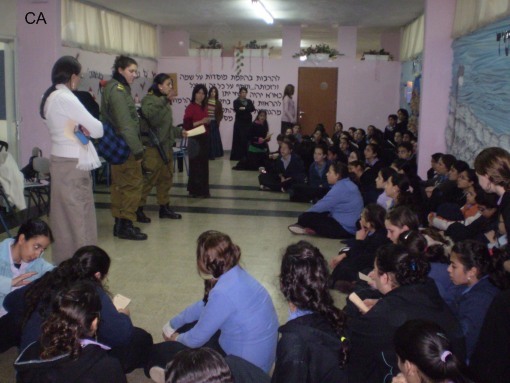 The activities included games, a magician,contests and a lunch. 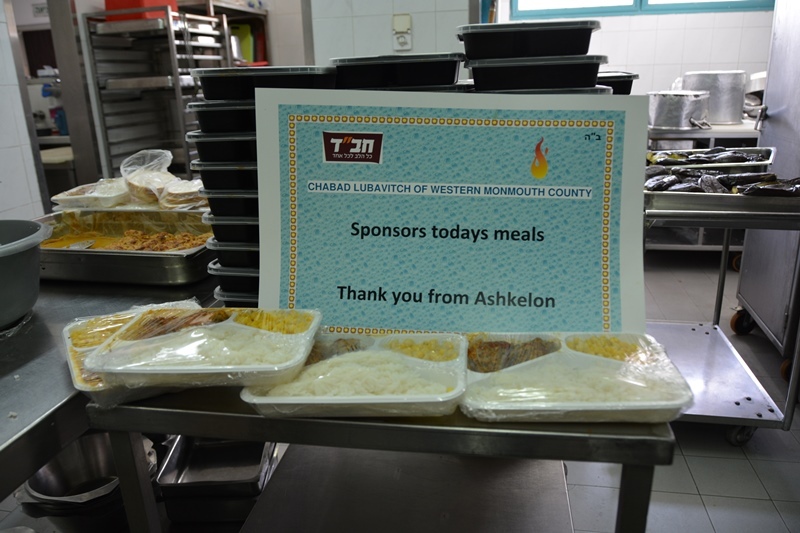 Chai of Ashkelon thank the municipality if Emek Lod for sponsoring the program. 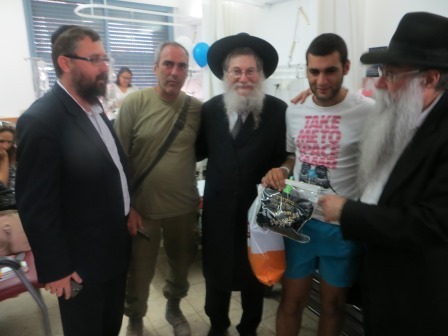 Members of Chai of Ashkelon are visiting all the bomb shelters. The picture that emerges is a difficult one. 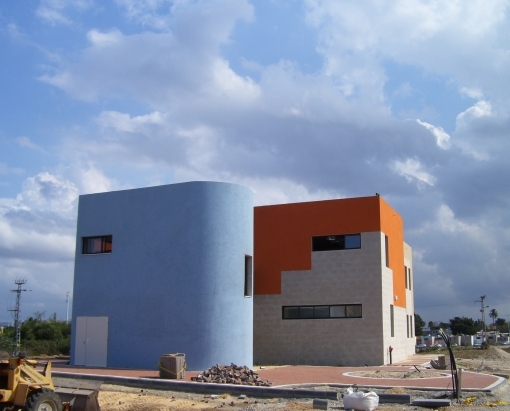 Many shelters are located in poor neighborhoods. 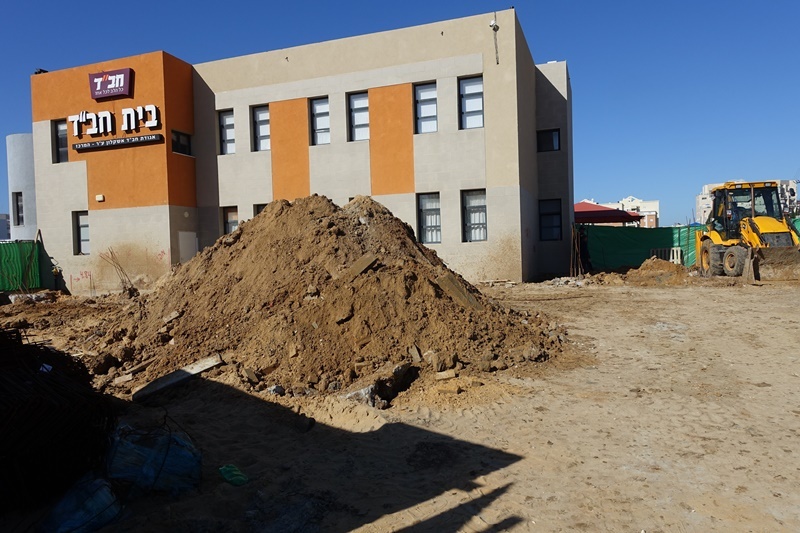 There is a lack of basic supplies, food, heaters and blankets. 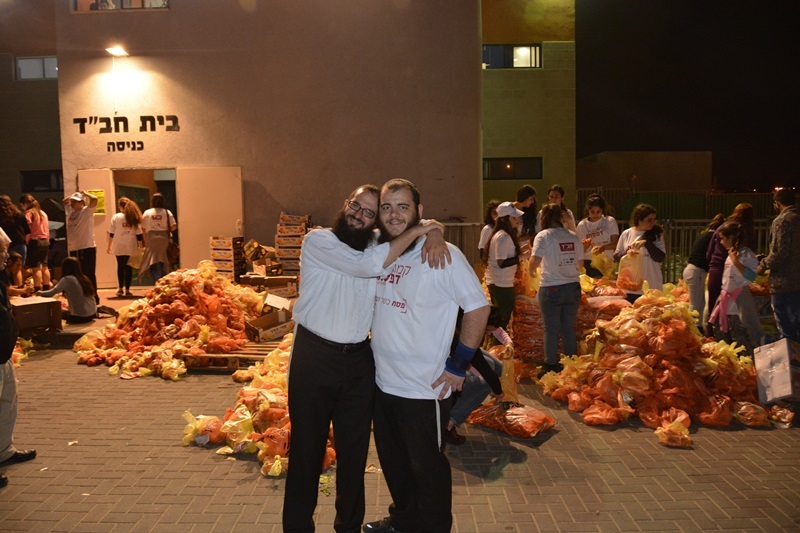 Rabbi Lieberman, executive director of Chai Ashkelon calls upon you to help. Your assistance is vital for people in distress. 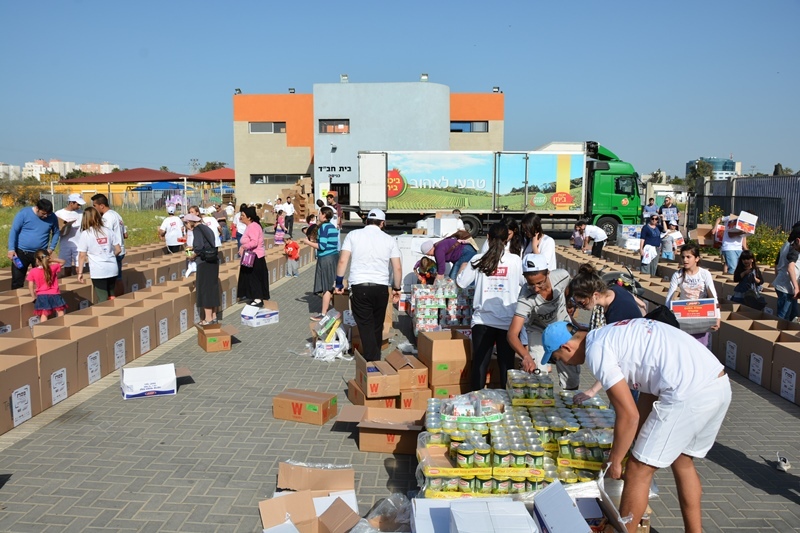 Supplies needed are food that does not need refrigeration, toasters, hot plates, radiators, books, games and more.